Join us May 13th for our Fishers debut! As the sun slowly starts to win out against the resiliency of this long winter, I have been eager to get behind any and all events held outside. 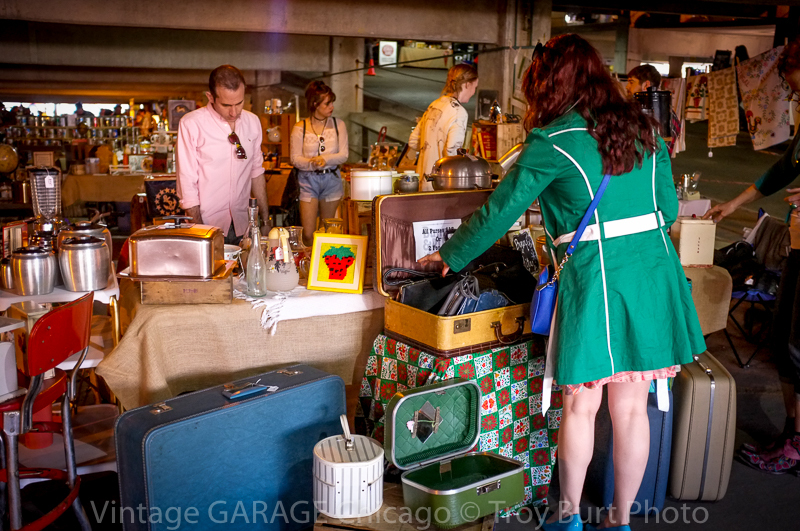 This, coupled with my love for anything vintage and local artisan products, makes me beyond excited to reiterate the announcement of Indie Vintage Marketplace’s latest event. 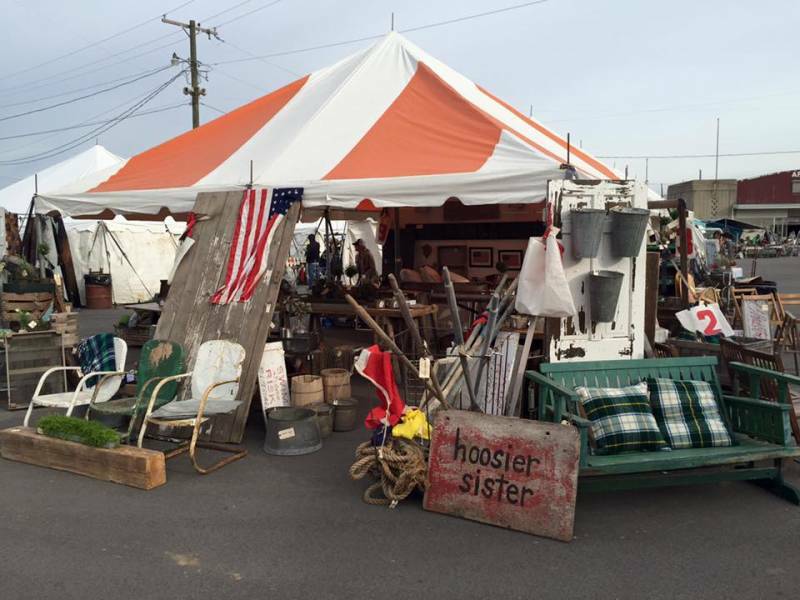 As the opener and kick off event to a long outdoor show season, IVM’s May 13th event will be located at Grace Church’s sprawling parking lot from 10 a.m.- 5 p.m.
Often overshadowed by the mini-metropolitan oasis that Carmel is, Fishers is actually a hidden gem within Hamilton County. Somehow both a stable and progressive community, Fishers is a growing city that still retains its hometown feel. Truly, it is the best place to hold the first outdoor market of the year…it will remind you of the format of the monthly markets held at the Ritz Charles yet it will be new enough to spark a different type of experience. Imagine this: whether you have had a fast-paced or lazy Saturday afternoon, all other preoccupations melt away as you park and start to head towards the multitudes of booths and tables lined up against the greenery. The air is warm and the sun is taking its time to descend, casting an orange, glucose color across the sky. You first follow your nose and then your stomach to the row of food trucks, quite literally giving you a taste of summertime soon to come. 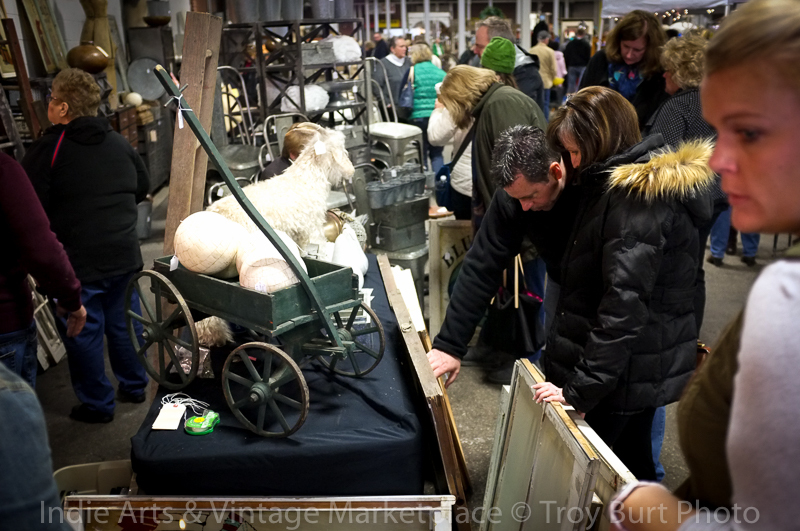 You then peruse along the columns of vendors–as great and diverse and friendly as they come–taking your time to carefully inspect the eclectic and high-quality products made from different eras or areas. Maybe you arrived on a mission to find a certain item. Maybe you are just waiting for that piece to jump out at you. Whichever, you’re successful. Bags in hand, you make conversation with the person behind the counter. You run into a few neighbors and friends. All in all, you are surprised with how the whole community seems to show up to throw in its support. And then, you head over to the source of sound that has kept your head bopping and your feet tapping for the past couple hours. Standing and singing along to all the familiar tunes, you and the band members alike are showing no signs of slowing. Personally, I can’t think of a better way to spend a Saturday night. If you are a vintage enthusiast, come! If you are looking for a new way to redecorate your home or wardrobe, come! 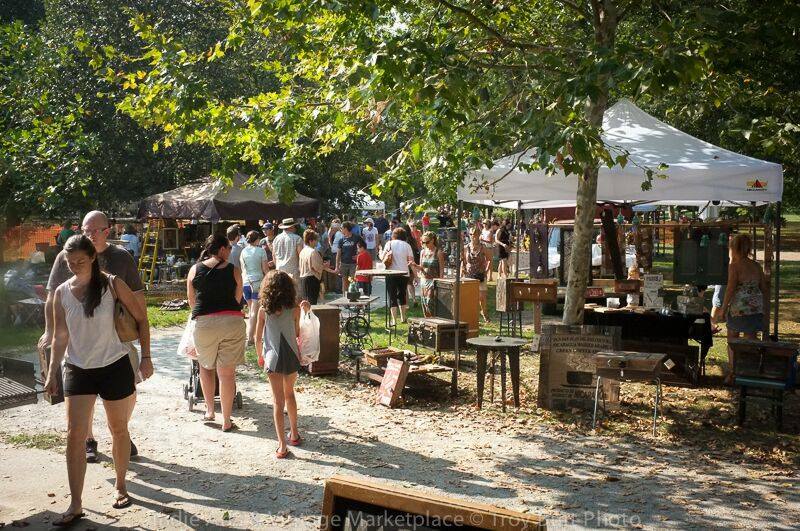 If you are trying to find a way to support your local artisans and business owners, come! If you are going crazy with cabin fever, come! If you are just plain hungry or simply wanting to listen to some great live music, come! Hope to see you there! As the warmer temperatures begin to thaw out our frozen motivation, there is no better time to participate in the newness that spring promises. We are outside again and everything feels fresh and green… at least, that is the goal anyway. As I am in the process of finding a new approach to the season, I was lucky enough to stumble upon Jess Parrotte. The owner of not one but two businesses, Parrotte centers her businesses on the concept of revival. 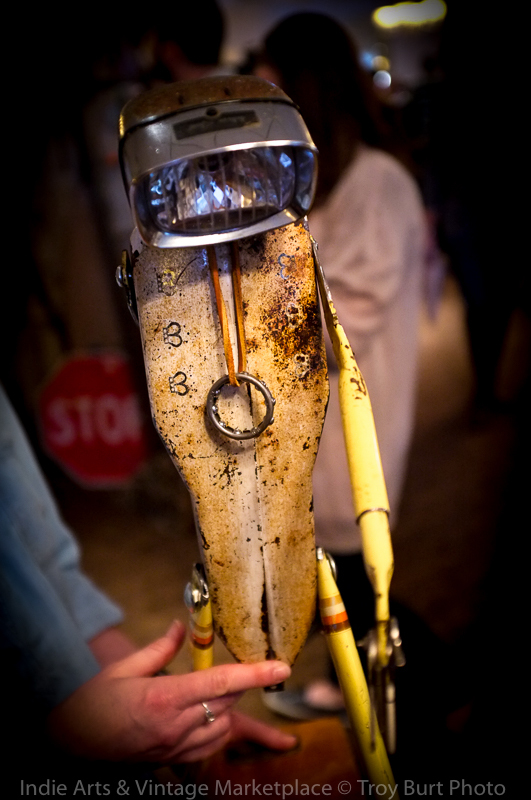 She started collecting at a young age, finding eclectic items and widgets to patch up and create a new use for. Nowadays, she singlehandedly runs two vintage stores as an outlet for herself, but blessing us customers with a modern, cool look at vintage clothing and decorations. 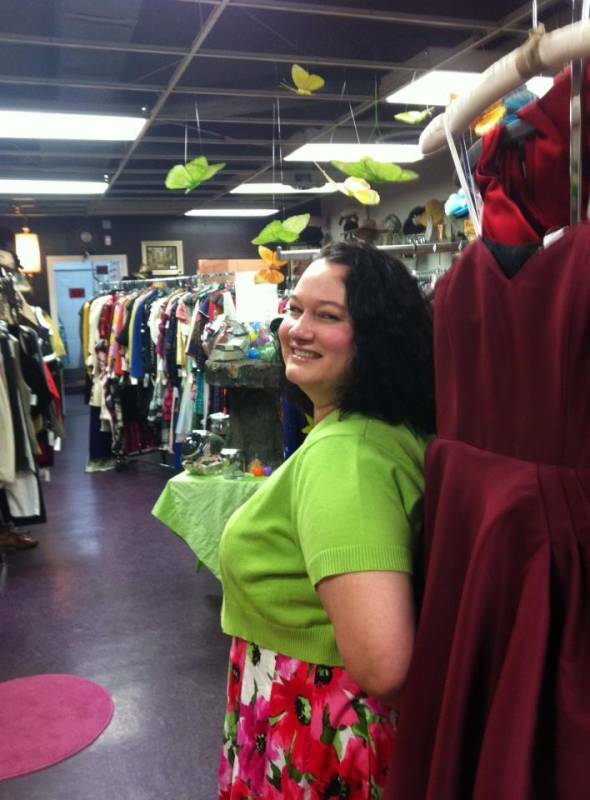 It is no surprise then that her first business is called 9 Lives Vintage. 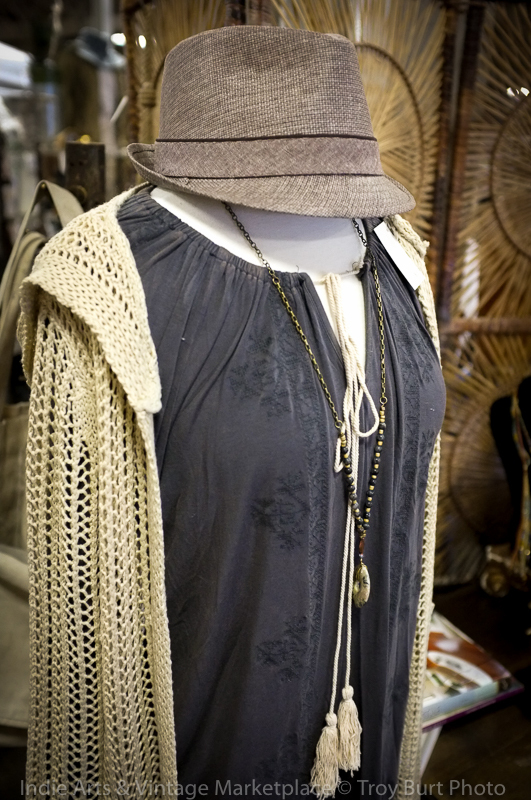 Mostly specializing in clothing and textiles, Parrotte’s goal is to bring back the fun into fashion. 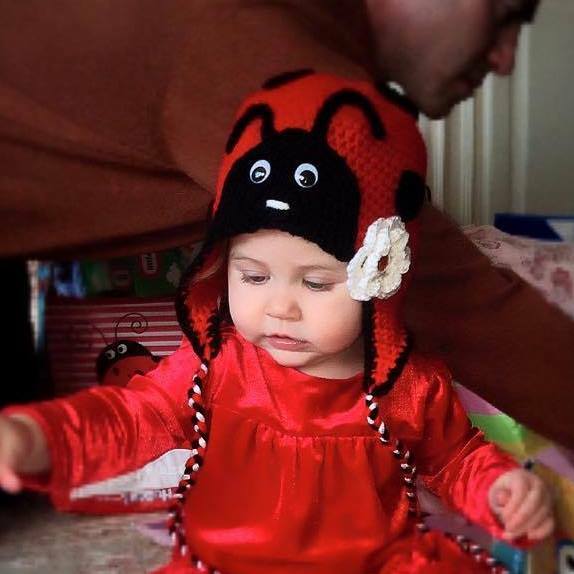 She firmly believes that we have sucked energy out of the styles and threads we wear. Her collections counter that by offering funky alternatives aimed to reach people from all ages and from all walks of life. 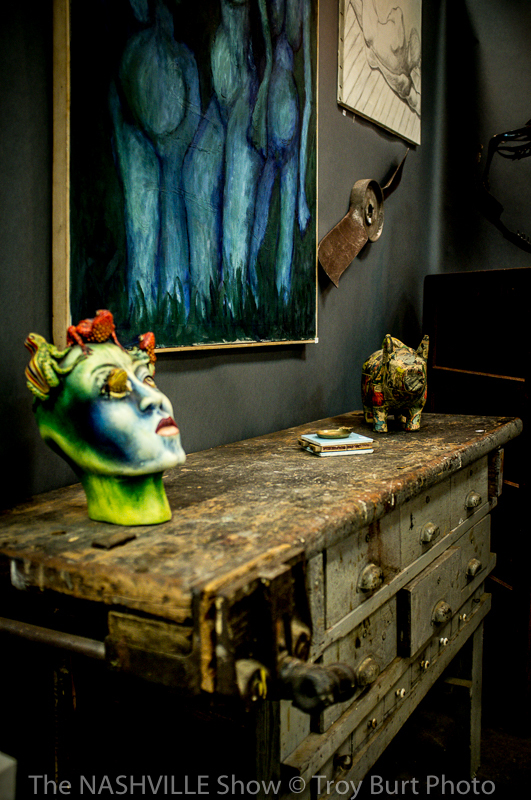 As she cultivates her collections, she pays special attention to unique textures and patterns that may first have been overlooked. For Parrotte, anything goes. Her knack for pulling together a blend of looks from different decades and surprising patterns into one perfect outfit is what makes customers like me so enthralled with her store. Customers are not afraid to limit themselves in what they can wear for everything is, quite literally, out on the table. 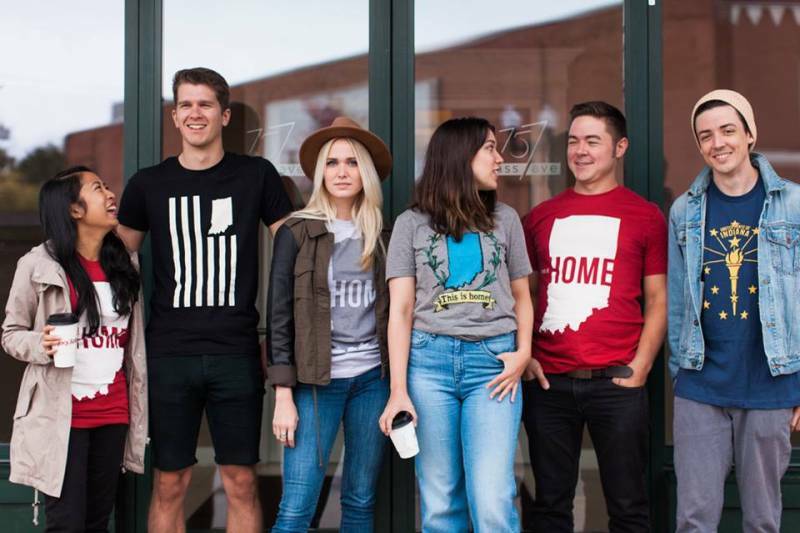 9 Lives Vintage’s sister business is Hoosier Planter. Here, Parrotte weaves the overarching theme of revival by reconstructing the concept of what planters should look like. 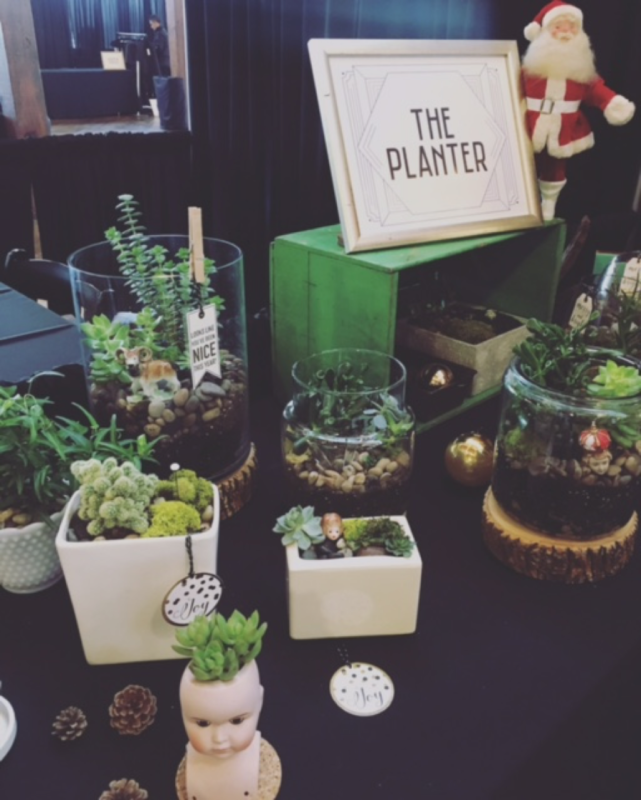 Creating terrariums out of things people would not think to use, she is branching out from traditional planting styles and has taken an out of the box approach to succulent growing. For those of us who are impatiently eager about spring arriving, these unique terrariums provide an enjoyable way to activate our green thumbs early within the house. With items people would never imagine as containers, Parrotte has used everything from giant ceramic foot for a bonsai tree to shelled-out craniums of baby doll heads for succulents. 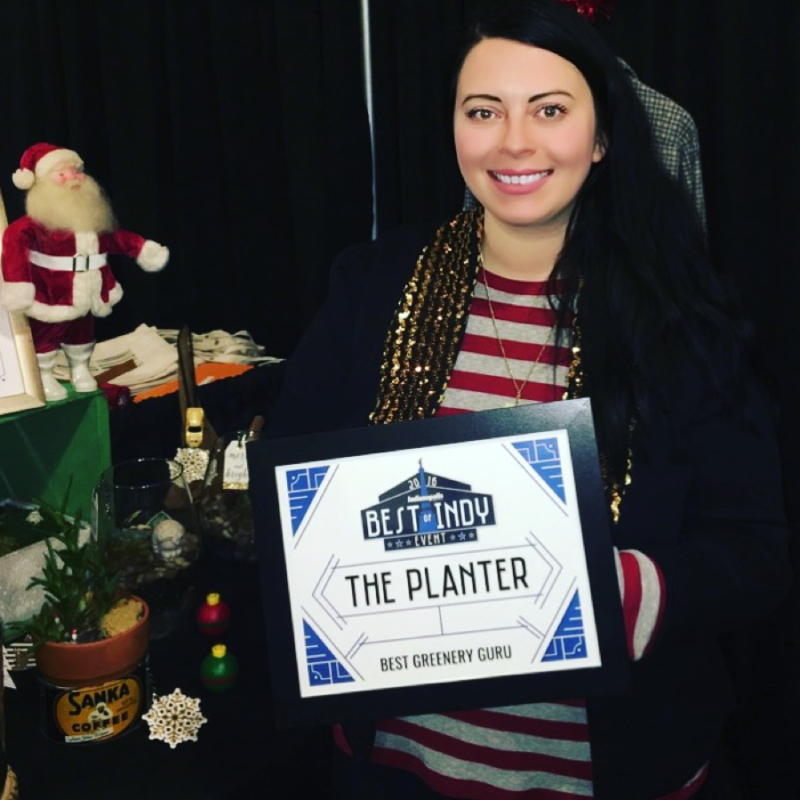 Her planters are even so popular that after being identified as one of Indy’s best in hospitality services, she won the 26th Rose award for recognition in service excellence AND was awarded in Indianapolis Monthly’s Best of Indy December edition…I am not sure anyone else can say that! 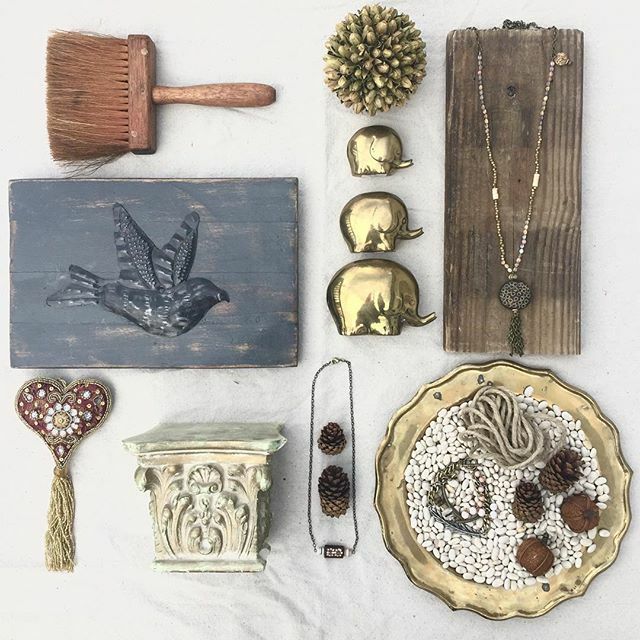 Jess Parrotte will be alongside other fascinatingly creative vendors showcasing their collections at Indie Vintage Marketplace for us all to peruse among on March 25th from 10-5 at the Indiana State Fairgrounds! 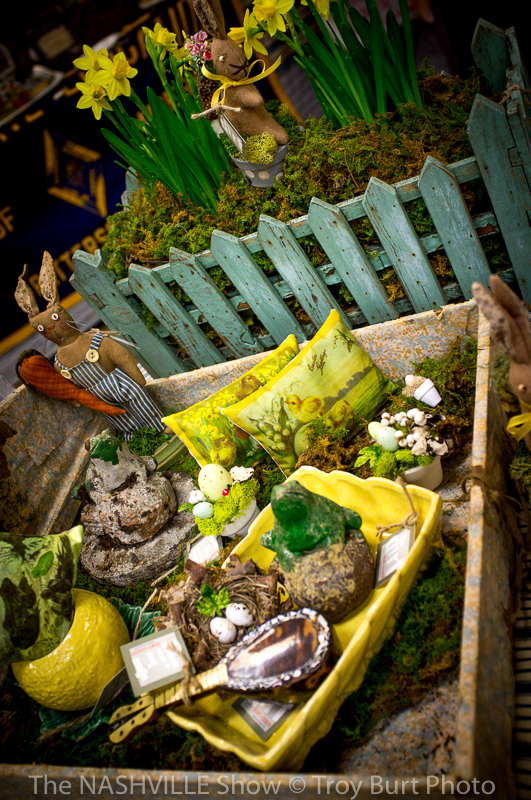 Make a beeline for her booth and get your springtime blooming! As I have been trying to redecorate my home these past couple of months, my pursuit of one of a kind, great quality home décor is often thwarted by the rapid influx of mass produced, unadorned, simplistic furniture that seems to practically flying out of factories and into national chain stores by the minute. I was looking for a way to design my house in a style completely my own, that wouldn’t cause me to constantly be rotating out items due to a lack of quality. 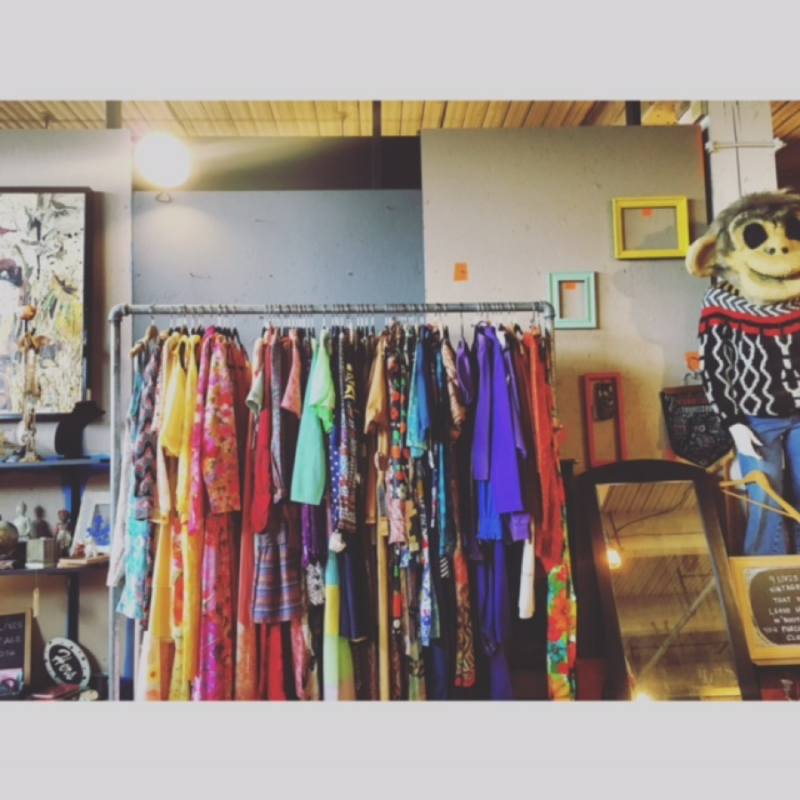 I was dismayed…and then I found Bella Vintage Home. 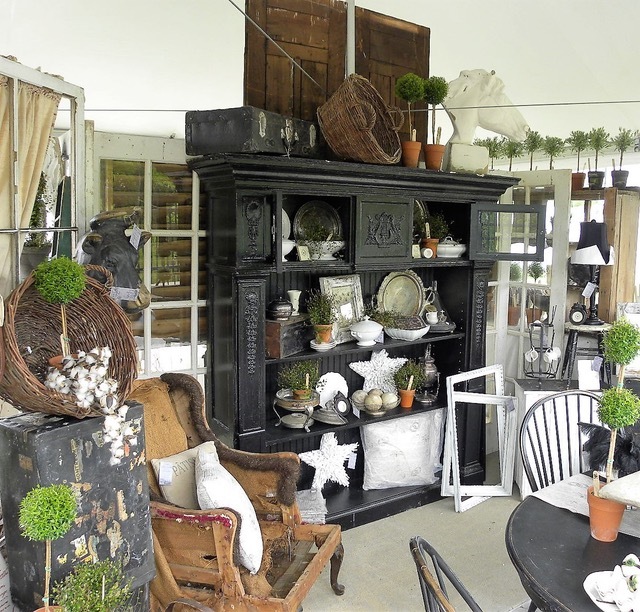 Bella Vintage Home understands the need that customers are currently facing and responds by finding, restoring, and selling practical yet beautiful pieces that can stand the test of time. What makes a furniture piece timeless? What about its structure turns a simple table into the hub of family life, engrained with memories throughout the years? 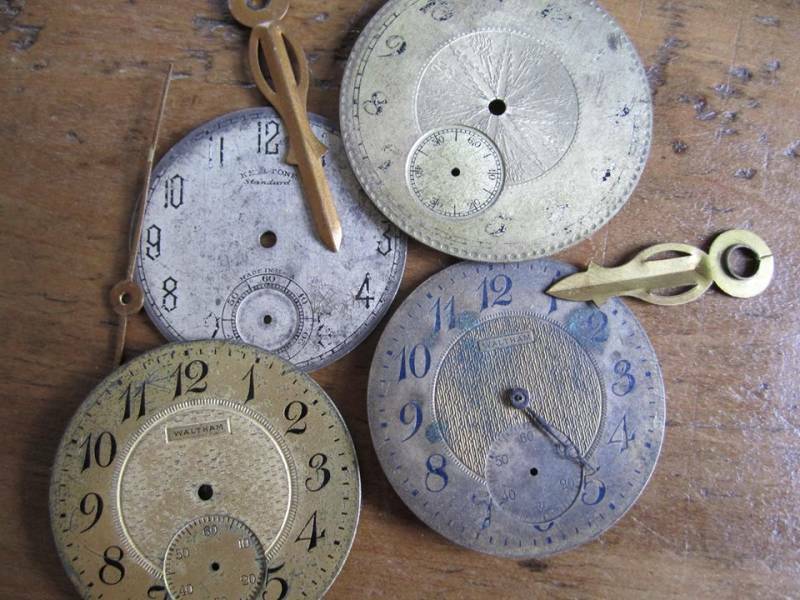 How can one accurately look past the scratches or stains and guarantee that it will last 20 years, and not two? These are exactly the type of questions that drive the dynamic duo behind Bella Vintage Home. 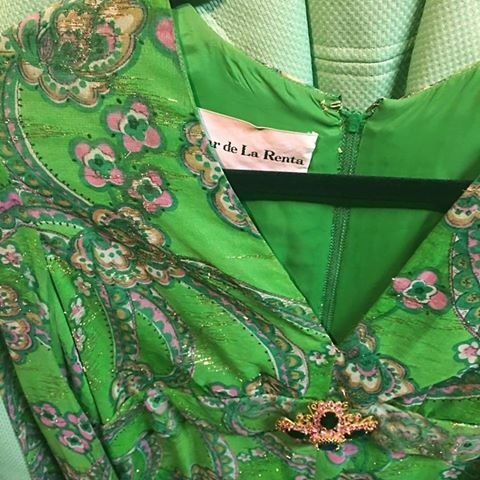 Kathy and her husband have been in the vintage business for more than 40 years…they center their collections around the idea of longevity. At Bella Vintage Home, old-fashioned and quality products are the norm and gone are the mass produced items with characteristics such as veneers over compressed fiberboards. Whatever you purchase, you can rest assured that it was made by a master of their craft. 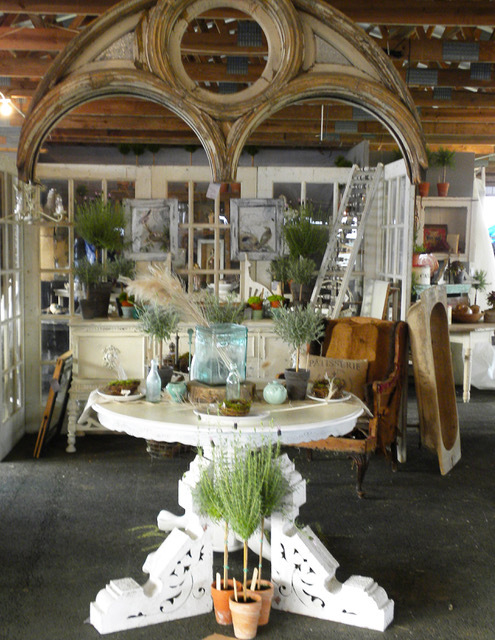 Bella Vintage Home is characteristized by three main collections: Vintage Art, Urban Cottage, and Season by Season. 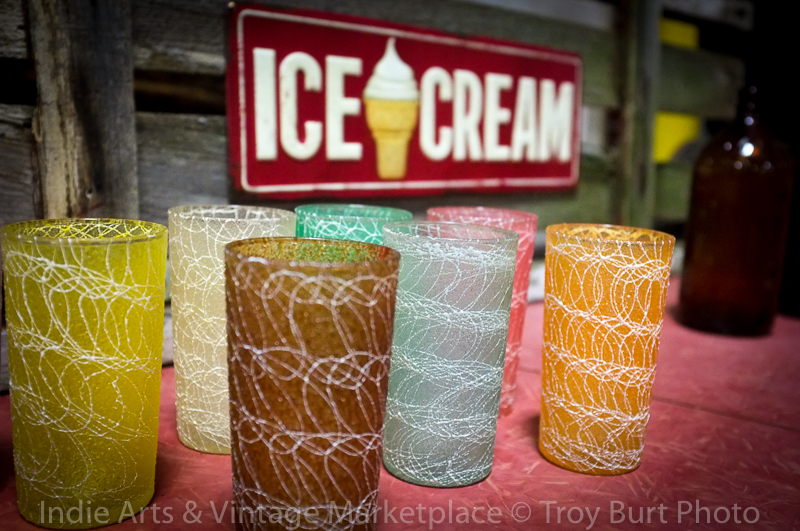 The Vintage Art collection is the fastest growing collection they offer and is handcrafted entirely by Kathy. Inspired by old postcards and journals, she creates print based off of vintage prints and art that can be placed on pillows, tea towels, or notecards. The Urban Cottage is the home décor collection mixed with items she has either made or refurbished—all revolving around the theme of “farmhouse flair”. 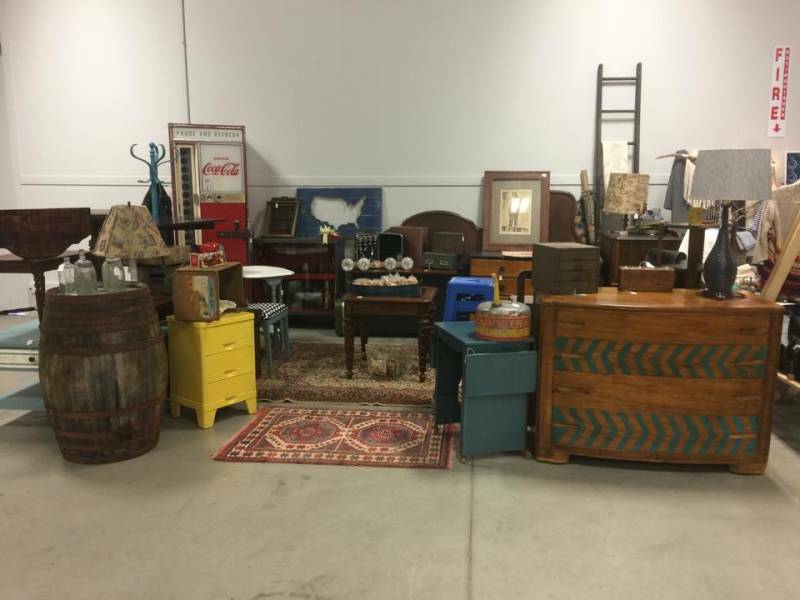 Bella Vintage Home will be alongside other unique vendors, showcasing their collections at Indie Vintage Marketplace on January 29th from 10-5 at the Ritz Charles in Carmel! When asked about the specifics they will be carrying in their collection at the show, Kathy responded with, “A FABOULOUS, hard to find Harvest table, a number of unique, great quality architecture pieces, a continuation of the Urban Cottage Collection and the Vintage Art collection, and then some other [chance] pieces like plate leaded glass windows! 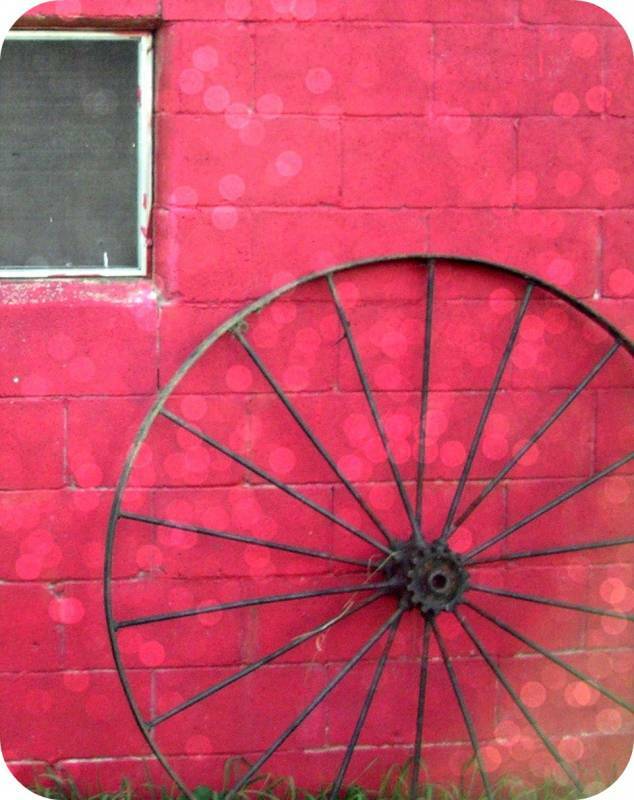 It is the New Year—a fresh start—and you are sorely in need of a change. 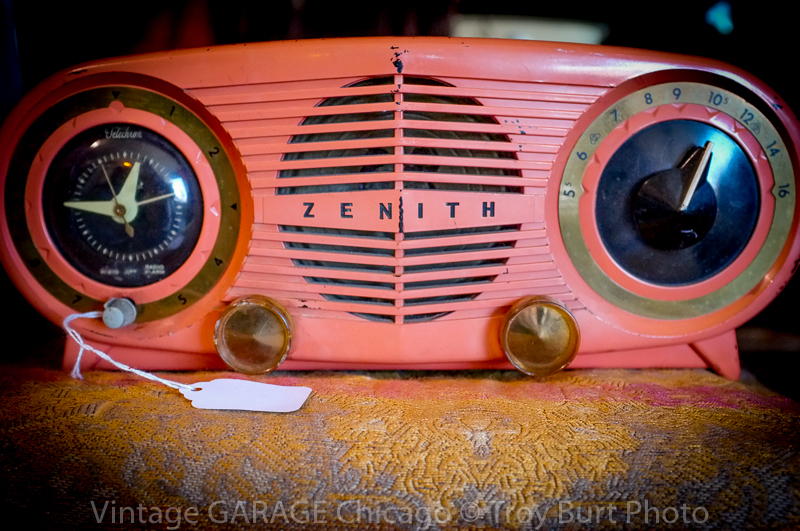 You scour countless magazines in search of ideas but nothing seems to unify your newfound love of all things vintage. 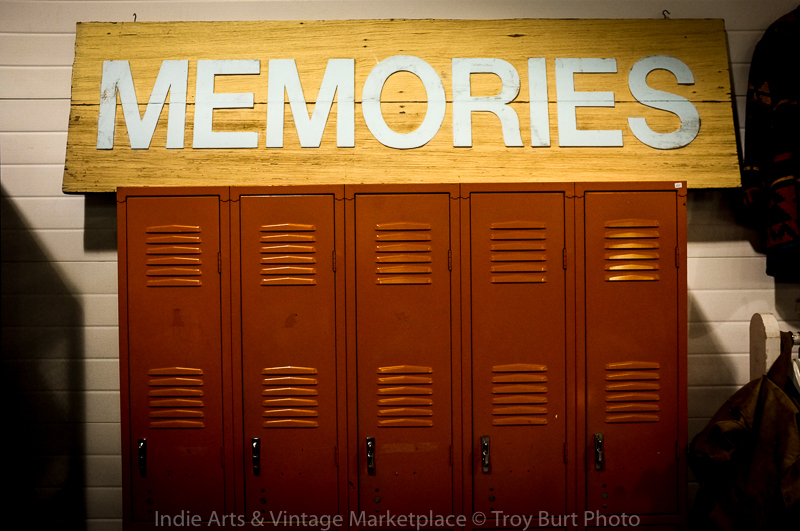 Nothing that is, until you stumble upon Indie Arts & Vintage Marketplace. 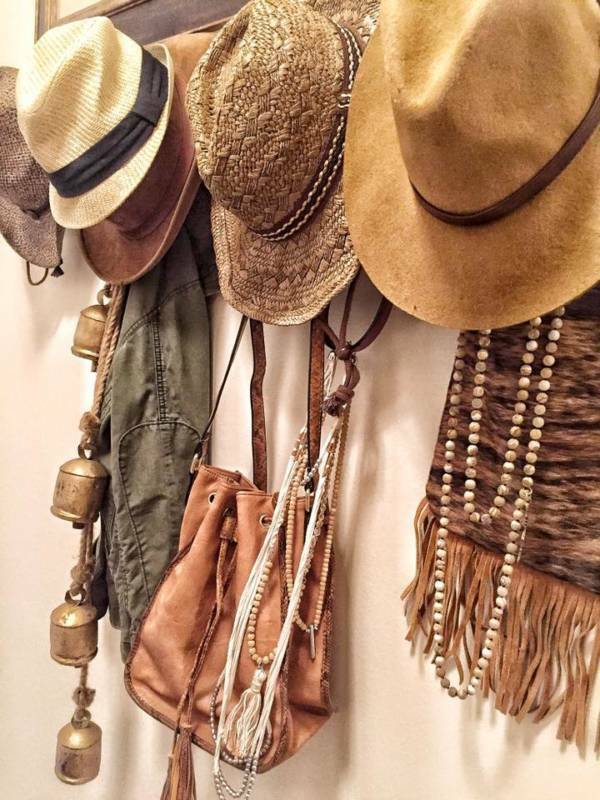 As homeowners whose lives are often packed, it can be very easy to fall prey to “instant designing” our home and closets even when we desire to incorporate vintage and upcycled pieces. It simply can just be more convenient. 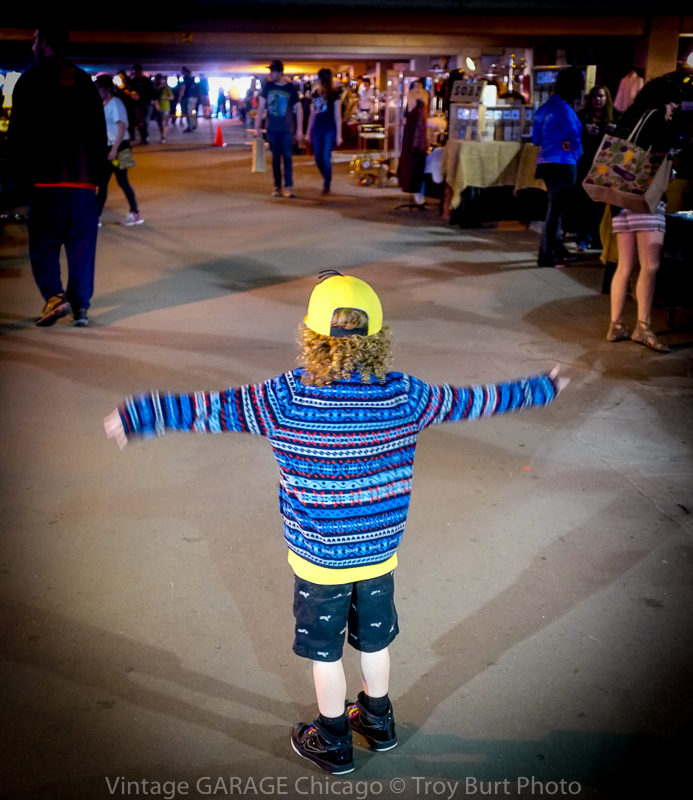 For most people, going to shows like the Indie Arts and Vintage Market requires travelling a great distance far from home. How amazing is it that here in Central Indiana, we are fortunate enough to have a top notch show once a month right in our backyard! Not many people can say that! 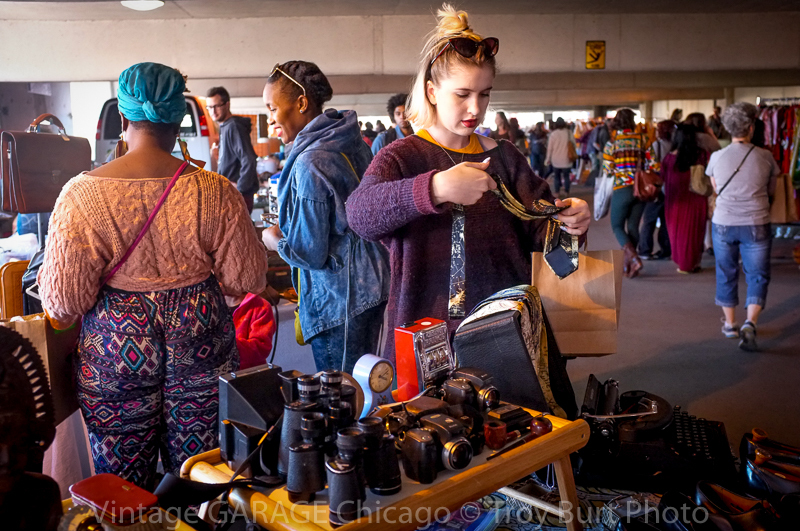 We at Indie Arts & Vintage Marketplace want you to be familiar with your vendors and each of their unique stories and business. 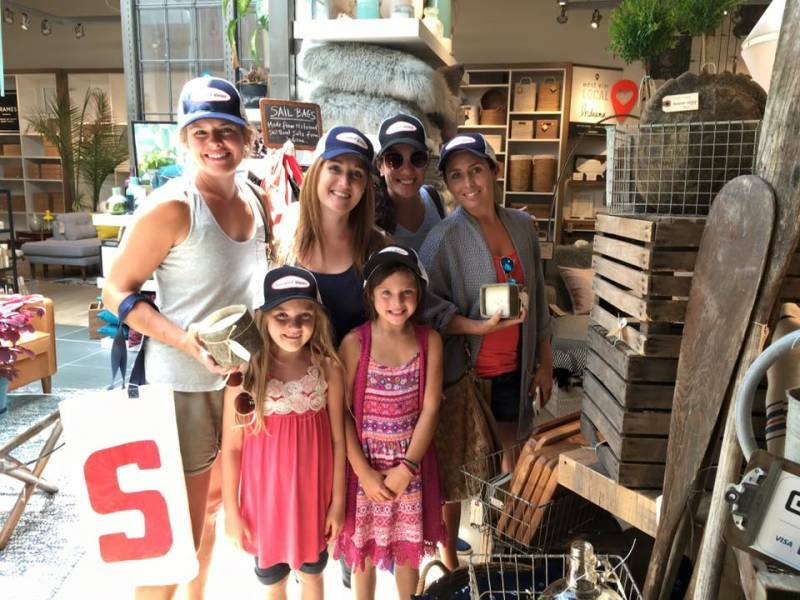 Our first featured business of the week is Jackie Shambora of Studio Shambora. 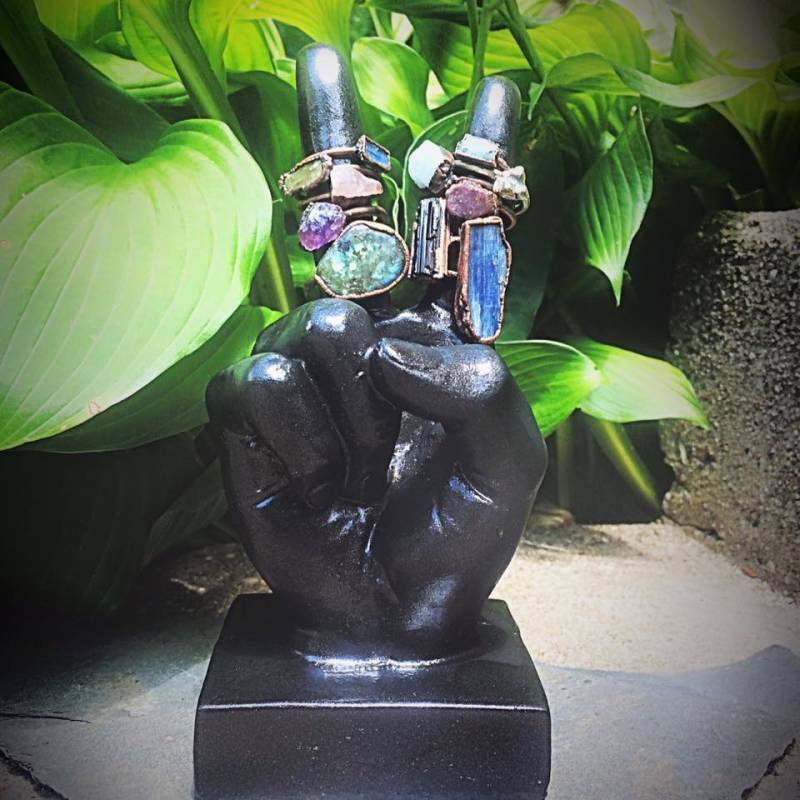 Jackie has made it her mission to get her customers to stop, as she puts it, “cataloguing their lives.” Whether it is home decor, clothing, or jewelry, Studio Shambora is a brilliant resource focused on helping buyers shift towards individualistic creativity. For Jackie, Studio Shambora is about the process of “the hunt for the perfect item”; it is the process of waiting for that piece to practically jump out at you. Shambora is ardent that the best part of shopping at these shows and at her business is that it is guaranteed to be unique. 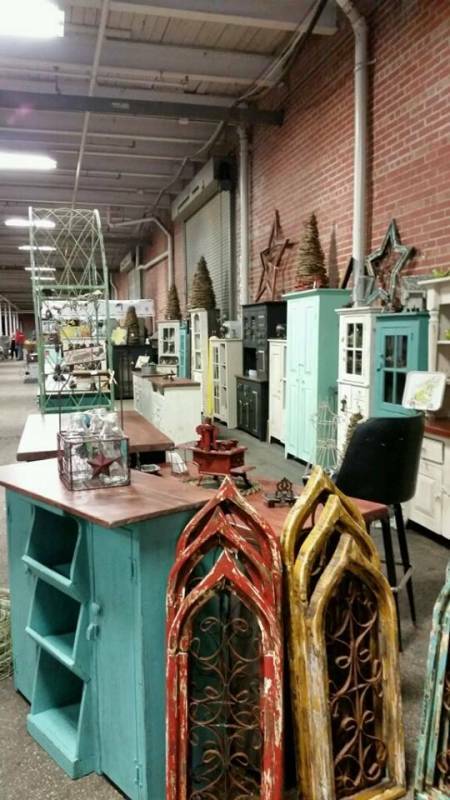 She wants customers to realize right away that “you cannot find an exact replica at Hobby Lobby!” She herself shops in preparation for shows like our Indie Vintage Mart by this rule…it has to be just right for her customers! Her main focus for her business however, is to be a lifestyle store for everyone 16-60 and her attention to “genuine, effortless, and longevity-driven collections” proves this. With Studio Shambora’s special concentration on the diversity of nature, Jackie believes she can hit any type of customer. By putting out collections filled with rich tones, natural colors and staying away from shiny and waxy materials and artificial coloring, Studio Shambora aims to emulate the simple and meaningful way people actually live. As the New Year is upon us once again, Jackie is resolved in her belief that this is the best time of year to stop back, revise, and gain better perspective of our homes and closets…both as vendors and buyers. Studio Shambora in the future will be focusing even more on artisan, organic and upcycled collections with a greater focus on promoting her business as a Lifestyle Brand that includes vintage clothing and handmade jewelry as well. She predicts that a pop up shop and personal clothing line and rebooted online site are in her future! Whatever transpires, we can expect to be amazed. I am so excited that Studio Shambora, along with a countless amount of fascinating vendors, will be at Indie Vintage Mart on January 29th from 10-5 at the Ritz Charles in Carmel! 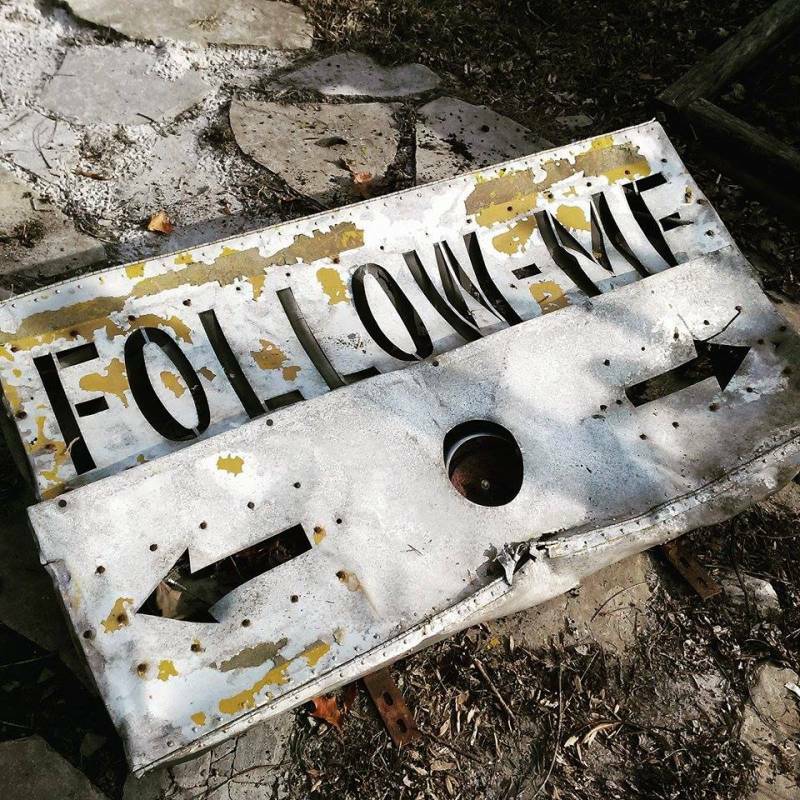 Keep following so you can be updated week to week on some of your favorite vendors and the events. Where it began, I can’t begin to knowing, but then I know it’s growing strong…Sweet Caroline good times never seemed so good, and so it went, “Sweet Caroline” came to the lips of anyone within range, loading or still shopping at the end of the July show in Broad Ripple Park. I had to pause and point it out to my neighbor. We both smiled and laughed and sang on! It was a sign that this had been one of the best shows all summer and that morale was high because of it. Vendors know this and customers probably get a sense of it, but by midsummer the show circuit slows down. Spring we get a huge boost because everyone’s tired of the cold and ready to get out and shop. Fall kicks in the nesting spirit as we all get ready to settle down for a long winter, harvest comes, weather is usually cooperative, but midsummer, it’s a little yucky. Hot, sticky, mosquitoes, farmer tans, every year I try to figure a way out of it. “How can we do this without succumbing to the elements of mid-stinking-summer?” Well, I guess it takes a special mad genius because our friendly area neighborhood event promoter pulled it off, unmasked no less. The show circuit has been great overall. The early summer weather was nothing less than perfect (except one unfortunately timed rain storm). I would have paid at least two Internet dollars for the weather we’ve been having (if I could)! People seem to be buying more than last year and for the most part for everyone I know sales are up. But, just up until that July show things had started to take a dip. Which we knew was coming. Low and behold the mad genius I seem to lack was founded deeply is this man! If you were not there, this is how it went, and after that, I’m only predicting what’s to come. But, let’s just say morale is high and a lot more, new customers know about what’s happening in Broad Ripple Park. Vendor appreciation. A term that sparks as much if not more excitement than that other three letter “S” word. Vendor appreciation. I just felt my ankles quiver. In the heat of the summer when times are toughest for vendors a single good doing evil genius had the stoke of sense to defeat the great problem facing vendors, which greatly affects the customer and whole thing. He provided a whole slew of benefits and amenities that allowed my prices to be cheaper and I sold a ton more. In fact, quality was compromised in no way. My booth was larger and I sold some of my best and highest priced stuff. Stuff that I had for years. I was udderly amazed to say the least and I’m not even a cow. What happened that day was a serious moment of wow (not cow). To the point that us tired, worn vendors were loading out on our tip toes while singing a perfectly timed Neil Diamond song. And, because of this vendor appreciation focus more vendors were set up, new vendors, who spread the word to new people and it was packed. The park looked like something from a dreamy awkward Disney or even Looney Toons movie. People everywhere buying and buying, it was a sea, I put on a life preserver, at one point I swam though the crowd and bought something myself! And, if you know anything about capitalism and economics unlike me, this whole buying and selling in large qualities is good—good for everything, people, kittens, children, etc. etc. That day is more than a memory too. Morale is a huge thing. The show in August will be that much better because of it. Looking at the vendor list I’m more than certain good times are coming. Hoosier Sister is back and I’m not seeing much on their business page in terms of what they’re bringing, but they always bring the best and coolest stuff. You might note they just hosted a pop up at West Elm in the Keystone Fashion Mall…maybe that’s where it all went, maybe not though, just saying. Rest assured they take credit and debit cards or your first born child. Bring a truck. Uniquely Yours Crocheted Designs is on board and it’s great to see fine artisan crochet at an IAVM! Crochet has become more popular in recent years and there seems to be no sign of it slowing down. I know we’ve bought multiple caps, scarves, hats etc. They make an excellent gift and with cooler weather just a few days or weeks or months away or whatever, how lucky for you to be able to prepare for it in style! I love this name and always say it in my head like “hyper” and “bowl”, don’t lie, you do it too. 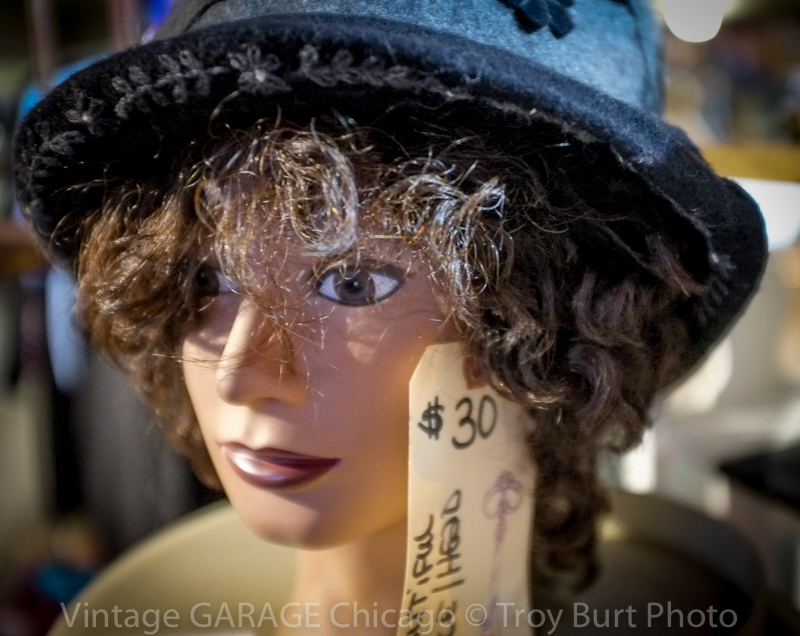 Hyperbole Vintage pronounced [hahy-pur-buh-lee] [/ˈvin(t)ij/] offers a delightful selection of vintage and antique items. Looking at their Facebook page I’m seeing everything from collectibles, an old lock, clock stuff, glass, furniture, unique and trendy and project items. I look forward to visiting their booth! 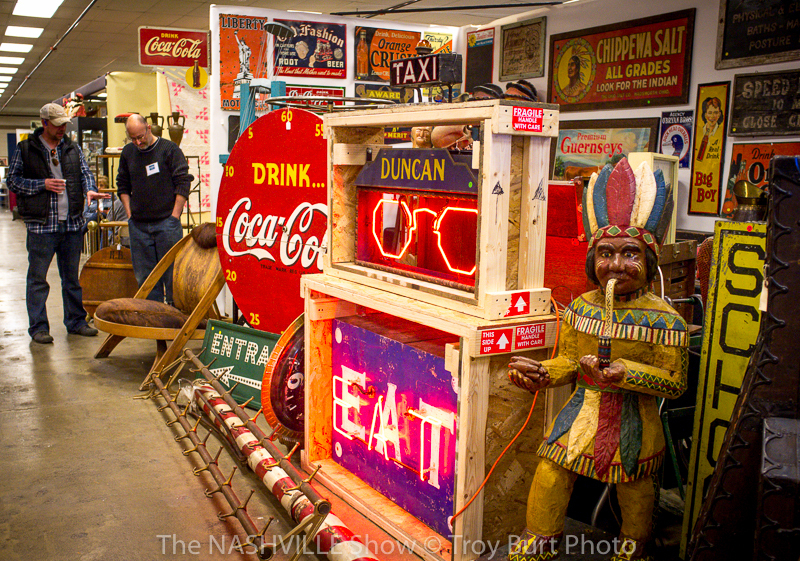 Nan’s Treasures has become a mainstay for the IAVM and you can bet they will be in the park with us next Saturday. 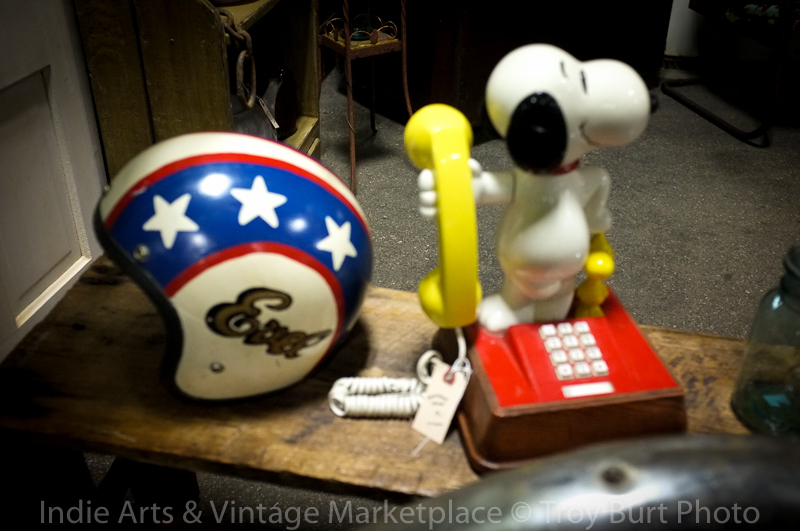 Seeing lots of treasure on the Facebook, furniture, lots of trendy white décor, antiques, collectibles. 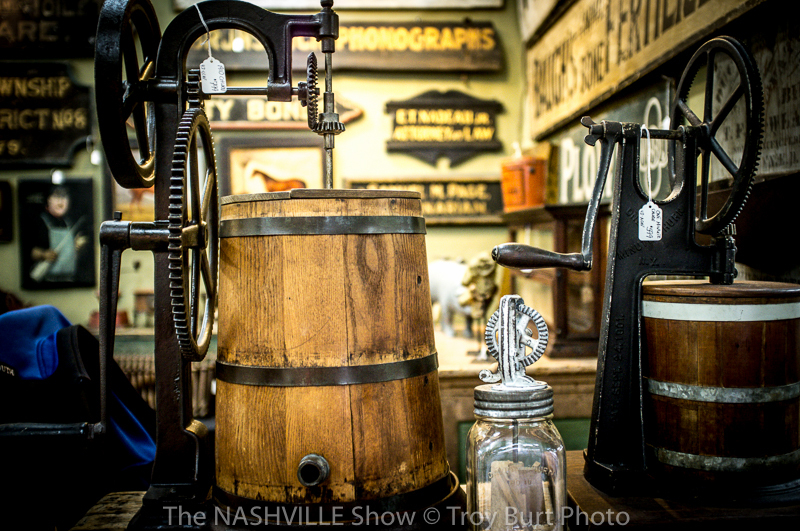 You can bet Nan will have a savvy collection of awesome vintage and antique wares you’re sure to want! 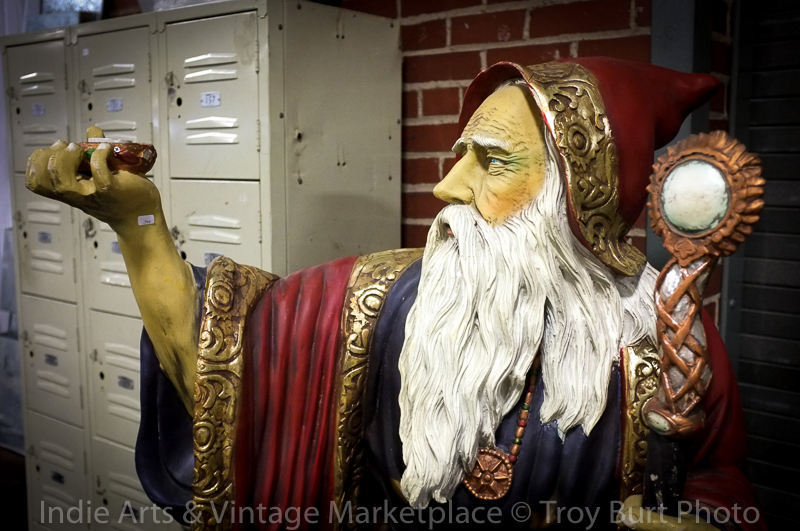 Epoch Finds and Furnishings just has the coolest stuff. I’m not sure if they know me by name, but I always prowl/stalk their booth to see what they brought. They have an excellent eye and you’re sure to want what they bring. 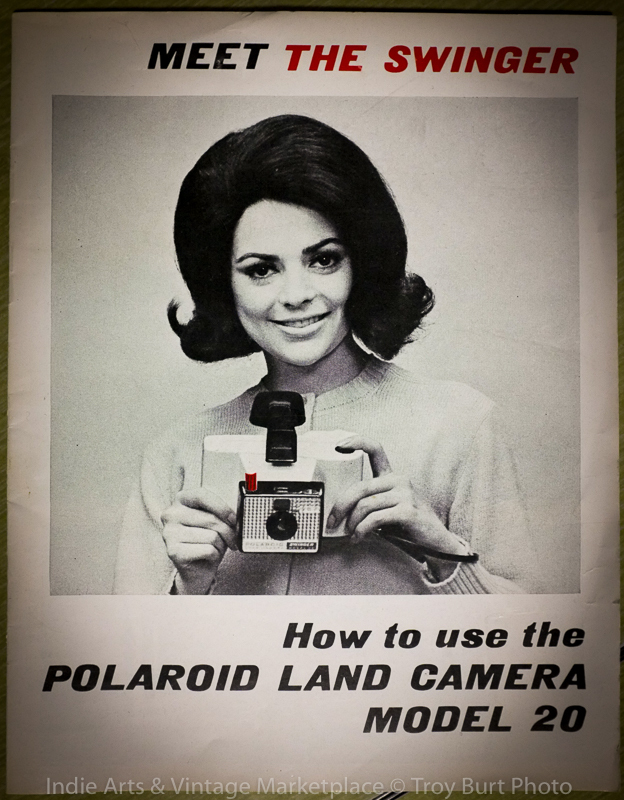 It’s cool, cutting edge, and gets into your pocket book. Bring a truck and help. I ripped their FB background pic because it just said it all. The actual list of vendors is deep and growing. So by no means this being the last previewed vendor (that’s legal by the way) does not mean there’s not a ton of stuff going on. 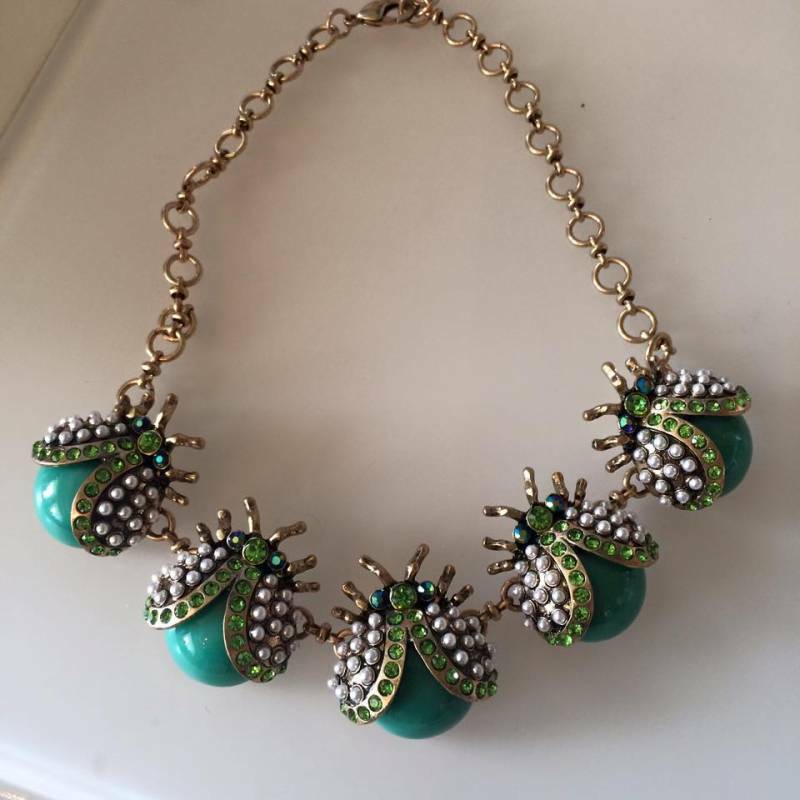 Amy Kae Atelier represents another awesome trend, handmade/handcrafted artisan jewelry. Her page is filled with examples of just a sample of what she brings to the shows. With talking to her you also learn she’s super knowledgeable about the materials she uses to make the jewelry and how to wear it, the whole trendy fashion end of it that I’m totally clueless how to explain. 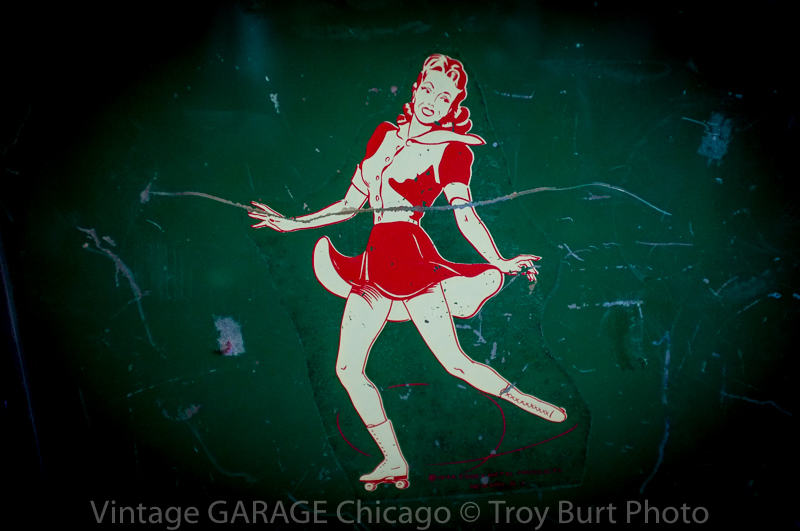 You’ll just have to visit her booth…and like and share her Facebook page. Aside from all these awesome vendors there will be lots of beautiful peoples and music and food, Sassy’s Food Truck, will be on board. There will probably be *cough* beer and dancing too. 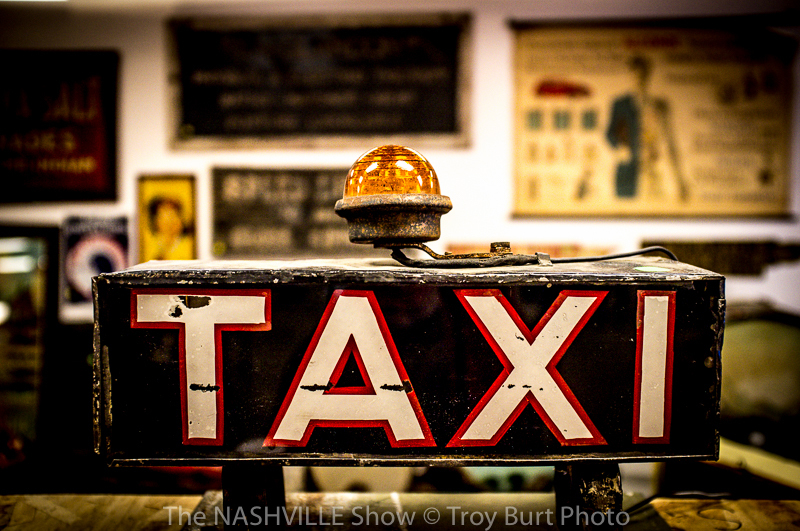 I know there will be junk, antiques, vintage super coolness and more—on the heels of inspiration. Be sure and be there. I plan on releasing the next featured vendor early next week so watch for that. Been a busy summer, built a deck, built a shed, working and stuff. Below is an actual photo of my other life (maybe). Still have a moment for all this fun though! We make the most of it so I hope to see you there! As I sit wrapped in my large vintage Indiana state flag, wearing my signature back on red “Hoosier Sister” trucker, and gaze longingly at my Rosie the Riveter poster (she was from Indiana, argue if you must) I’m reminded why I decided to wait and pen this featured vendor on the 100th running of the Indianapolis 500, or “God’s Day”. It’s important to note that I also performed the proper “Ring of Corn” ritual using checkered flags and ears of corn only from Hendricks County, and that I channeled the spirit of Anthony “Fort” Wayne while watching the movie “Hoosiers”. I didn’t add that to the above sentence because I was so taken by the moment I forgot how. It seems like a “Greensburg” lifetime ago, that’s Hoosier for “about two weeks” since I first dreamed up the idea, featuring the Hoosier Sisters on the greatest day in the vast reaches of American Hoosier history—wholly immersed in a bathtub of Larry Bird biographies (in the brightest corner of Monument Circle). These gals are pretty awesome, but to truly express the depth, this is no Bloomington rock quarry; I needed to do it within the context of what truly defines Indiana. 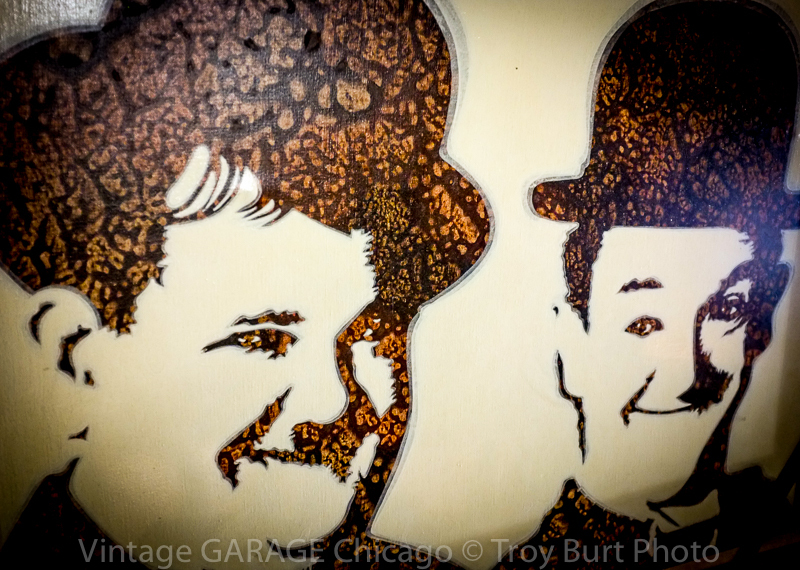 Call it writing greatness by Hoosier osmosis, Indiana astrology, White River magic, whatever—it’s no surprise I didn’t mention the Children’s Museum here, I am abandoning all logic and writing this one from my Oliver Winery wine filled gut, and here’s why. 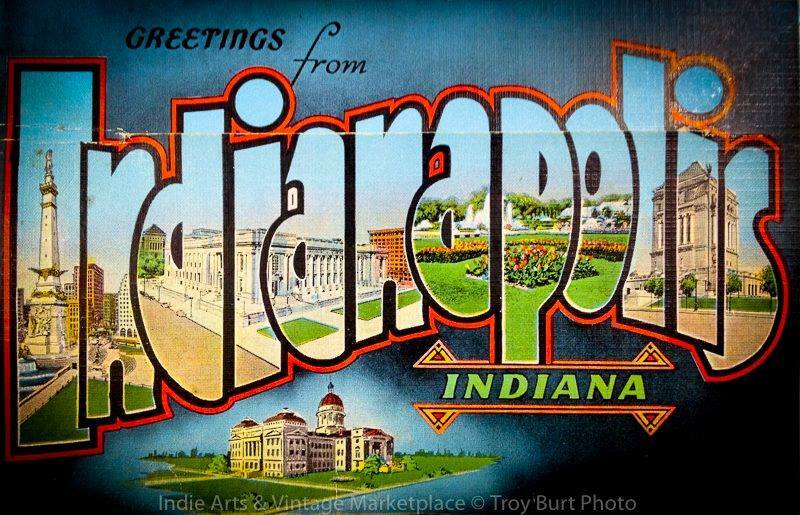 The Indiana Dictionary defines “Hoosier” as a vastly witty, intelligent, bold, strikingly amazing, sophisticated, handsome, beautiful, strong, humorous, vastly intelligent, and athletic, better than anyone from Kentucky (especially basketball) etc. etc. trustworthy, hardworking, intelligent person who is likely higher on the evolutionary ladder and probably has better DNA than the average Ohioan or whatever they call those flat landers. Intelligence is the key word here. Like you, I already memorized this definition long before birth, so I will not continue to reinterpret it for you. But, know this: by the very definition the term “Hoosier Sister”, from the Valparaiso Latin meaning all of the above plus “two sisters who have taken the vintage market scene by storm” is so powerful, just saying it causes college basketball teams from Kentucky to drop seed by a margin of four. One more thing, I’m sick and tired of the “Ohio Valley” and “Wabash Valley”, where’s our “Hoosier Valley”? Anyway, to try to summarize, capture, soak up all that is great about them in twelve hundred words or less was just overwhelming, but now since I’ve harnessed the power off all of that is great about Hoosiers including the greatest Hoosiers (if you race in the Indy 500 you are Hoosier for a day) in the world on the greatest day in the history of any world including Indiana, well, given my research here and the facts already presented, this definition, guided by all that is great about Hoosier-Home, gets me to the point: the Hoosier Sisters have a wonderful eye for awesome vintage and antique wares and sell the Indiana “Garter” Snake out of them. Broom! About three years ago I leaped off life’s apron strings and went on my “Harrison” or Hoosier wandering rite, where a Hoosier leaves his or her nest and travels “a real afar away” to other cities within Hoosier-Home or “Indiana” as the outlanders call it, to sell junk, wares, that coolness which other Hoosiers longs to buy, barter, or trade. Among my first “Foyt” or “Manning” as it’s now called by the younger generation, the first Indie Arts and Vintage Marketplace I encountered the Hoosier Sisters, experienced and spry as I was, I was so overwhelmed by what I saw I barely was able to venture forth and buy a flag or something. 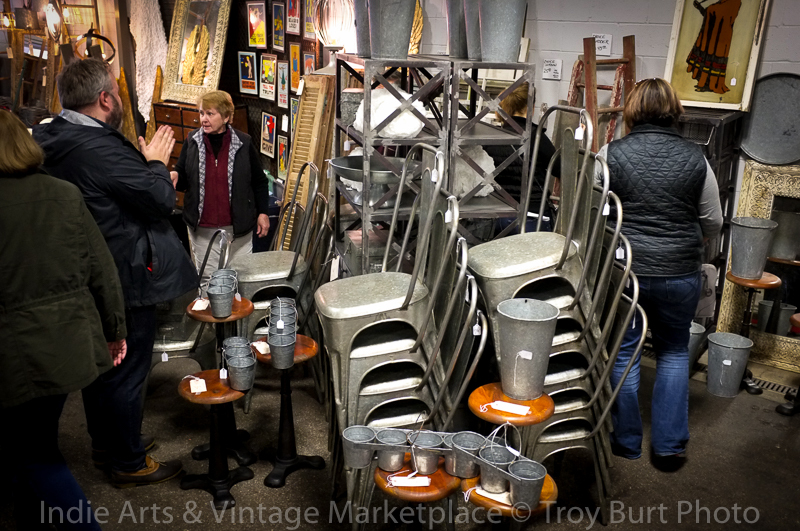 Actually, I didn’t buy the flag; I bought the circus animal cage, another Hoosier tradition. 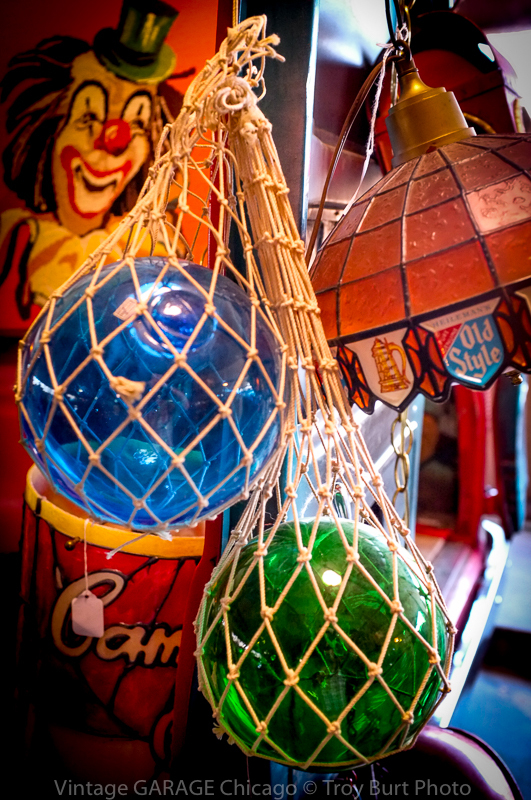 A super awesome bright blue antique animal cage even your kids would have liked…wink, wink! But, right away I knew we were kin, Hoosier brother that I am, smooth in taste and style, the eye for what’s good, I was immediately like, “I’m back Home Again In Indiana,” and gave them the old Jim Nabors high five! They were it, and I knew it! To date, they are still the only Hoosier Sisters that have sold me a circus animal cage! 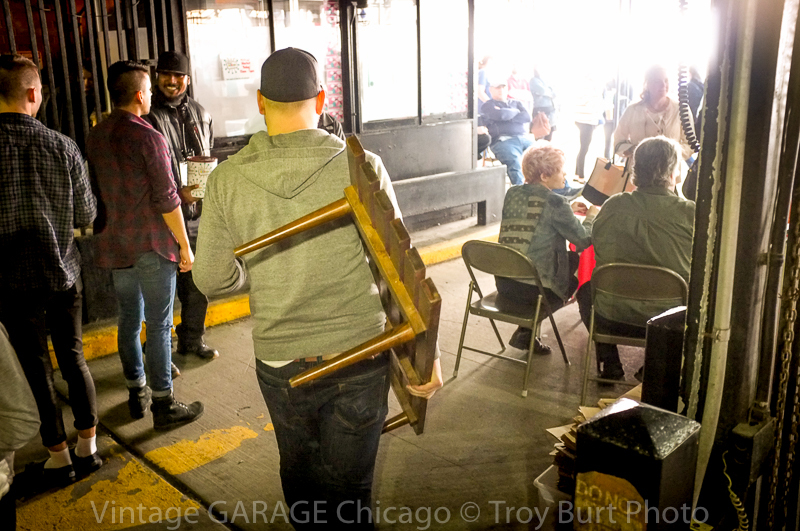 That said, from that day forth we had many encounters both buying and selling and by far, and I say this with the utmost sincerity: two of the major things that set the Indie Arts and Vintage Marketplace a part is the quality of wares and community spirit, or “Union Station”. People come to the event for the experience. And, because we are who we are, they want a great experience and want to walk away with the best awesome stuff. 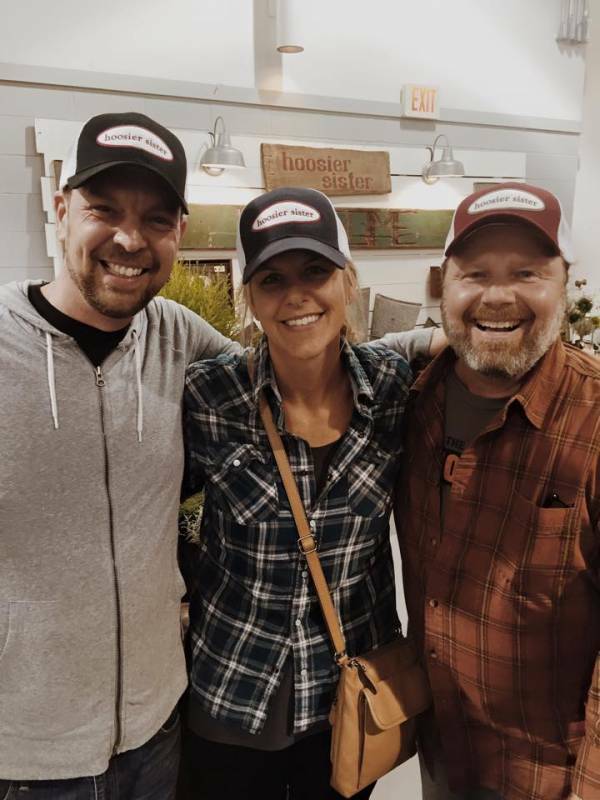 What the Hoosier Sisters represent is just that, a truly unique “Hoosier” experience that I can only relate as two kind and caring people who love what they do and share that with the customer. The informal interview we shared highlights that in greater detail, but rest assured, the Hoosier Sisters, in my professional Hoosier opinion, truly are a highlight of the Indie Arts and Vintage Marketplace and I thank them for taking the time to put up with me and my “interview”. 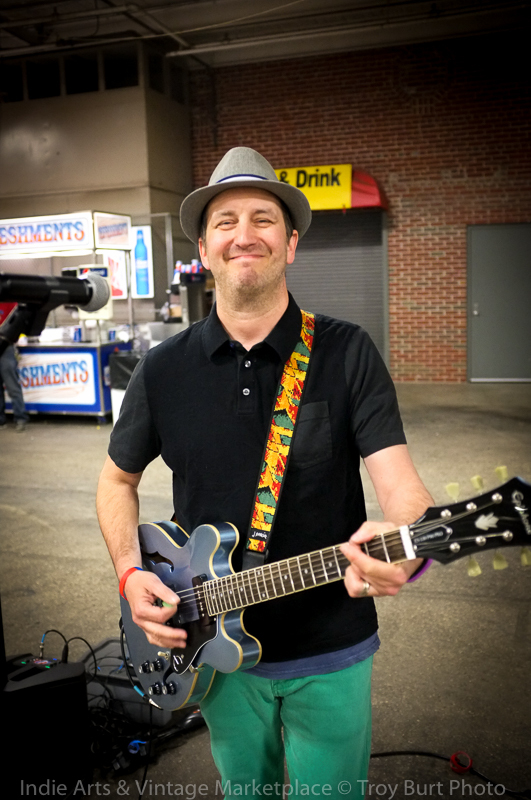 I won’t give too much away in this featured vendor, but let’s just say this interview started out with us in a show weary, tired filled silliness “moment”. 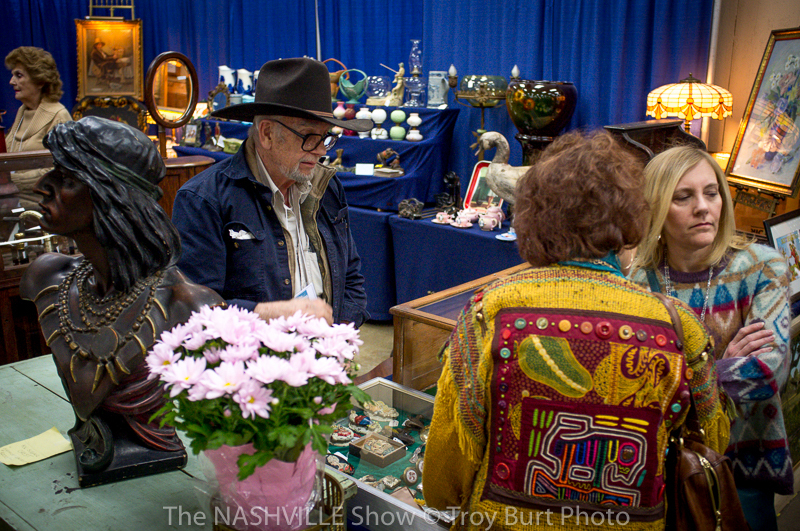 The gist of it is we were day two into another show Jon promotes, you might know it as the Springfield Antique Show and Flea Market Extravaganza (which the spring show was ah-awesome—dude!) and we had been working our Hoosier tails off (which for people in Ohio we were like these super-human people who had incredible strength and charm). I had taken the liberty to offer a free “beverage” thoroughly clutched in the arms of a “Laurel” puppet in a minnow can next to the trashcan. Hoosier Sister No. 1 added a red Solo cup hat and the sign “Free…err, beverage”. Anyway, hilarity ensued and I later captured this “interview” among our tired silliness. The whole of the puppet story will be told in the Extravaganza review article and I note it now because there was a soft and sincere element to mark it. I added a touch of it here to help you understand the community spirit invested by all the people in this. Each one of us, vendors and promoters, love what we do and every moment is fun for us and something we truly enjoy. 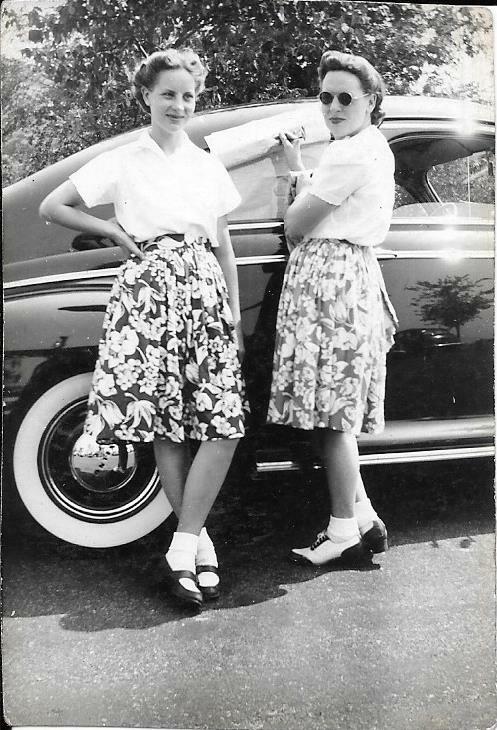 And, I say this with the utmost serious Hoosier, “Oh golly, my sister is gonna whoop me” tone, the quality of wares that they bring, the customer service and all of it is reflected in their personalities. It’s no surprise to me they bring some of the best stuff to the shows. Like our shared story, it’s just who they are. IAVM “Hoosier” Correspondent Chris “Fort” Wendt: Because you friended me on Facebook and I can stalk you to find out most of what I need, I know you both have large, full time families, barely time for anything including this…how do you find time to buy and how do you stay up on latest trends? Hoosier Sisters (No. 1): We do a lot of weekend shopping, we have regular people we buy from, and mostly we see what our customers like and go with that. We tend to buy what we like too, but we also follow the Internet sites like Pinterest. IAVM “Hoosier” Correspondent Chris “Fort” Wendt: I get that; Hoosiers just tend to know other things regular people don’t. I don’t like to call it super powers, but that’s really what it is. 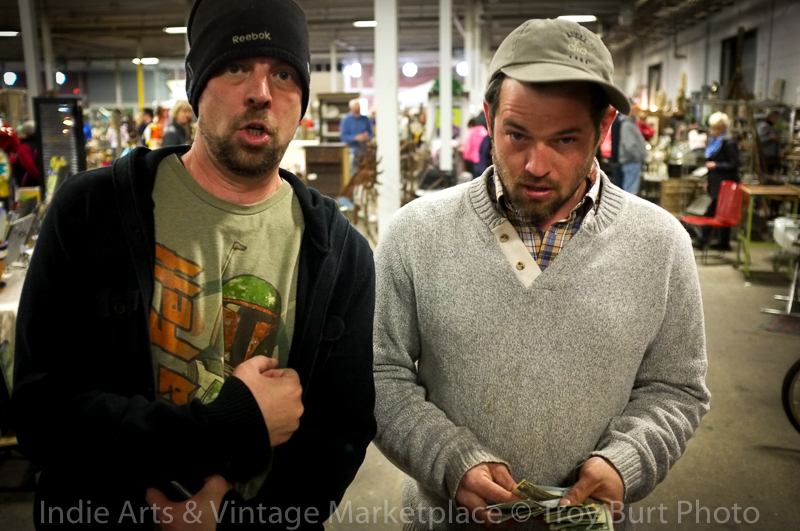 How long have the two of you been doing this…superhuman vintage market thing? Hoosier Sister No. 1: We’ve been doing Jon’s show for three years now. 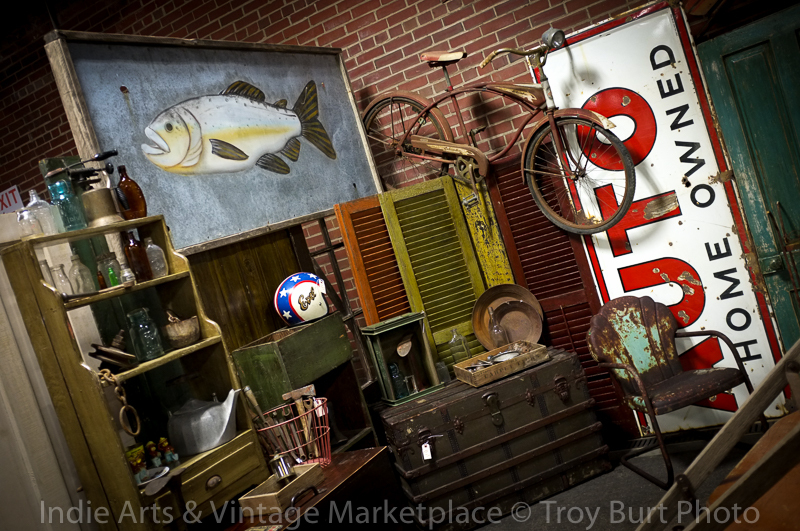 We’ve always liked vintage stuff and antiques, and we like to decorate, we just decided to try buying what we like to sell it. 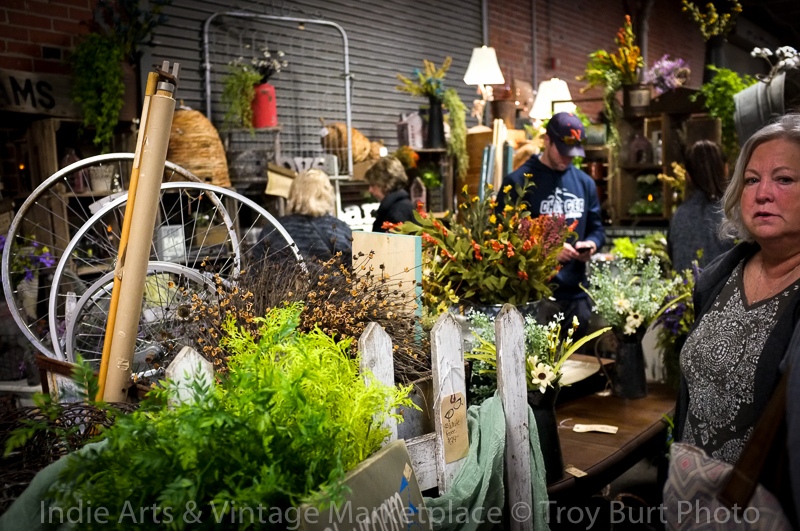 The Indie Arts and Vintage Marketplace venue seemed to be the best fit. IAVM “Hoosier” Correspondent Chris “Fort” Wayne: You definitely have your finger on the pulse of what’s in vogue. Not to say that I didn’t have to look over my own crowd of people in my booth to see it, but every show your booth caters to a crowd. And, not to say that my stuff isn’t really cool, though varied, what would you call your style and who is your primary audience? Hoosier Sister No. 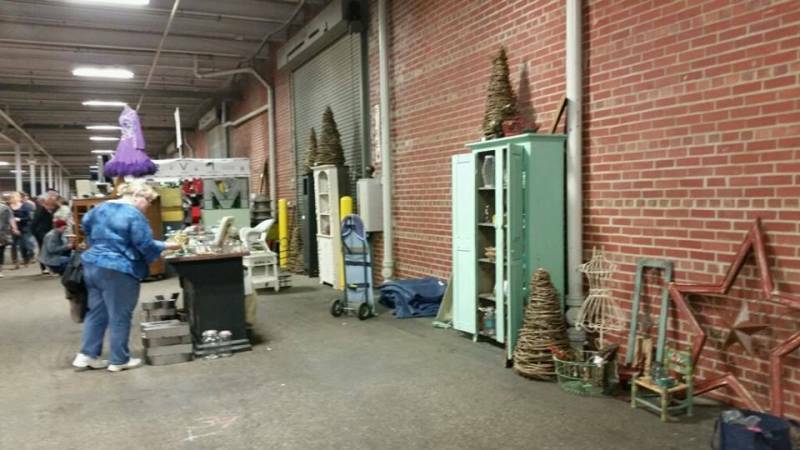 1: “Vintage Home Décor” and ladies 30-50 though younger and older. IAVM “Hoosier” Correspondent Chris “Fort” Wayne: You had mentioned that you started out with the Indie Arts and Vintage Marketplace, and given I’ve watched you gals wail and I know you sling the junk, that’s Hoosier for “success”, where else can our loyal customers (Hoosier or not, we love you) find your fine quality wares? Hoosier Sister No. 1: We only do shows, we do not have a storefront, and of course there’s Facebook. 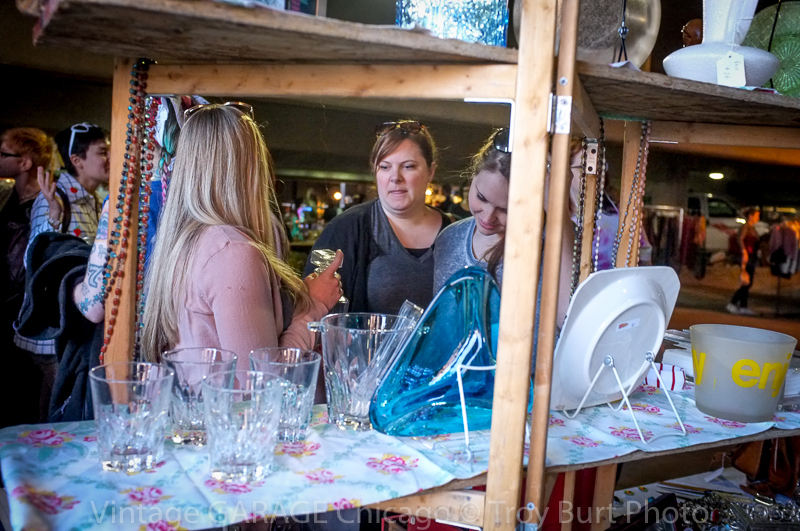 We love to work with our online customers and definitely recommend coming to our live events and vintage market pop-ups. We do these regionally and even in other dangerous lands like vile Illinois, typically hostile to Hoosiers (the whole vile and everything after “regionally” is not an actual quote, in fact, that’s me). 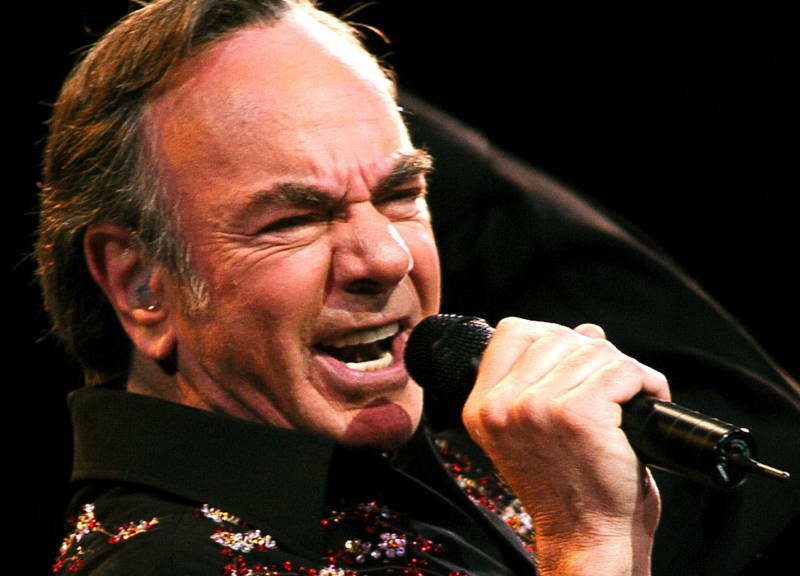 IAVM “Hoosier” Correspondent Chris “Fort” Wayne: I would like to end this interview with just stating that they also have this in their blood. 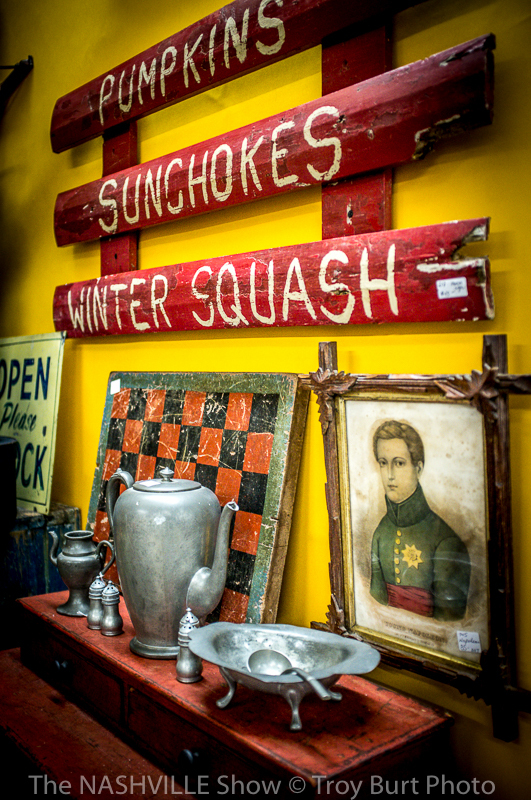 The antiques and vintage thing is as much Hoosier about them as it is their dad. I’ve worked with him and met him on several occasions and I say this, the guy is sharp, knows his stuff, and passed it along to his daughters. 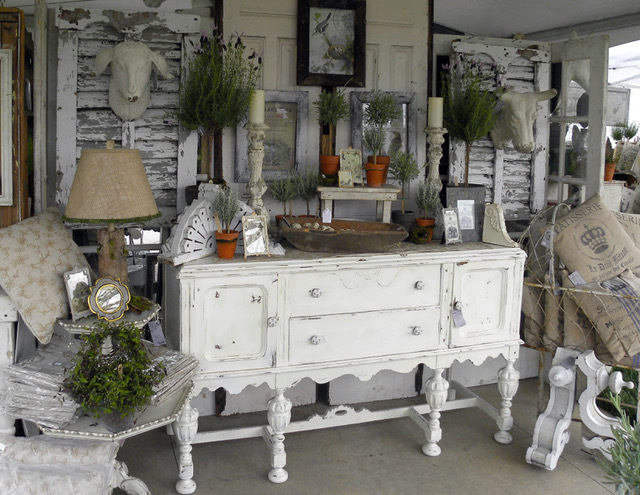 The Hoosier Sisters are as knowledgeable and experienced in antiques and vintage wares as they are in design and décor. I call it Hoosier Renaissance and the Hoosier Sisters have it. 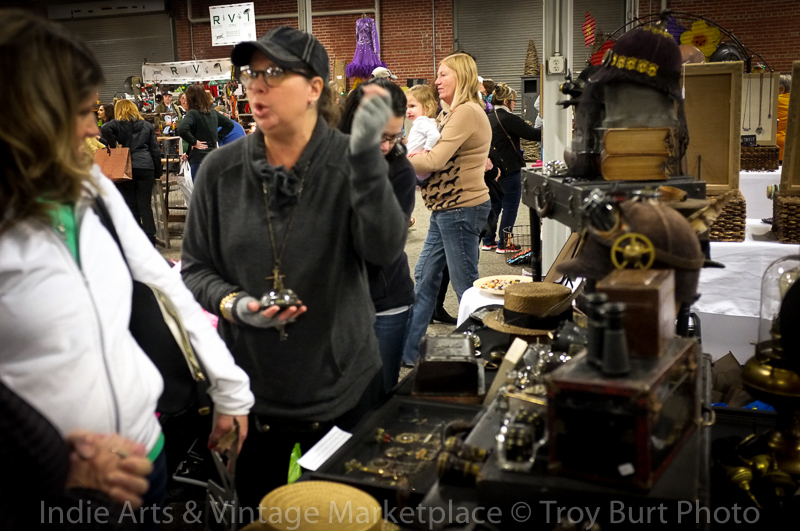 A final note, on the day of my people, in their land, on their race, I am truly honored to represent the Indie Arts and Vintage Marketplace with a featured vendor article on the Hoosier Sisters. They have grown into something special and have come to encompass wholly that which is the IAVM. I personally use them as an example of what to expect when explaining to a newbie or awful non-Hoosier what the IAVM is. I sincerely thank them for the whole puppet thing too; it was something else, and inspired in my heart how I needed to address this interview. I tend to write to the border of what the interviewee can take. 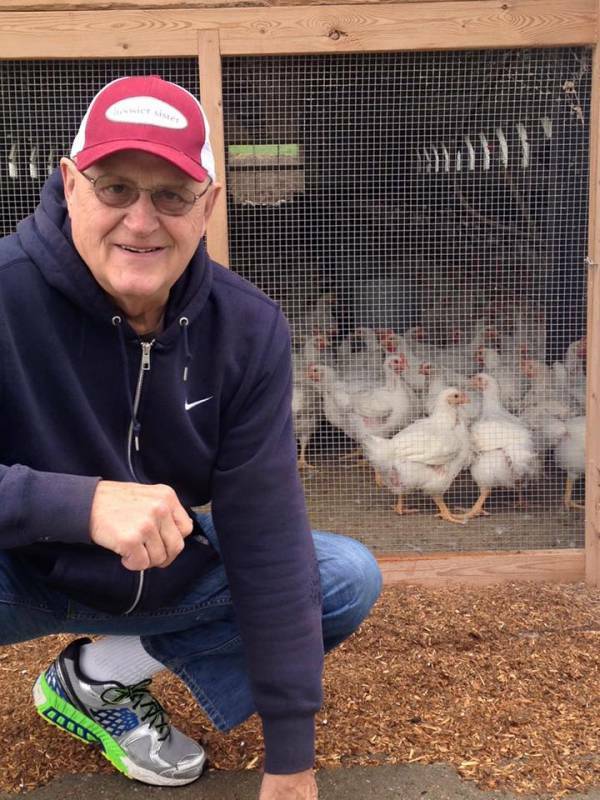 I truly enjoyed writing this and wish you long-Hoosier IAVM health, or “Florence Henderson. Hoosier Sister No. 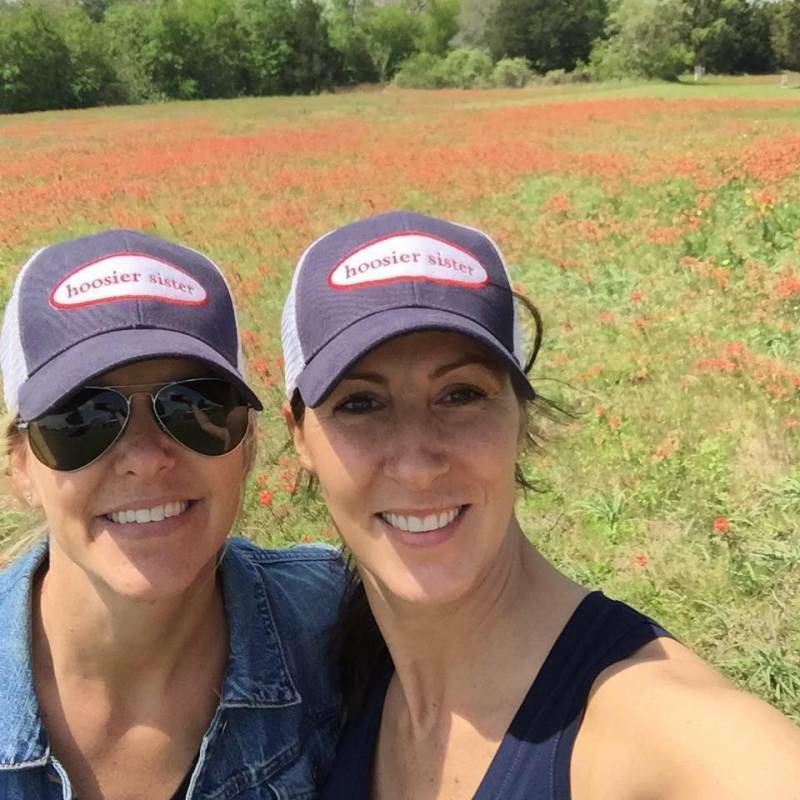 1 is actually both Heidi and Gretchen because they are both number one to me…that’s an old Hoosier phrase meaning good pals. And definitely like and share their page, more importantly, buy-this-stuff (or we’ll assume you hate Indiana or Hoosier-Home as the faithful like to call it. 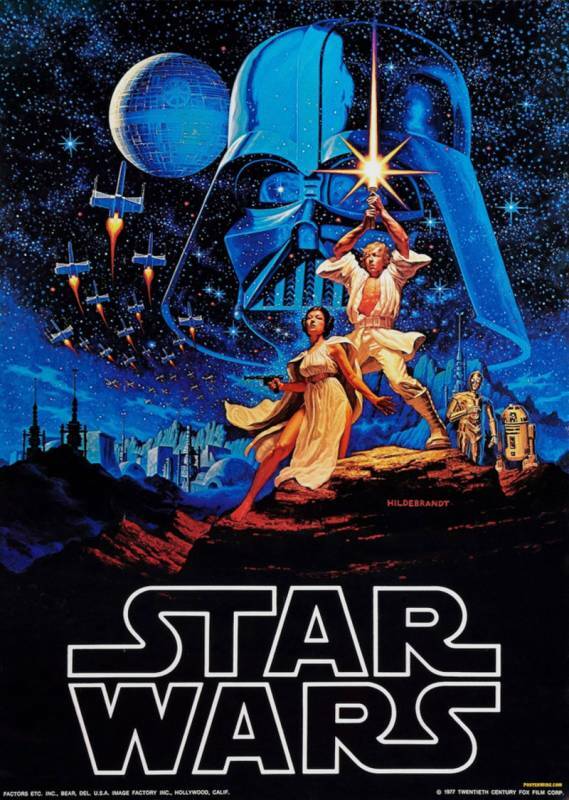 To celebrate, the May 7th IAVM @ Broad Ripple Park (spacious and lots of parking, bring a pet, kids welcome too) preview will lack the usual hyperbole and be replaced with iconic (mostly 80’s) summer movie puns! Warm weather, awesome food, a new home @ Broad Ripple Park, though next to the river no need to worry about getting caught in the clutches of a giant great white’s “Jaws”! Sharks don’t like awesome vintage artisan wares or fantastic deals! It won’t be “Golden Pond” either, but with the new venue at Food Truck First Fridays it’s definitely looking to be “One Crazy Summer”! And, I can’t wait! You might say I’m “Footloose”! Not sure if they’re having “Meatballs”, but the food trucks are back! And the vendor list is looking great! There’s lots of new faces and many of the familiar, awesome road-tested veterans we anticipate will be on board too. I guess, in a roundabout sort of way I’m saying this isn’t the best weekend for a “Vacation” or even a “European Vacation”. Rest assured you will never hear, “Sorry folks, park’s closed. 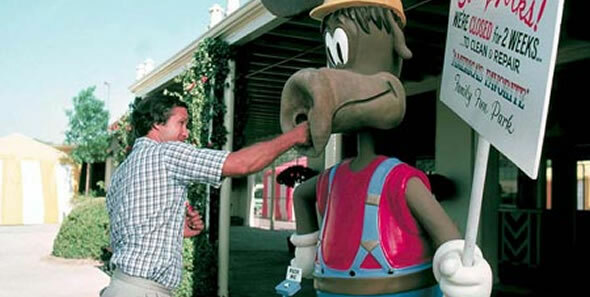 Moose out front shoulda told ya!” when you stick with IAVM! 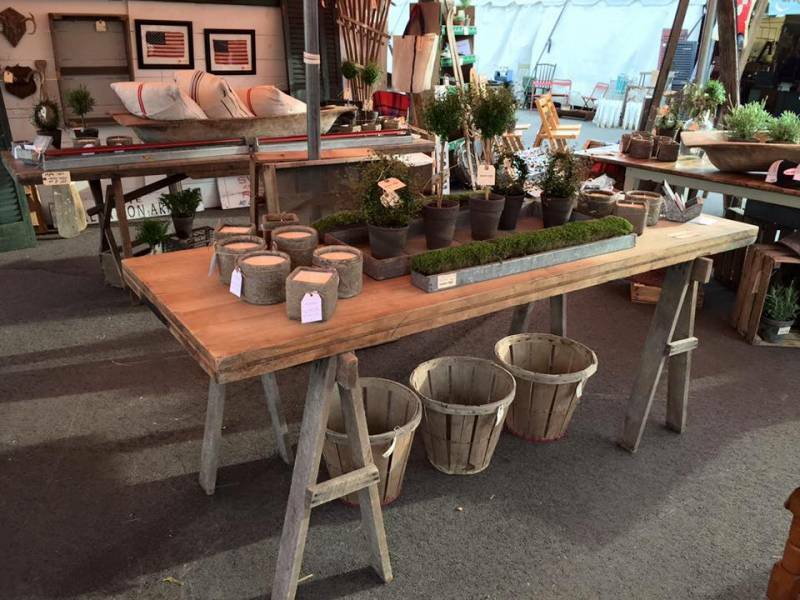 Much of what I’m seeing on the vendor sites is new and exciting and there are lots of seasonal gardening wares too. I’ve been browsing Pinterest and some of the top decorator magazine and I’m not fluent in karate or even a “Karate Kid”, but these vendors truly are kickin’ it, they are indeed “the best around”. United State of Indiana are on board. If all goes well, I’ll be sporting my red United State of Indiana “polyester/cotton/rayon tri-blend for incredible softness” t-shirt! If you don’t know, these folks make these awesome clothes, items, stuff, like this one wallet that they used to have made from the old Hoosier Dome roof and I’m not sure if they still have it, but all their stuff has the state of Indiana on it, like the actual state! And, they’re all like local and stuff, and small business and you should buy their stuff, like this one time at band camp. I would say their finely crafted artisan wares are as good as, if not better than “American Pie”. Umm, pie. 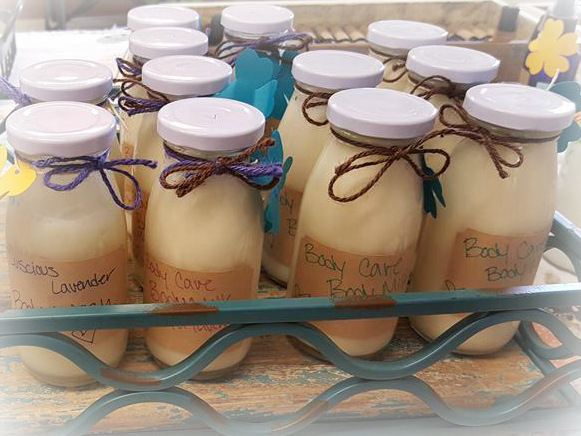 The Vintage Farmer’s Wife offers a wide variety of mainly artisan wares like jewelry and homemade apothecary soaps and makeup. The Facebook page offer a nice sample of what to expect. You’ll find more than enough for a long trip or short “Weekend at Bernie’s”. Silver Lining Jewelry will be there and they are currently having a flash sale as listed here on their Facebook page, “Tons of items up for a ‪#‎FlashSale. Stay tuned larger pictures & sizing info. First to comment SOLD on an item & pay within 2 hours receives the item. Wonder if they “Flash Dance” at these things? Just curious, not like “Mystic Pizza” curious, that’s at the food truck, but just curious. One of the things I tend to overlook in my reviews/previews (because I’m male) is the awesome artisan jewelry. Skill, design, trend, these folks (Aubrey) have it covered! The photo below is just a sample of what she brings to any given IAVM. Make sure you have a “License to Drive” so you come right over and buy up that jewelry! Visit the page, get a good preview and like and share! 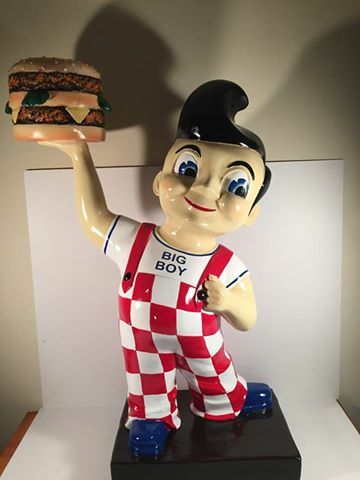 Love Shack Collectibles are along to send you into a collectible buying frenzy or “Maximum Overdrive”. I’ve been noticing a lot more collectibles in general at the event and it’s good to see one vendor dedicated in that area. They have great taste and always bring something new! Patronizing their booth will make you look a “Real Genius”, you’ll be “Rad” and definitely a strong candidate for the “Police Academy”. Smith Family Vinyl will be filling a huge niche that totally needed filling, not the “Nightmare on Elm Street” fill my head with terror kind of fill! No silly! Vinyl! Records! They chose to “Stand By Me” in agreement in this and how lucky for you the customer! You can come to IAVM and buy records, in heaps! No need to travel to the past and then go “Back to the Future”! No, just go to Broad Ripple park in real time! Later that night you will have “Nice Dreams”. You might want to hold onto both sides of your head tightly for this one. I will warn you, this is no “Terminator” threat, but pretty close, a pun within a pun, That’s Sew Martha is joining us! Lots of cool stuff in the way of hand crafted artisan clothing with That’s Sew Martha. The photo below is just the beginning! If you want to look “Pretty in Pink” for the “Breakfast Club” then you definitely want to visit their page! No “Gremlins” or “Poltergeist”s, not any that we invited anyway, but American Farmscape and Heartland Vintage will be joining us. 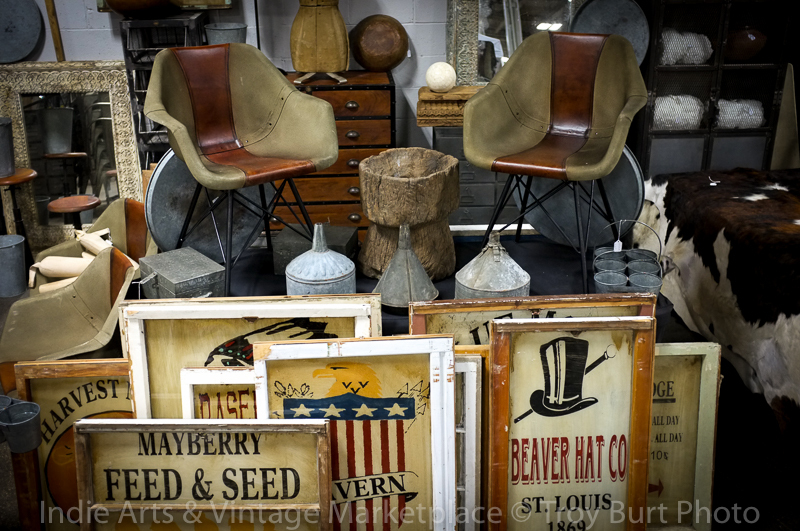 Both (brothers a-hem) offer high quality tend decor, collectibles, and antiques to furnish about any home. 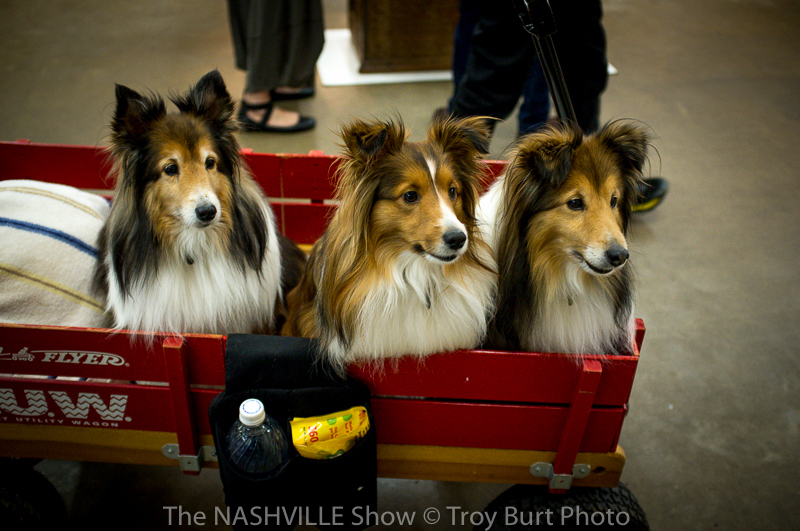 They’ve become a staple of the IAVM and make sure to visit their booths. Because of their popularity and close but competitive relationship you might be worried or concerned about getting in the way of a “Star Wars”. But no need to worry, and because there’s really no way to put these into context of an antique show review pun, “Empire Strike Back” and “Return of the Jedi”. It’s going to be a fantastic and busy summer! If you haven’t checked it out yet, go over to our event page and see what’s lined up! New venues, new vendors, lots of awesome deals. Any true Hoosier or “Hoosiers” would, JS. I broke the first rule to bring you that information. You know what that means. 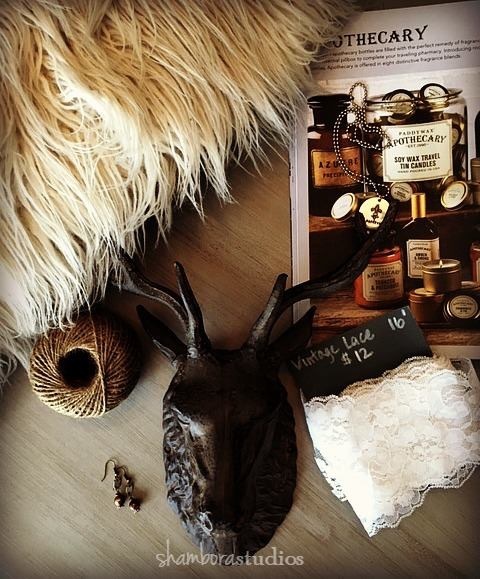 This month’s featured vendor is classic Indie Arts & Vintage Marketplace. 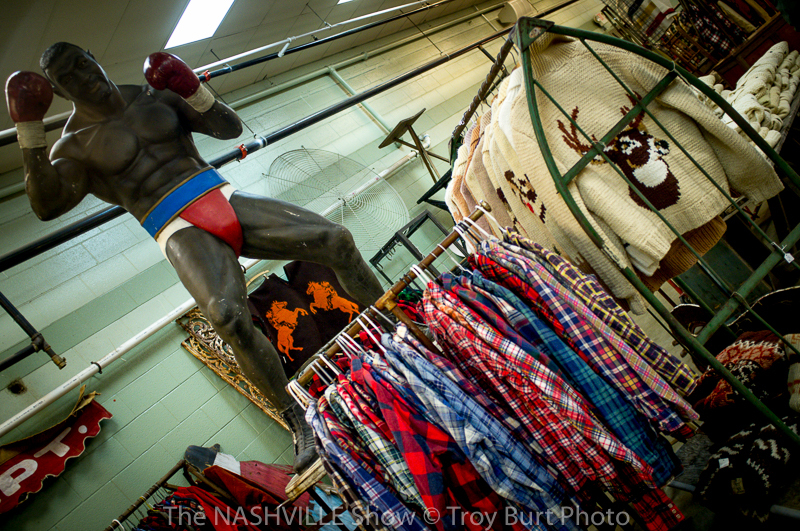 The items you typically come expect is exactly what you find in “Nan’s Treasures”, Paula Jenkins booth. Nan is an experienced industry veteran and has the eye! 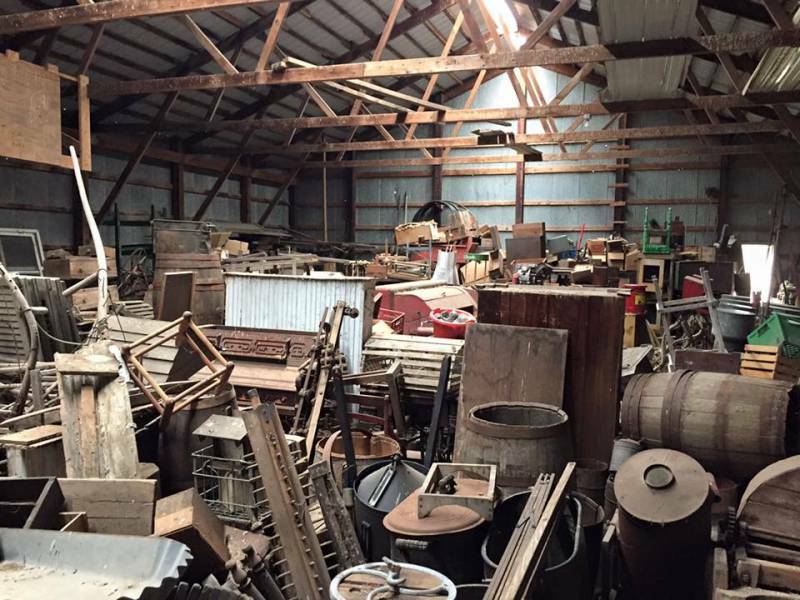 Along with antiques, collectibles, primitives, etc. 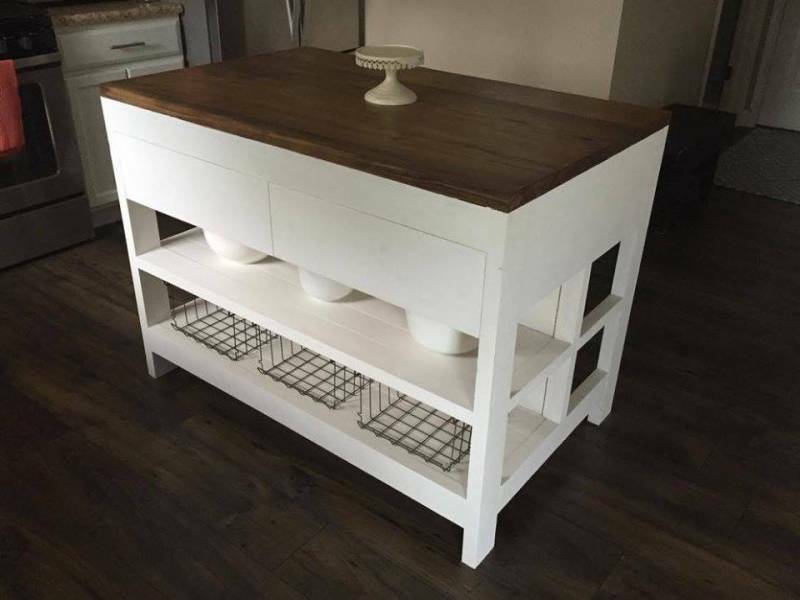 she also makes and repurposes a variety of awesome furniture, shelves, barn gates, and about anything you could imagine in the realm of unique primitive and trendy décor. I always visit her booth to get a sense of what I should be doing! She has a loyal following, which is a good sign you should be patronizing here, and I’ve yet to see a show where the customers didn’t load up on her amazing wares! 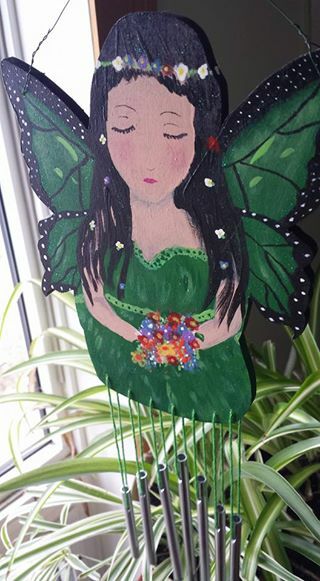 Nan also has seasonal wares, I’m sure you will find something wonderful for outdoors in her booth next weekend! 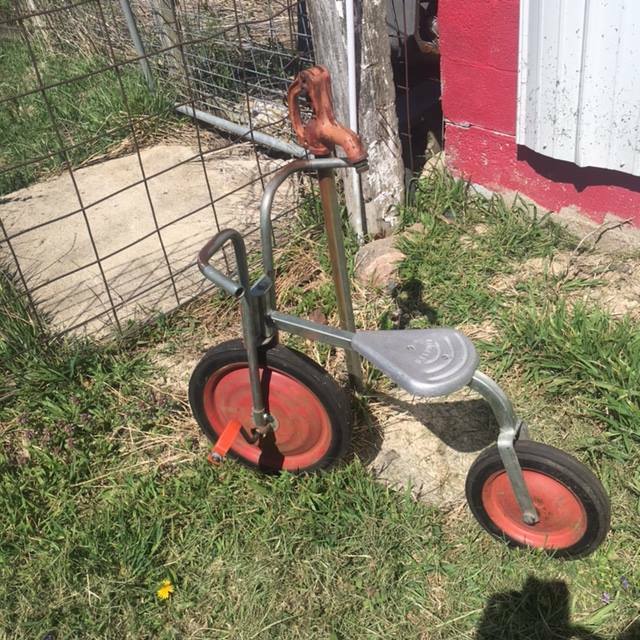 Something particularly cool I found on her page was an old government housing toy bicycle. I’ve seen the tricycle but had no idea they made this smaller bicycle version! 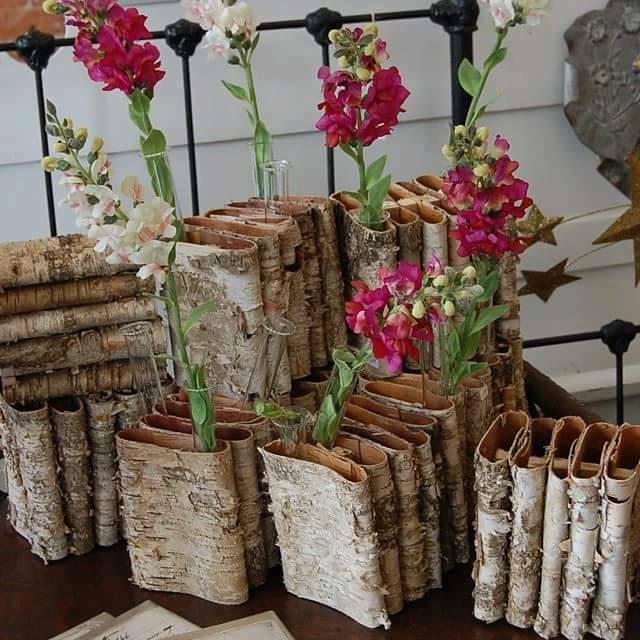 These are cool and sought after and when I saw this on Nan’s page I almost couldn’t believe it! For all you movie buffs, opening scene “Thunderheart” Val Kilmer 1992. 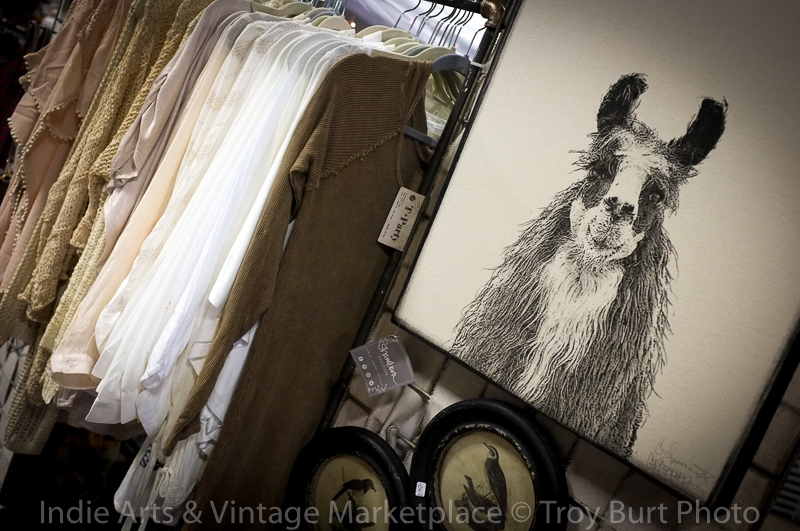 Just goes to show the quality vendors and awesome stuff you can find at the Indie Arts & Vintage Marketplace! Nan’s Treasures Facebook page is listed below, after reading the interview do yourself a big favor and like her page! 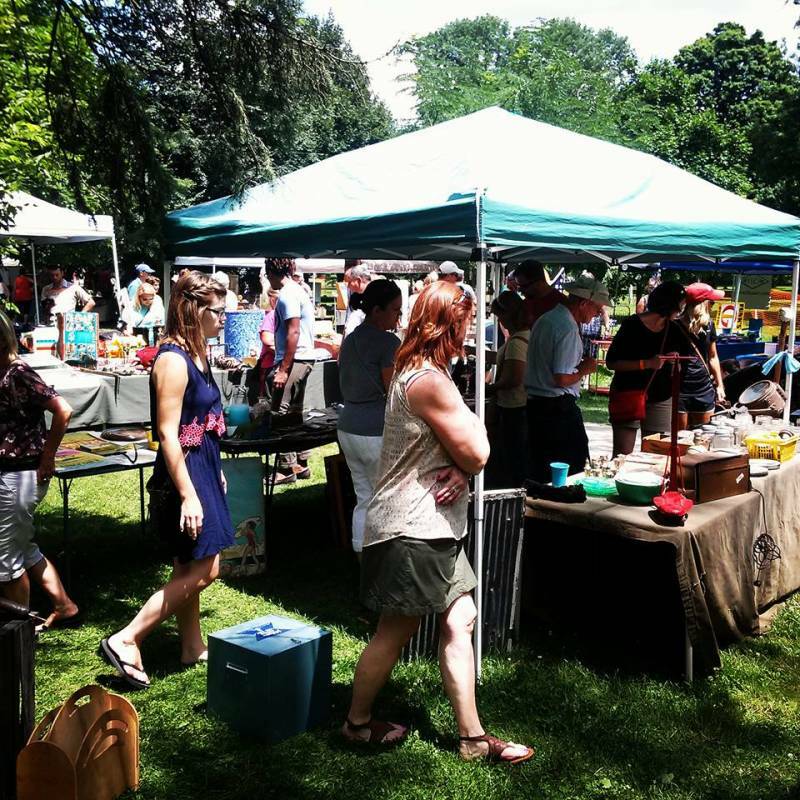 And, do yourself a super solid and visit her booth first and jump on the cool stuff she is sure to have at the next Indie Arts & Vintage Marketplace @ Broad Ripple Park Saturday May 7th. 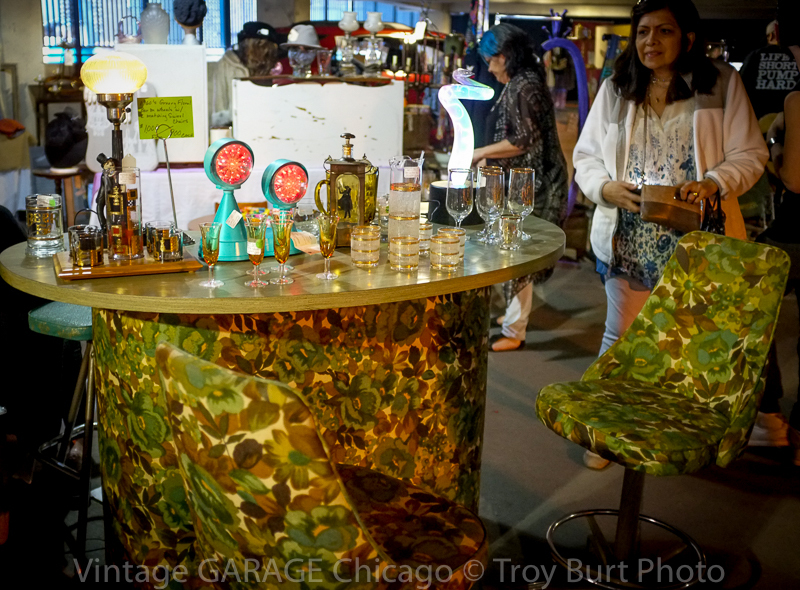 IAVM: What’s special or unique about the items you bring to the Indie Arts and Vintage Marketplace show (basically just describe your inventory for this show)? Nan’s Treasures: We try to bring a few big items unless we have a bigger space, then we try to bring some big vintage items. We also try to include some vintage jewelry, and a few of the special wood items we build. We have been following what people are interested in. 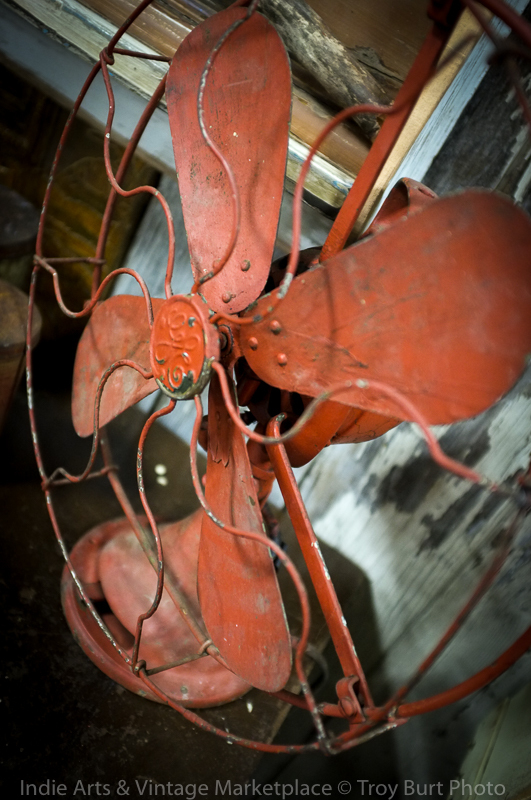 The wood stuff we create is made from vintage and repurposed items. IAVM: What is your price range? 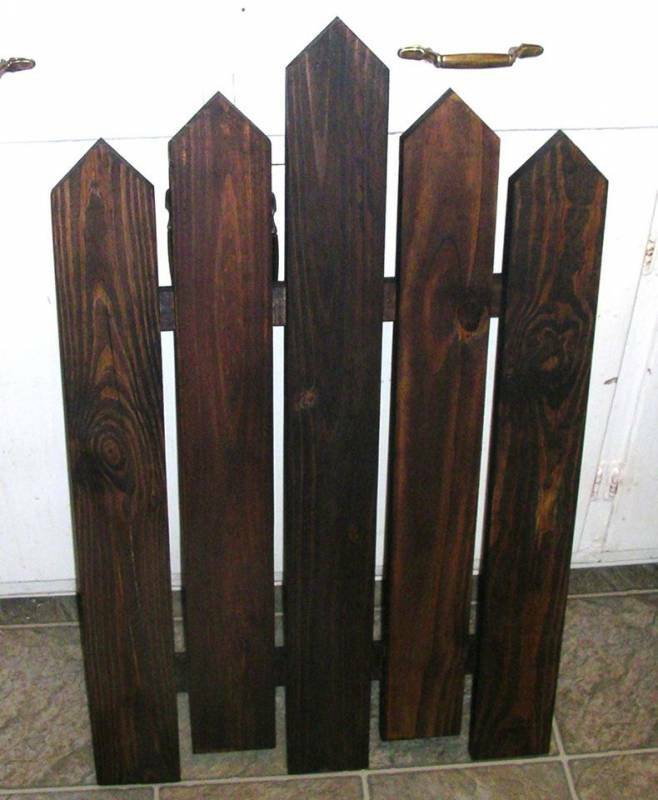 If there is one item your customers must have, it would be our old barn wood gates because customers love them for hanging wreaths, head boards, and many other uses. IAVM: What do you like most about your customers? 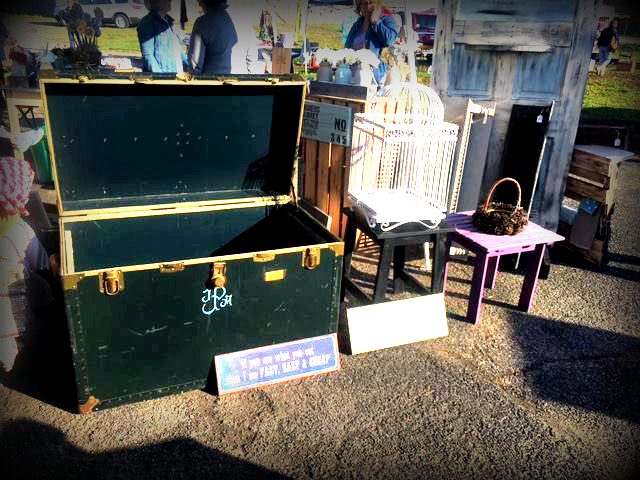 Nan’s Treasures: They enjoy the art of vintage items, they are kind and they appreciate our inventory, and are respectful of handling it. Nan always brings a little of what you expect and some of what you don’t! 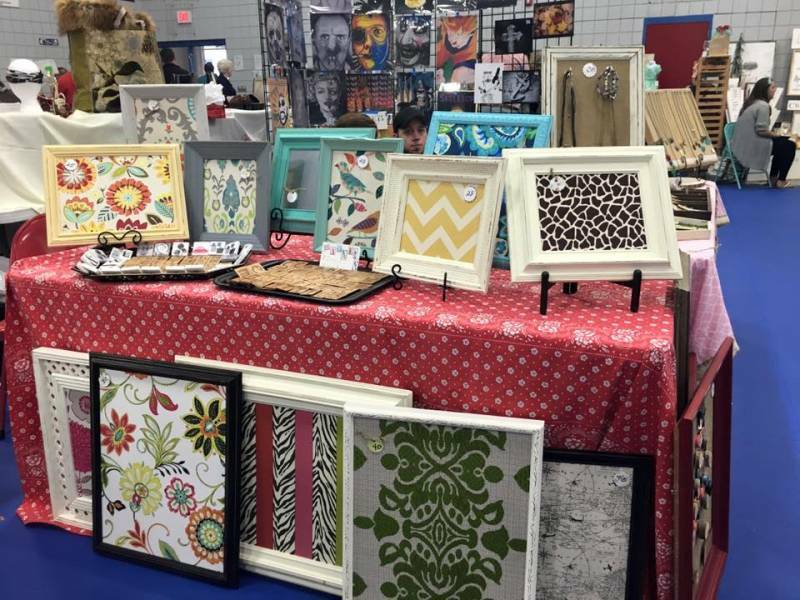 We truly appreciate our vendors and Nan is the perfect example of what you will find at any Indie Arts & Vintage Marketplace! IAVM First Ever IAVM Customer Interview! 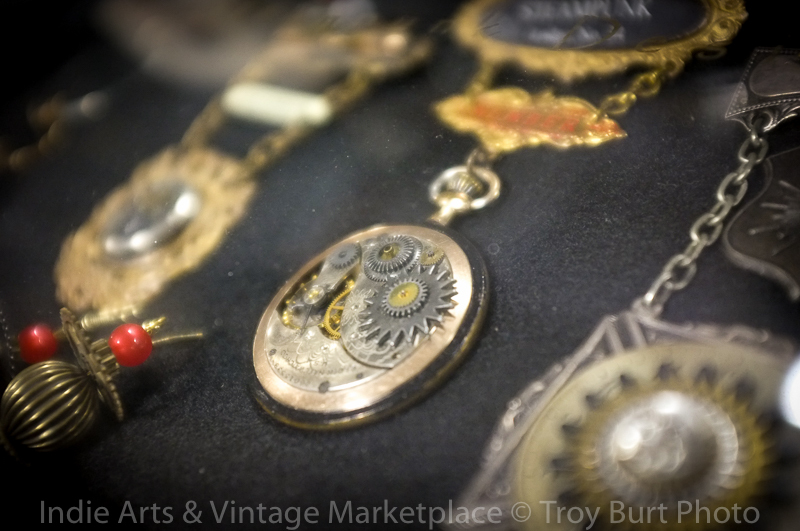 Each month I like to highlight something significant or cool about the Indie Arts & Vintage Marketplace. Typically, it’s a vendor or new design trend, but being so inspired by our professional development meeting in the big city of Chicago last week, yes, you read that right, Chicago! Being so inspired I thought outside of the box and came up with something new. Jon, that was a good idea, Chicago, professional development, here’s proof! I had one of those ah-ha moments where you’re in the shower singing a Prince 80’s-90’s melody and you’re like duh! Steve Lefkovitz! I know right? Duh! You’re probably in the shower asking yourself that very same thing! How could we not feature Steve Lefkovitz, the guy, ney, “The Man” who has probably attended just about every IAVM, ever in the history of the IAVM since the very first one before we even invented the wheel! 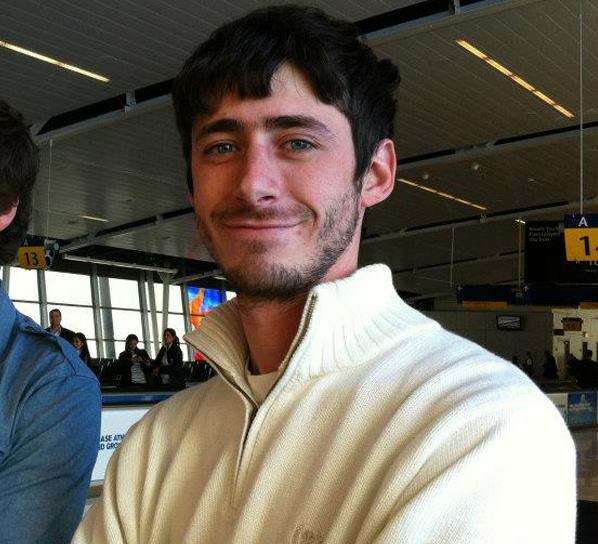 You’ve probably seen him and never known the hidden secret truths about who is he and why we would cover him. So, I thought it was most fitting, again, coming to this decision in the shower, to interview Steve and find out what we’re doing so right! In effect, to keep you from being so wrong, and not attending. I walked over, told him my price, and explained a little history about the piece. He responded politely and added a little information that caught me as again, this guy knows his stuff. We actually made a deal and I noted that I hoped more like him visited my booth. He was someone who understood a quality piece and the value in it. Sophisticated? I think you call it? After that first meeting Steve visited every show and always bought one of my best pieces. In fact, I got to the point where I would leave certain pieces in my truck until Steve arrived. I specifically remember feeling a little sad one show because he hadn’t shown up. I had this awesome lot of vintage Schwinn dealership posters that I knew were just for him! Eventually he showed and sure enough we made the deal. And note this, he is always a pleasure to work with, the guy shakes your hand and smiles, and he really does know his stuff. Savvy? Is I think another word you could use. I wanted to use this particular article to thank him for patronizing the IAVM, as well as, all the customers that support us. I hope by using his example we might better market the awesomeness that is the IAVM to those who might not know. 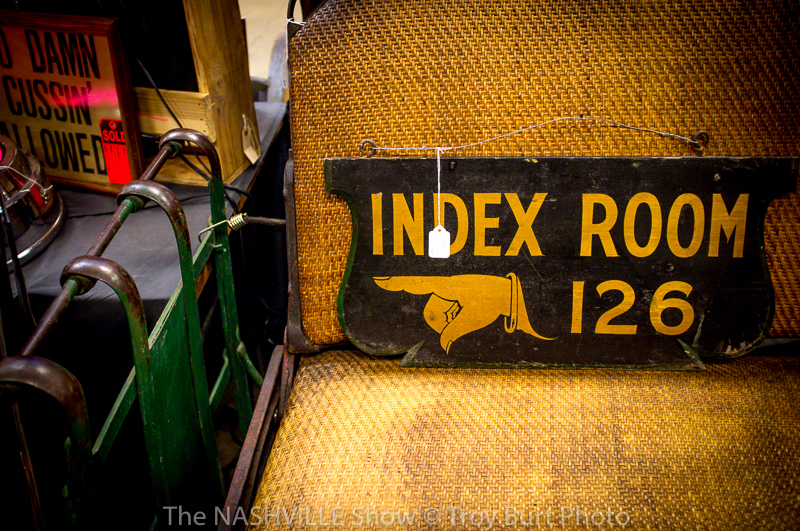 Steve will tell you, the stuff he finds at the IAVM is quality and worth the venture. Before though I start using his pretend passive voice as my vindictive marketing agent, let me share with you the honest and for true interview he was gracious enough to share with us. This is real testimony (sprinkled with my absurdity) and I hope you read it and take away something that will make you want to tell a friend. Again, we thank you Steve and all of our customers for your continued support. IAVM: How long have you been attending the IAVM? 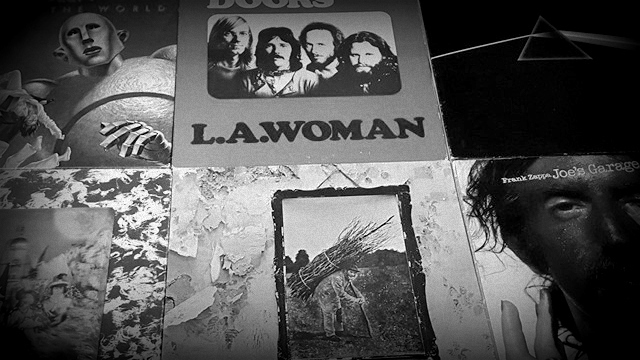 Steve: I have attended since the very first show. IAVM: Wow, that’s amazing! Good for you and thank you! We are truly honored! That also means you knew Jon when he was still a bodybuilder! Aside from being a really cool guy and knowing what’s good for the world, I mean, you are cutting edge, and always on top of things, smart too, JS, in effect you are obviously making good life choices, but I have to ask, what are your reasons for attending the IAVM? Are you a collector (looking for a deal—cough), trendsetter, super human who comes to refuel your super human strength? All of the above? Steve: I have been in antiques all my life. I am president of a group called AAAA or Antique Advertising Association of America for the last seven years, and sold antiques as a picker through college as I do now for fun. I have also done video production for the promoters now promotor for this show and other events they hold. 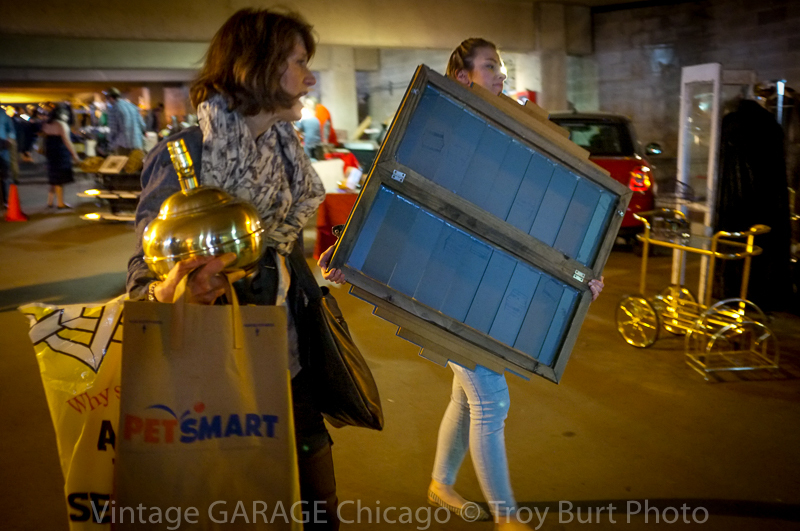 I try to support any efforts in antiques I can especially if they address the idea of bridging the gap of my generation and the older generation of collectors. IAVM: To better help our customers or future customers know what to expect at about any IAVM, describe some of your purchases, an experience, or story with any particular vendor, person, another customer that stands out in your powerful, insightful, wisdom-laden mind. 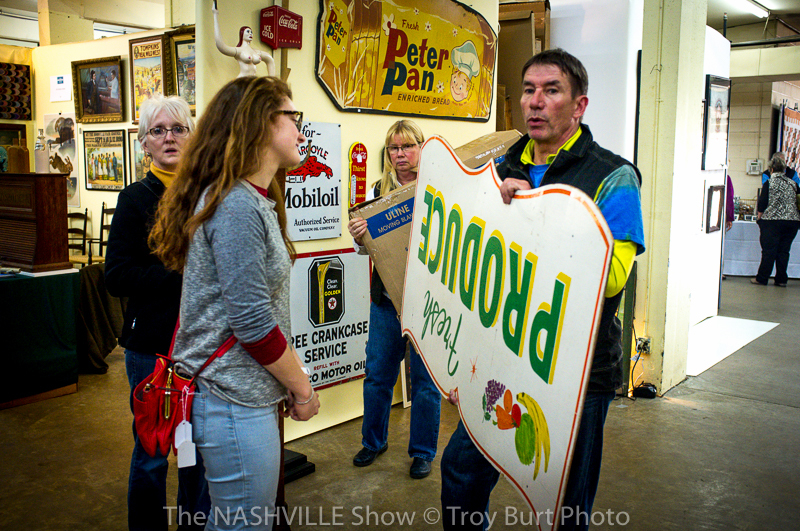 Steve: I have purchased a few nice items from the show over the years, and always enjoyed the people there. Outdoor shows are always special to me, it reminds me of my youth, searching for treasure in the hot sun and enjoying endless possibilities. 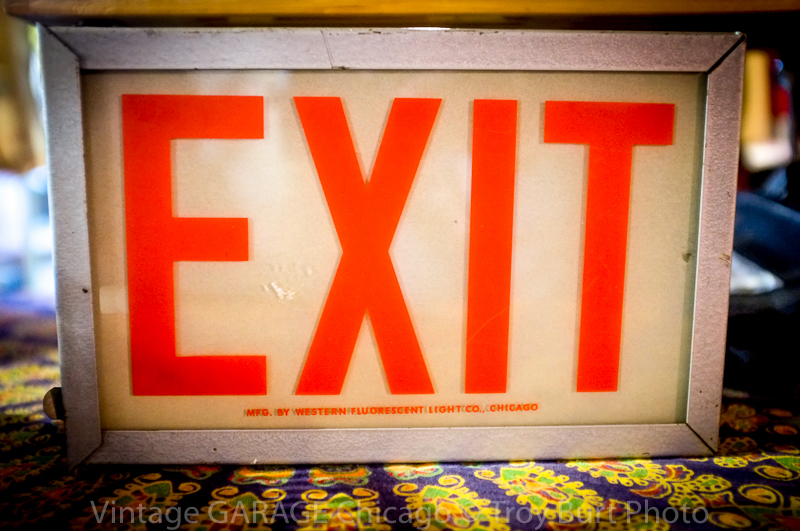 IAVM: How would you advise future customers in regards to what to do, look for, or how to prepare for the IAVM? For example, I have this elaborate ritual that involves beer tabs and banned books, but I don’t want to steal your thunder. What would you advise? Steve: Get there early, always make a fast pass through, then spend time looking more closely. Thanks again for taking the time to do this! We truly appreciate your support! Also, I hope as a customer or future customer, savvy and sophisticated as you are, you take the time to drop us a line and let us know what you like or would like to see at the Indie Arts & Vintage Marketplace! Be like Steve and come make history with us! Join us for the first outdoor show of the year (Steve’s favorite)! Troy’s art still hung over the fire place, we got a super informative behind the scenes tour of the overall operation, I think I pretty much know everything about everything now. The owner Michael was an outstanding host! 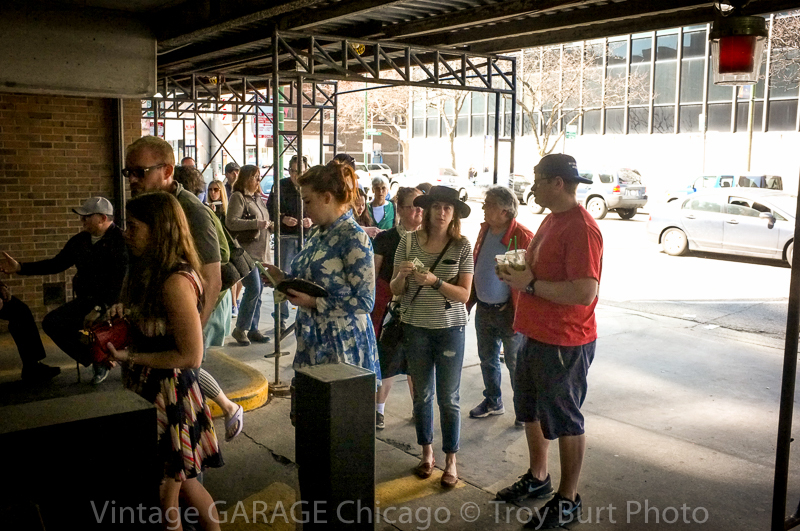 As vendors we expect, even take for granted trivial, simple things like good weather and large crowds. I like to think sometimes there’s beauty, complexity, even genius in us not knowing—the passion is that vast. 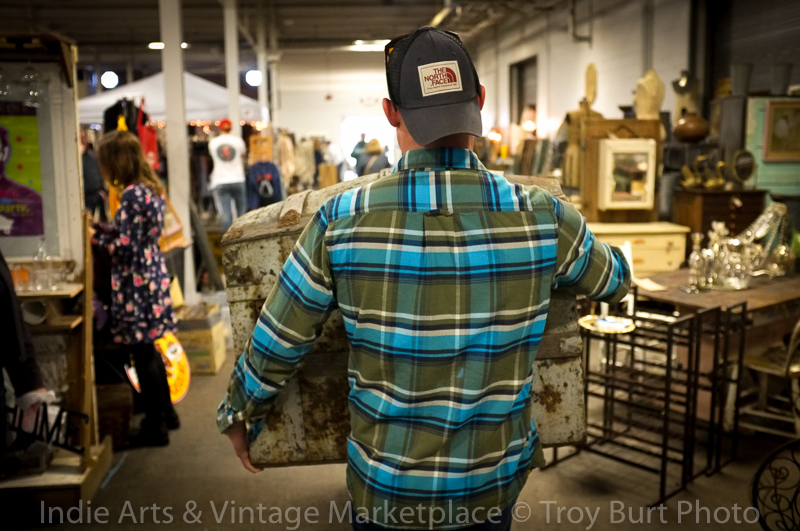 All we could do that day, April 9th @ the Indiana State Fairgrounds was focus on providing quality customer service and hawking quality wares at hard to beat prices. Think of the old west, gunslinger riding in next to a stagecoach pulled by a horse with blinders. Imagine the focused, patient vendors, each a horse with blinders. But healthy beautiful horses, Mustangs even! with nice teeth. We just go. Blind as we were, we had no idea how amazing that day, April 9th @ the Indiana State Fairgrounds was going to be. I tell ya, it was better than trading tobacco! If it were a story, which the happenings seemed liked some kind of agreed to, legal, “train robbery” from the Old West, it would be told like some kind of event merchandising version of the opening scene of “Saving Private Ryan” settling to a plot somewhere between Wyatt Earp and Billy the Kid. Maybe even Season 5 episode 14 “Three Wishes” The Andy Griffith Show! Friday load in was like a lot less like a Clint Eastwood “Six gun in my hand” western and a lot more like day in the life of a Mayberry Barney Fife. Not that I’m complaining. I totally relate to a man who carries only one bullet. But, holy horse drawn carriages, Batman(? ), most of us loaded in rain and snow, only to be occasionally teased by the cunning elusive sunshine. I booked two booths, more than my usual one and had a huge task before me. We were anticipating record numbers and our customers were anticipating the best stuff to date, including gardening—everything. I had a display to build and arranging and decorating to do, but I was riding high because I knew Saturday would be great. Overall Friday did go smooth, load in happened and most vendors Saturday morning were starring sunshine in the face. By 10:00 AM the lobby was packed, when the doors opened I noted the look in everyone’s eye. It was 1880 all over again. The wild west “land grab” was under way. 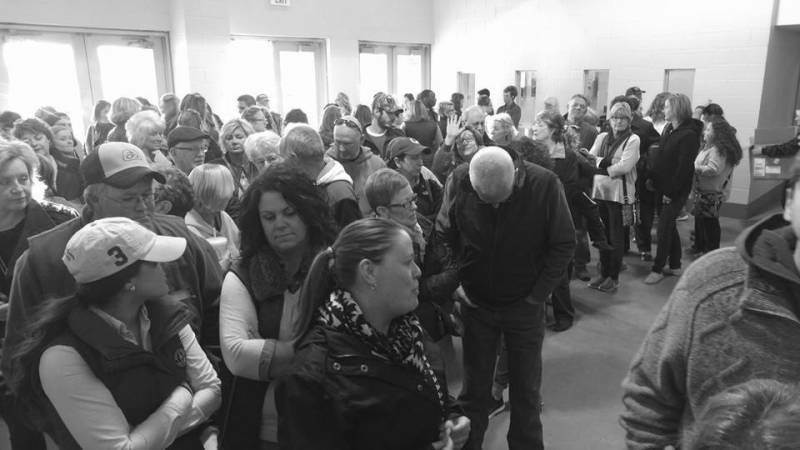 The customers came in large roving packs, ready to buy, the dust never truly settled, everyone knew they would find exactly what they were looking for. Many staked a claim in my booth. The lovely Melissa still has the vapors. We were inspired. Our plan had worked. Zach and I had to circle the wagons, we didn’t know who would attack (buy) from where! Eventually we came up with a plan…to sell more! By high noon tensions were high. 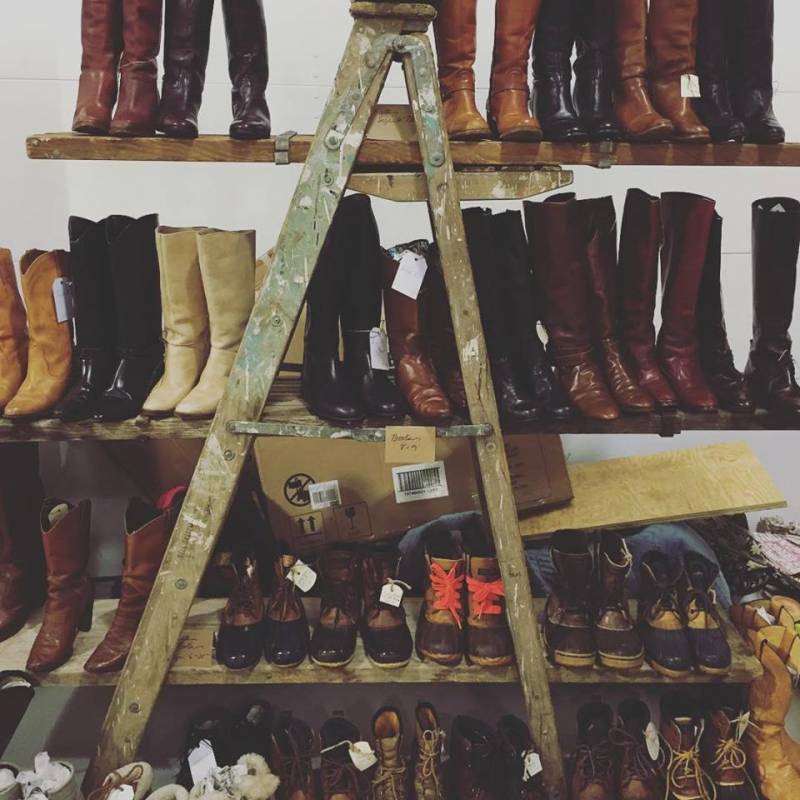 Every boot and spur that hit the floor caused another customer to draw…out their wallet and buy again! I knew it was only a matter of time before some unknown gunslinger ambushed us on the trail into the canyon and jacked all our inventory. It was just then it happened. And, I knew it, at the OK-Corral! Some smooth veteran (from Michigan, figures), he’d been paning his claim all day and had tuned up some nice color too (green)! But his guard was down, he was tired. …And, there he or she stood, like some kind of dream from a lawless, gunfighter lawman or law woman plains myth, eyes like a hawk, skin taught, baked from the sun and sheen from the dust and sand, lean and long, six shooters on each hip, hand drawn. Michigan-Man looked up, still in the throes of his last deal, surprised, dumbfounded, unarmed, “I’ll take it all”, the stranger said, and it was all over. The town clock rung twelve and on its last strike Michigan-Man had made the deal. He sold almost the entirety of his booth. I’ve heard of this happening, but to see it! “Bend an elbow” means to have a drink, as in “She’s been known to bend an elbow and buy amazing artisan wares!” Because that was happening too! Everyone was merry, we saw lots of smiles, and merchandise was moving. Even Bird Man was back with his amazing bird houses! Rest assured there’s a featured vendor in the works there! Lots of people were swarming the jewelry! I saw lots of awesome pieces. Still a little sore I didn’t pull the trigger on that silver cinnabar ring! The live music was an excellent, welcome addition to the show. Lots of familiar rockin’ tunes were played that kept lots of us singing and moving, it was the perfect backdrop for the event. 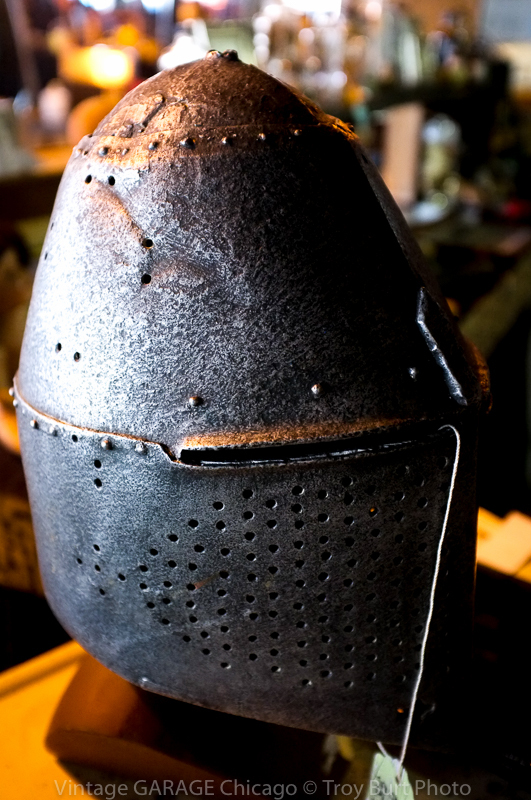 Michael Burt, Heartland Vintage had this helmet at the last show. I really like it and want to own it. I imagine myself wearing it, but I know if I bought it and wore it everyone would think I was super radical and would want me to do tricks and stuff. Overall the April 9th show at the Indiana State Fairgrounds was perfect. The event staff was awesome, the customers always the best, I had some cheese fries, by the time it was all over the exhaustion meter told me we had done well. Aside from the generalization and weak descriptions, let the rest of the tale be told through the eyes of Troy Burt and wonderfulness that is his photographs. Approaching our fifth year, as a vendor I can say these Indie Arts and Vintage Marketplace shows always maintain and are always the best! If you were on spring break or couldn’t attend, no worries, join us May 7th @ Broad Ripple Park for our first outdoor show of the season! It’s going to be awesome! 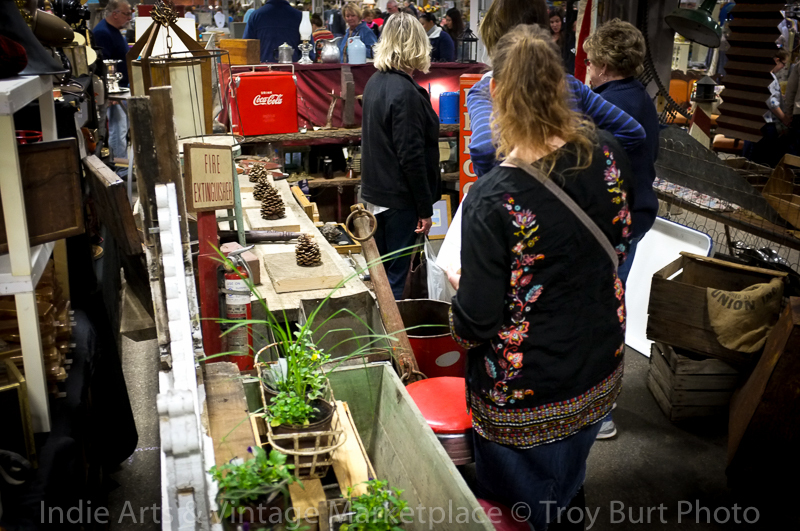 The Indie Arts and Vintage Marketplace at the Indiana State Fairgrounds is set to go off April 9th and it will be the most awesome vintage spring garden show spectacular in the city of Indianapolis of the world of the year—decade! Hyperbole works! And how lucky for you, this is the preview! Just a quick heads-up, you might want to bring that super bestest, coolest vintage appreciating BFF friend in the whole wide of the world! It’s going to be that cool! Looking ahead, I can already see the awesomeness. Our numbers are huge, high…high, and the competition in terms of what the vendors are bringing, the bestest—coolest stuff is extreme (that’s a real award we secretly win)! There’s probably enough artisan wares for everyone, but it’s going to be a scenario where you better buy it while it’s there. We bring lots of cool one offs. Kind of characteristic of the artisan thing…JS. All of our vendors are ready for spring. The ISF is a spacious venue. The isles are wide and ceilings are tall. I’m bringing a special spring only display that will utilize this height. I’ll hint at a white chippy paint arch. The brick backdrop and thinking about how this spring garden display is going to look gets me all giggly. 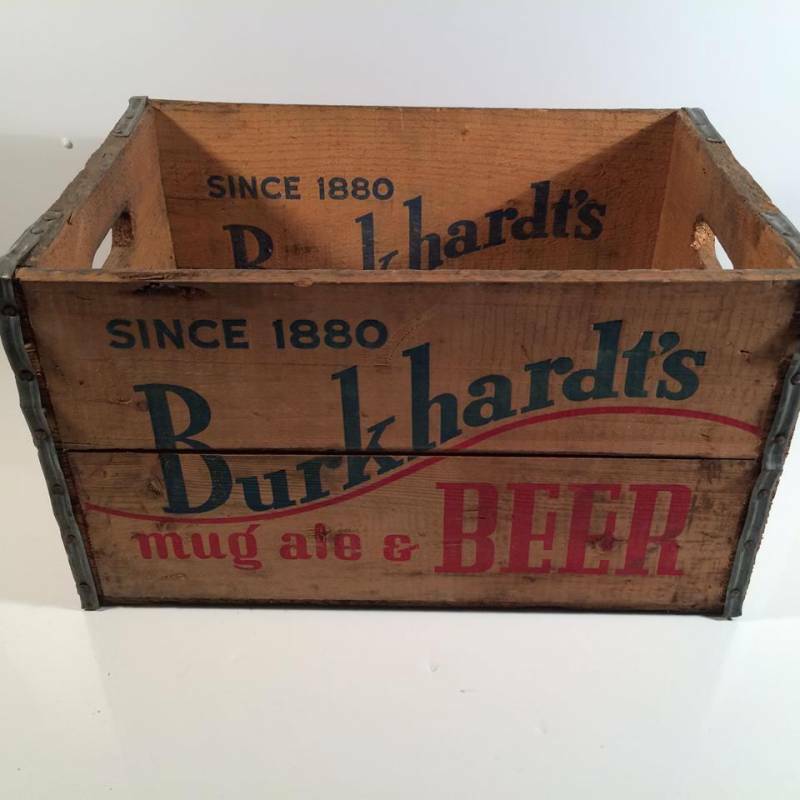 I just reviewed several of the vendor sites and I can safely say, I’m seeing lots of perfect spring ephemeral; galvanized buckets, tubs, wooden boxes, everything and anything you can plant a flower in, and lots of cutting edge design trendy stuff like upcycled flower boxes made from barn wood and tin roofing. Nan’s Treasures is a first great example of what’s going on. 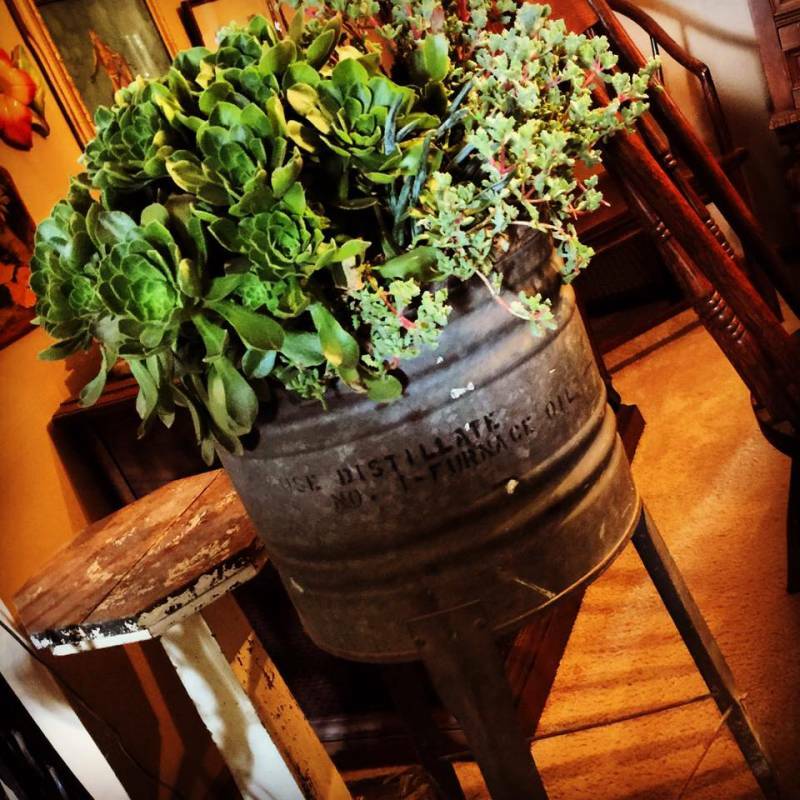 A veteran IAVM vendor, Nan has a history of bringing lots of cool knick-knacky vintage spring stuff including this planter design arrangement posted below. Her wares are hand-made and she takes custom orders. 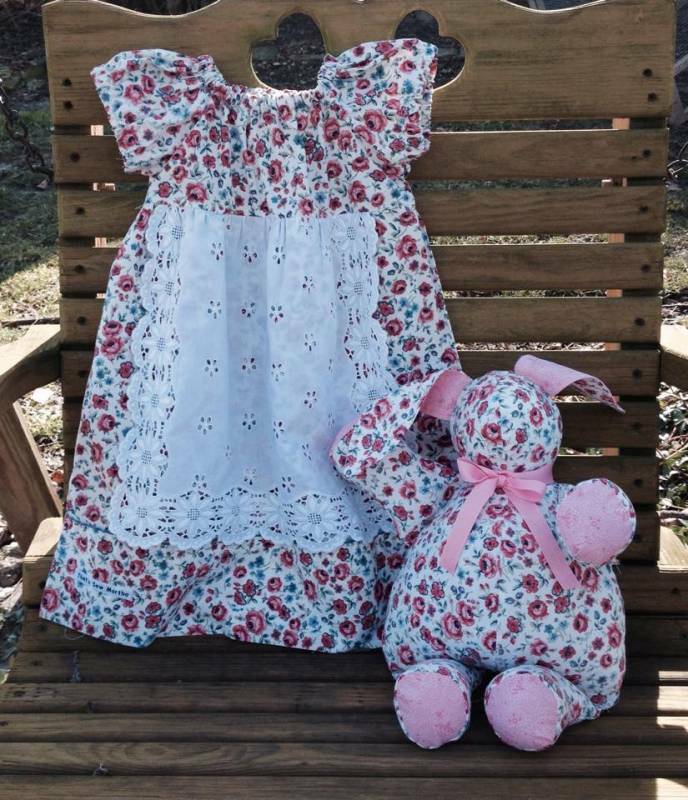 The photo below is from her Facebook page, please give it a like and a share and make sure to patronize her booth at the show, you won’t be disappointed! Queen Bee Vintage will be there and they have lots of spring fashion and decor. This “Glitter Beatles” necklace is great example fresh off their Facebook page. They have a store in Indianapolis so this little gem may be gone by show time, but rest assured, lots more “super cool” stuff will be coming. Visit and like and share their Facebook page and buy lots from them at the show. Always buy lots from cool awesome people. JS. That’s the caption for the shirt or blouse or whatever below. You may not know this, but I’m a balding 40-year-old male who wears nothing but college-aged concert tee-shirts and holey jeans (Nirvana rocks!) My sense of “fashion” is slightly askew. I am not qualified nor do I have the words to express the awesomeness that is their stuff! Please visit their booth and buy everything! Also, visit their page and give it the old like and share! 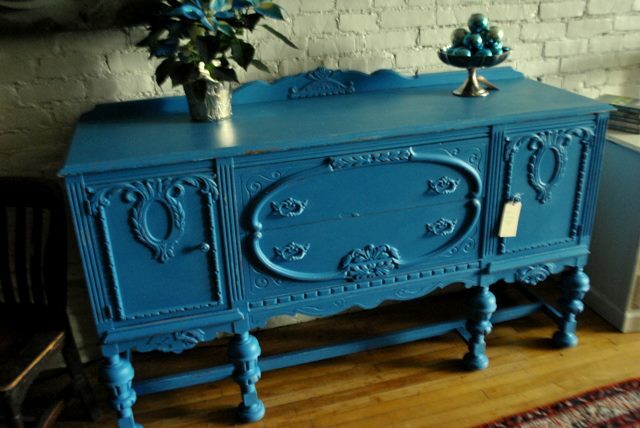 Flea Market Chic offers a bright and beautiful array of spring laden furniture and décor. I’m so glad they are coming. They bring stiff like this “Believe” sign pictured below. Visit their website. It’s worth checking out, you get a good sense of what they truly do. Their custom designed furniture (and combining elements) is what defines them. They’re also the reason to bring a truck. Customers love their stuff. Bring the truck! 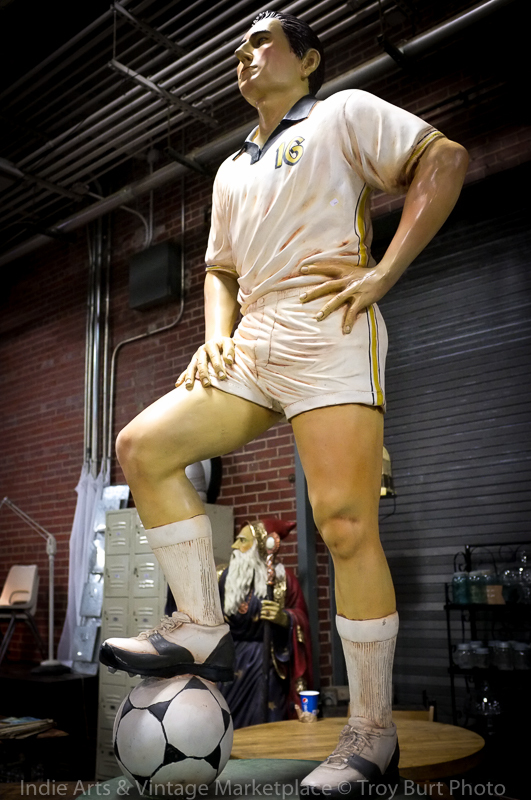 The folks over at Love Shack Collectibles tend to bring a little bit of anything and everything (in the vein of collectibles). They have such a good eye and I love their diversity. I’m sure you’ll find something you’ll just need! And like the rest of us, we all bring stuff that accents the vintage spring theme. Rest assured, you’ll find something in their booth! Give their Facebook page a like and a share! I personally enjoy this old Big Boy! My best friend in the whole world and event photographer, aka Troy Burt of American Farmscapes has been preparing for this and he posted this gorgeous arrangement just yesterday. Go give his Facebook page a like and share and take a moment to savor what’s there. I know he’s been out picking too and has lots to showcase. You’re going to want what he brings so visit his booth first after mine. Dude has an eye for design and is extremely talented. Retro 101 is on board, whoo-hoo! 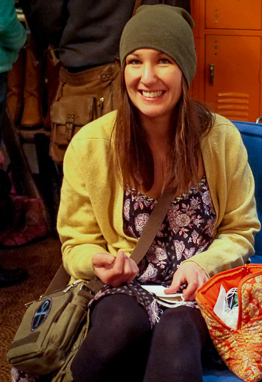 Heather really has her finger of this whole warm weather spring thing “what to wear”. I guess white is in, again, don’t take my word, I’m lucky to wear pants. But, check out this blouse (pictured below). R3 Framed Magnet Boards will be featuring their very best in spring design! The vibrant spring colors and organic patterns pictured below are the perfect example of what to expect. I think these are fun and I bet the kids would enjoy them too! And to help fill the 1200-word requirement for this preview, bless the preview, let me just say the “R3” and “Magnets” in their name makes me think of a strange amalgamation of two important (Star Wars) robots. Which is pretty cool. Like them. I’m curious what “R3” really means? 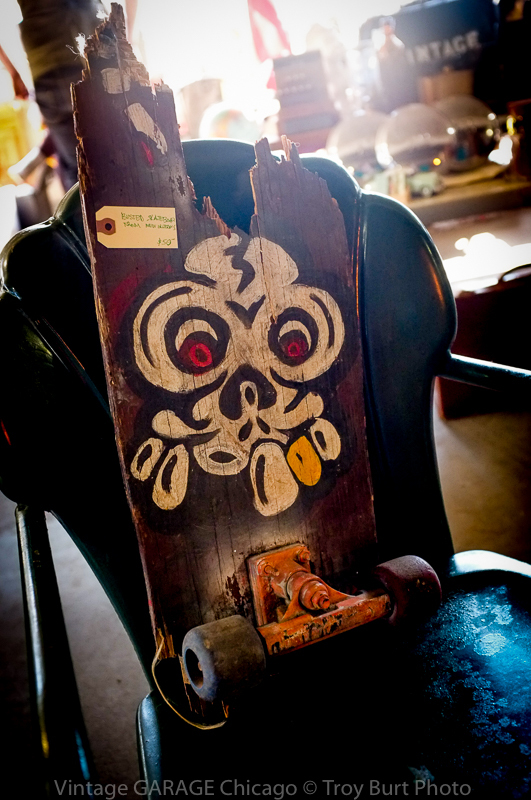 Give their page the old Star Wars like and share and buy their boards by the pallet load. Though I don’t think we rent fork lifts. JS. The Crazy Sardine is on board (out of the can)! They so crazy! Just today they posted this crazy thing below, which I can only imagine is a crazy dragon sardine with the caption “Sold!” Whatever that craziness means, “Sold”? Probably means they sell the coolest stuff known to woman and man-kind, and let me just say, it’s crazy. Crazy like a sardine. Like sardine crazy. Like sardine crazy me living down by the river in a van crazy. AND! The Crazy Sardine likes spring as well (sardine is a spring fish, I think) so definitely visit their booth, buy their stuff by the millions (hyperbole is crazy and a spring term)! Bring the crackers, woot! Spring furniture! 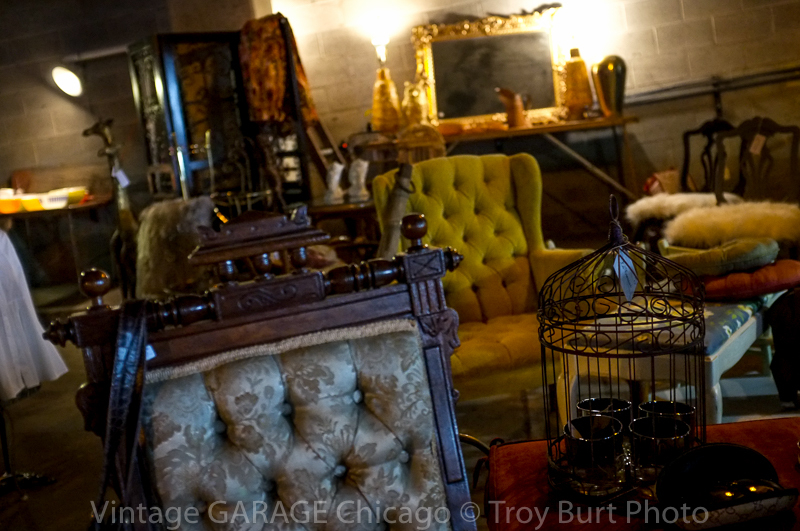 The Restored Garage specializes in restoring vintage (spring) furniture! And, because it’s spring, they are (probably) bringing spring-ish furniture! 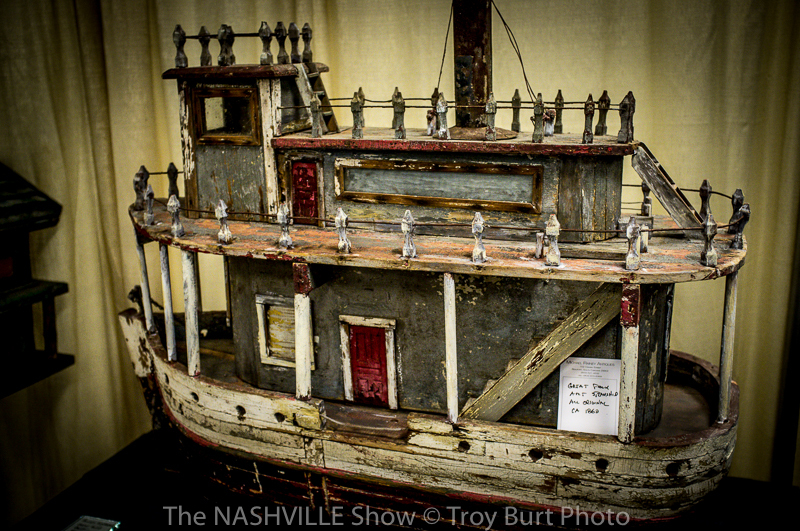 Below is a before and after picture of their work, and something similar I’m sure you’re likely to see at the show. They do amazing work. Do yourself a solid and visit their booth. 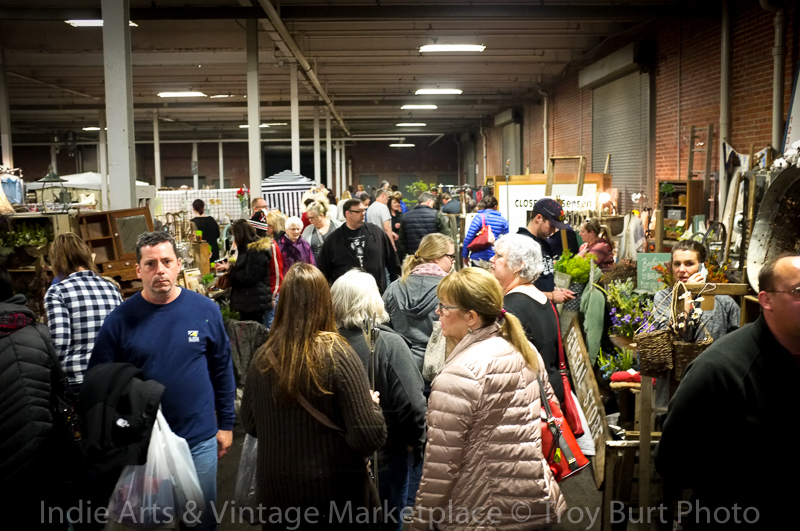 I think I counted something like a million, I mean 100 plus (more like a million) vendors for the April 9th spring spectacular. I can barely count. Regardless, I’m going to stop reviewing vendors because my reviews are probably doing more damage than good. The definitive vendor list is published on the IAVM Facebook page (listed below), if you’re curious about a particular vendor, send me a message and I can let you know. I didn’t see Hoosier Sisters on this one, I know they’ve been picking Round Top in Texas. They may be out of town for the next show, but rest assured much of what you like and love about the IAVM will be the same. I’m bringing lots of guy stuff (who cares if I wear pants!?) and I know many of the names on the list are old greats, veteran vendors who bring only the best stuff. 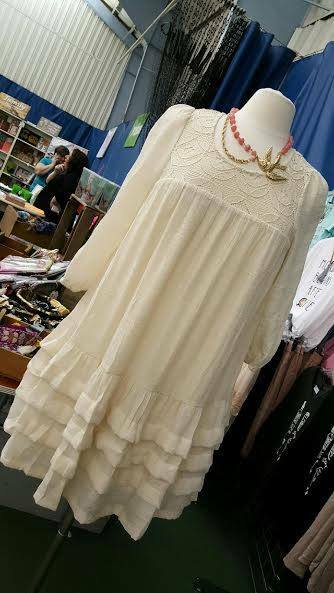 There will be lots of vintage “cool” and tons and tons of spring goodness. Tell a friend, bring a friend, drag your husband (he has to wear pants). 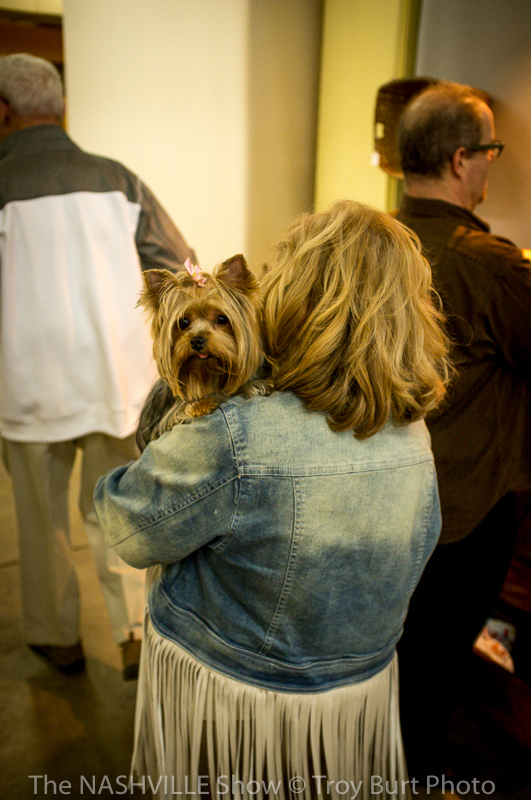 We’re pet friendly and kid friendly and there’s a five-dollar admission at the door. It helps us big time when you do this. And that’s it. Spring and warm weather is upon us. Next show is outside May 7th at Broad Ripple Park, our new outdoor home. Visit the website for the summer schedule! We’re also joining the First Friday Food Truck festival so you will want to read up on that. It’s a totally new and separate show and you will want to be a part of it. As always, thanks for reading and I hope to see you all there! One of the things I truly love most about artisanal wares is the locally made aspect. You’re supporting local business which goes right back into the community. More importantly you’re supporting a larger “Made in USA” initiative. And, this is no political commentary. It’s a plain and simple fact, folks like you and I are filling a void where the larger economy is missing out. I joke with customers that ninety percent of what I sell is made in the USA (to make a sale point, but it’s true). 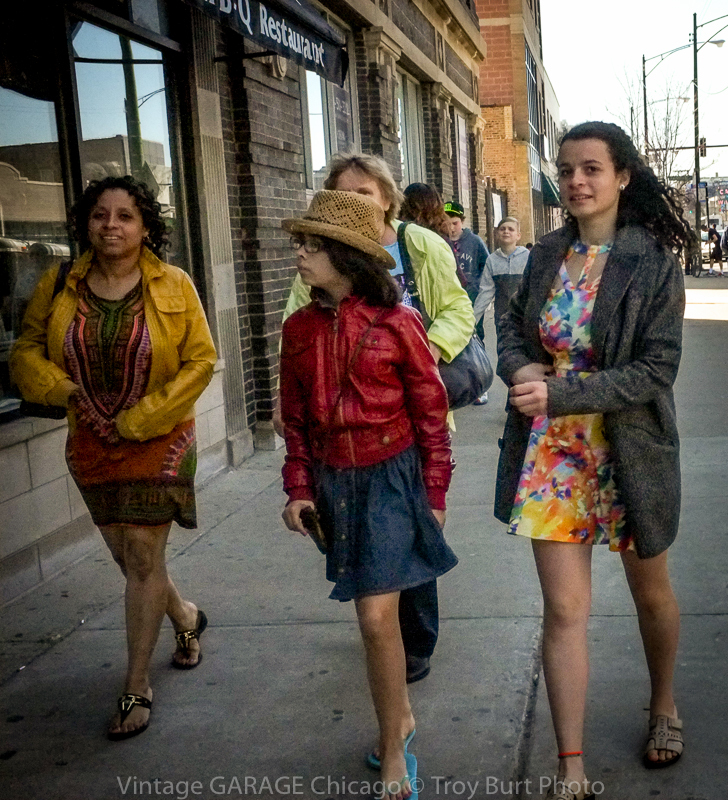 When you buy vintage and handmade wares you’re supporting families right in your neighborhood. That guy in the old building with “Open” flags and old dressers lined up on the walk is not investing overseas. He’s paying for a dance class or hospital bill. His kids go to the same school, he keeps his yard neat and clean because he’s proud of his community. And, he’s taken it upon himself to continue a tradition—a good thing! That’s the guy that keeps America great! And, when you take a moment and actually step in and see what’s going on, as a customer, you’re doing the same thing. Coming to events like the IAVM and spending a couple bucks, you are supporting local business-folk, real Americans, your friends and neighbors who are keeping the America we know. 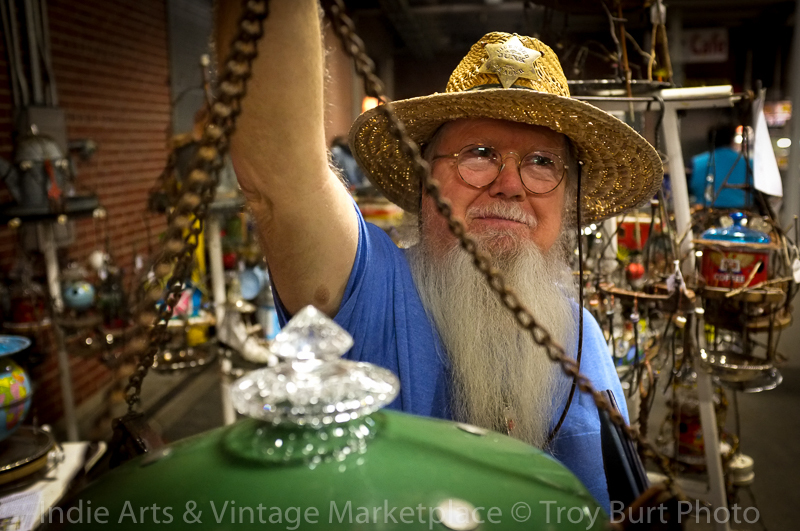 And, it’s with that thought that I introduce this week’s featured vendor, Larry Lawson, the guy who makes stuff out of old bicycle parts and my personal hero. Larry is the embodiment of what I’m discussing here. He’s a good guy with a good sense of humor and skill—Larry knows his stuff. He kind of reminds me of that favorite uncle who shows you how to work on cars. He’s specifically knowledgeable about wood(s), bicycles, and everything. 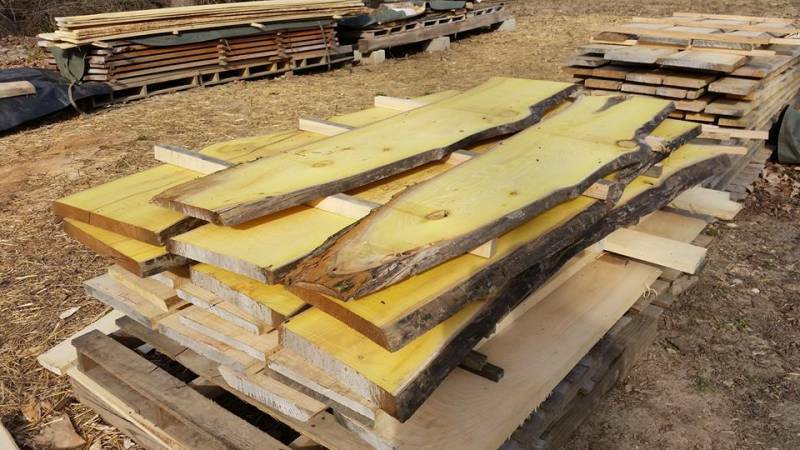 The other day he posted a photo on FB of a saucy pile-O-fresh wood he had just cut into yellow, delicate yet thick, bold live edge planks—I carry a drool cup for just these very occasions. I had to stop what I was doing to absorb the moment. I studied the picture carefully. This guy is a guy of my (our) blood! 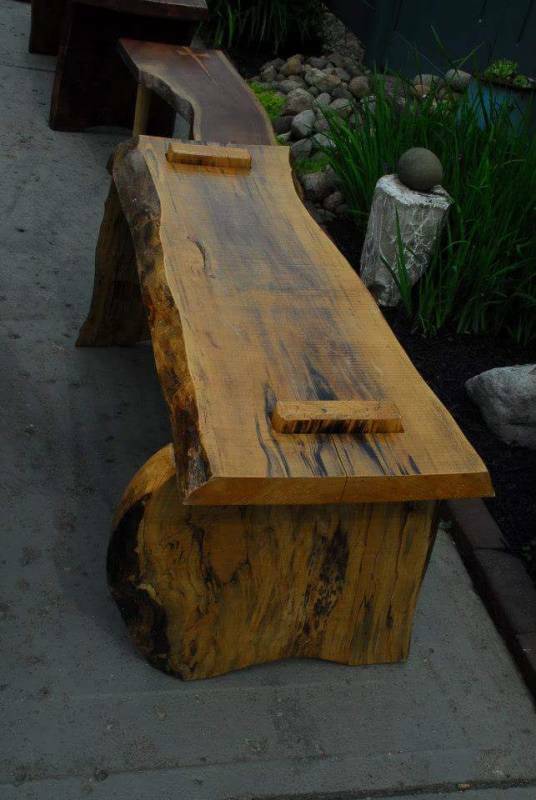 Wood, metal, and most importantly creativity. You don’t meet many people with Larry’s creativity. I would never steal his ideas but I want to. Pennies tumble from my pockets when I pass his booth. Robots, he makes robots too! Wonder if does overlords? 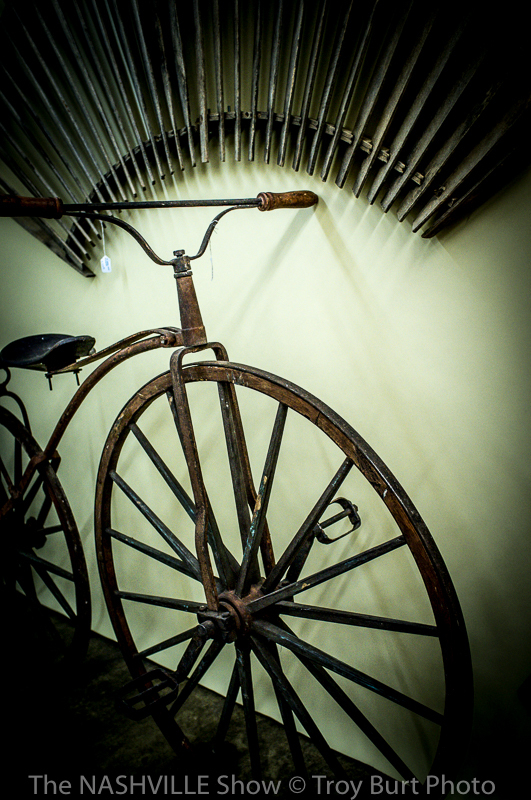 As an antique bicycle guy and someone who appreciates and understands wholly what Larry is doing, it with a great honor that I share this interview. As much as I can praise his work, his words and pictures are the only way to truly tell the story. 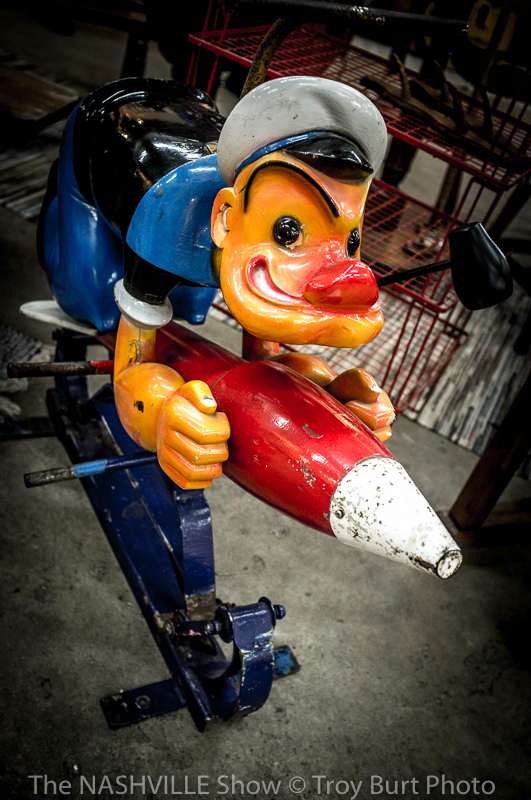 Larry Lawson: aka Folk Art Bicycle Robot Guy Who Sports Good Wood! Note, this was a conversational informal phone interview and I will be relating and rephrasing what Larry and I discussed. This interview was just so amazing that I couldn’t fit it into the boiler plate. The only stock question we didn’t discuss was price and I can answer that, reasonable and worth it. 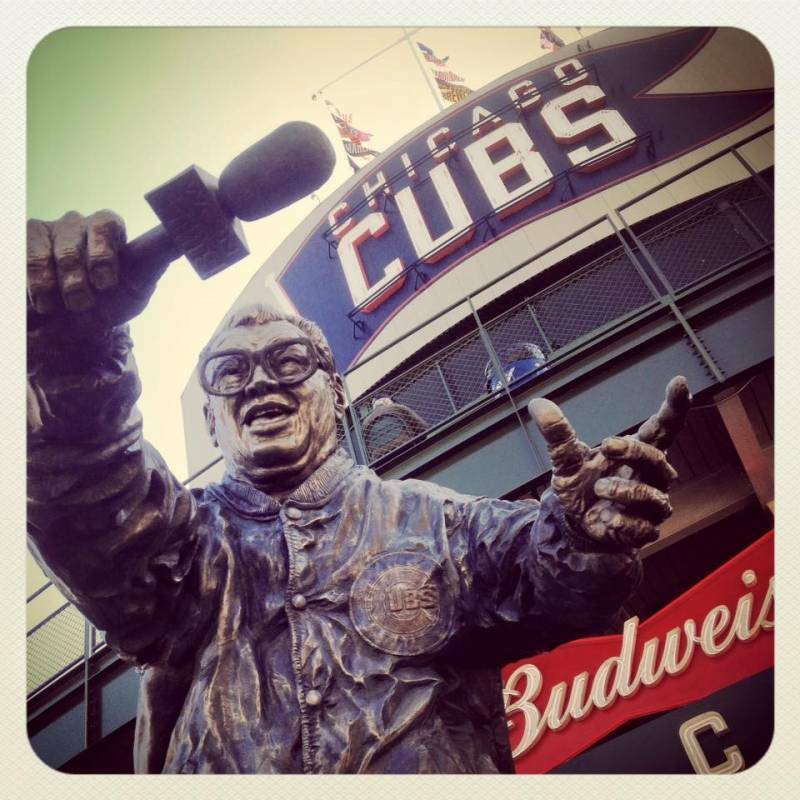 IAVM: What inspires what you do? And, a little more specifically, why did you start doing this? Is this something you have always done? Larry Lawson: Fellowship and promoting the hands on, community aspect of the arts is what inspires me most (referring to the IAVM). But, as an artist I’m greatly influenced by nature. I absolutely love the randomness and independence nature represents. In fact, I’ve published two books on deer and I’m a naturalist certified by the State of Indiana. To answer your other questions, I’ve always had the designer’s eye, by the time I was twenty I was in the military in Europe studying design. I went to arts shows, museums, eventually attended University of Maryland at Oxford Germany. Later, I attended Ball State where I received a degree in art design. But, what you have to realize, that was all to help or foster what was already in me. I’ve always looked at things; life as how can I make it more beautiful. It’s with design that I see how to do that. IAVM: That’s amazing! As someone familiar with the bug for design, I can completely relate to what you’re saying and I’m a little blown away by it. In fact, that’s an excellent lead in to another comment you had made. You stated that all of that training combined with the sum of your total life experiences has helped to you find your “artist’s identity”. I must say, I absolutely love this concept. Can you explain a little more what you mean? Larry Lawson: At some point I fell into a place where I just knew this is what I wanted to do. I have to stress again the importance of fellowship in the arts. I love the community. I love to share and work with other artists. Art has given me independence. 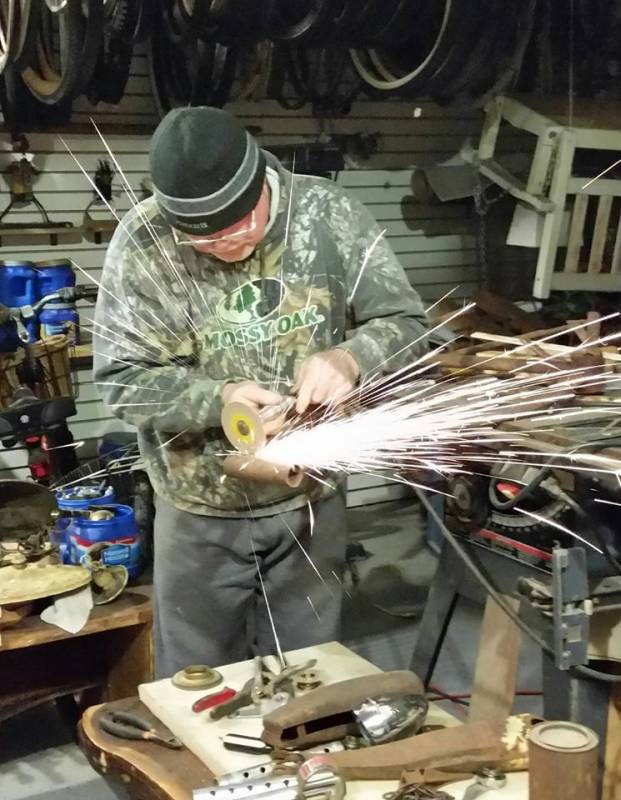 I have a “tent” compound that encompasses a saw mill and all my wood, tools, supplies, which is powered by a generator I rigged up from an old tractor. I make my own electricity. I have all the wood I could ever need. 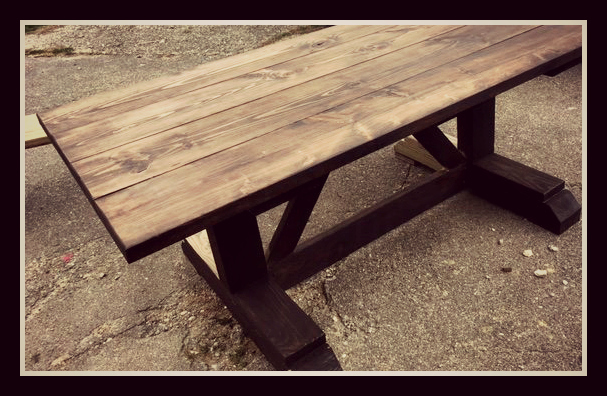 We salvage it from the city, old barns, farms, anywhere where wood is going to waste, we take it and repurpose it and give it new life. I create something from two mundane pieces and create something beautiful. And, I have the tools and everything I need to do it. I have complete freedom to make beauty in the form of art—any way I want. My “artist identity” is that. Independence, freedom, making things out of junk. I didn’t know it until I found it, and rest assured, each of us is searching for it and we usually don’t know. But, that became me and I became it. And, now that’s what I do. I also make custom orders and I design pieces to sell, but a big part of what I do is cut wood and gather materials for other artists, we collaborate and work together, my network also extends internationally, especially if you consider the custom bicycles. In a great way I have become connected to everything. Larry, when I visit your booth I see that. 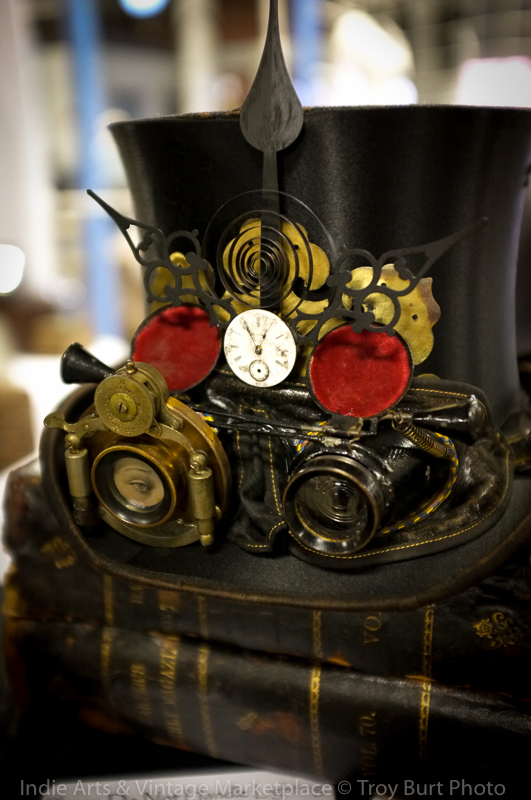 I can see the attention to detail and love you put into each piece. Larry Lawson: The thing I tell people that sets us (artisans) apart from the rest is the quality. Aside from getting the essence of a guy’s whole life in piece, you’re actually getting something that is very well made and will last a lifetime. While, my pieces like tables or furniture are functional, it’s also art and I want that to never go away so I put everything I have into each piece. IAVM: I see that too, Larry. I can’t stress enough how much I admire your work, specifically, the craftsmanship and quality. I strive to be someone who can do it like you do, and I thank you for that, I fundamentally thank you for being the kind of guy that loves his community. The thing I love most about what we do is the community aspect. I brag on it all the time, but it’s a unique pleasure to share the passion and genuine love you have for all aspects of what we do. 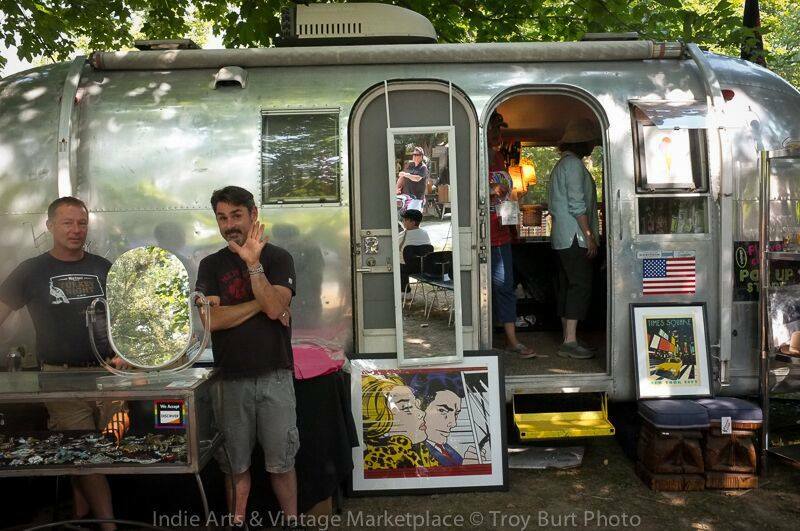 Larry Lawson: Let me note, that’s exactly why I do the Indie Arts and Vintage Marketplace shows. The interactions with the other vendors and customers is the guiding end of that inspiration. It’s where the whole experience comes full circle and you live in that moment, that’s for me total beauty, I call it bliss. I tell you what, Larry, you are an inspiration too and its interviews like this that keep me going. I knew I already loved your work, but now I know what goes into it, I can’t help but love it more. 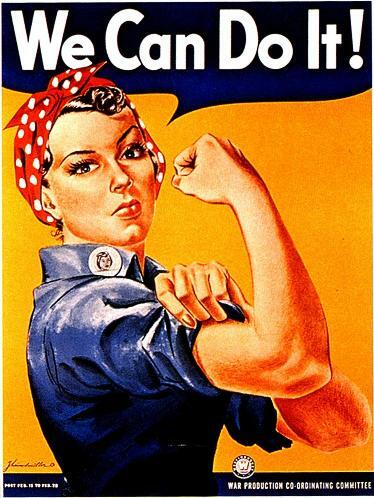 Again, thanks a million for sharing this and inspiring us all (and keeping the American dream alive). I’d like to end this interview with stressing why it’s so important to support people like Larry and the local arts in general. Larry and I both come from backgrounds that involved stuffy office spaces and general corporate muckiness. At some point in our lives we both chose happiness over convention. We both chose to follow our dreams and do the thing in life that made us both happy. 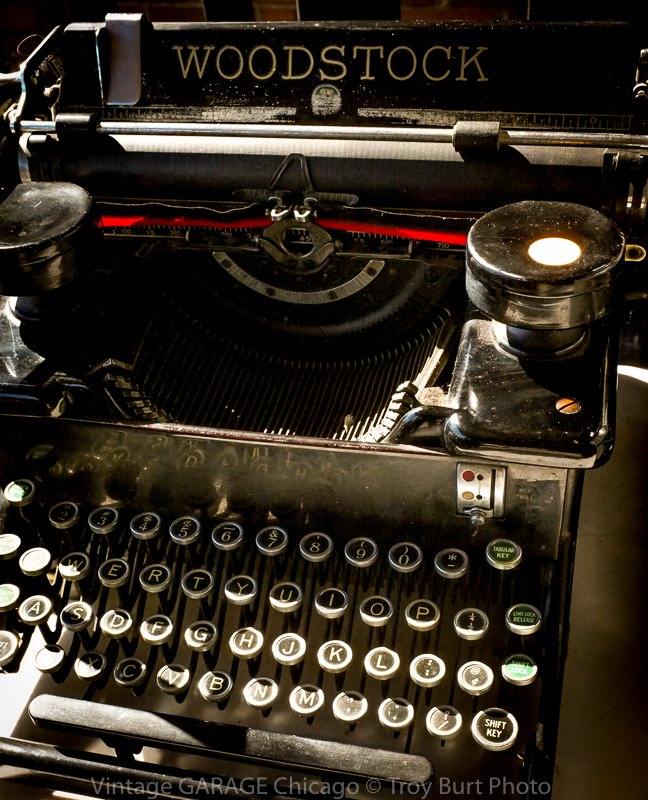 For me, my artist identity became “writer”. For Larry, it became badass. Larry’s interview, though I had already long ago made that decision, reaffirmed that that the best thing myself or anyone can do is follow your dreams. Do good things and make life beautiful. I’m sure Larry agrees, find your artist identity, because you will never regret being happy. Fundamentally, visit him at the show and buy his awesome stuff! Ask him some questions too. The guy will blow you away. 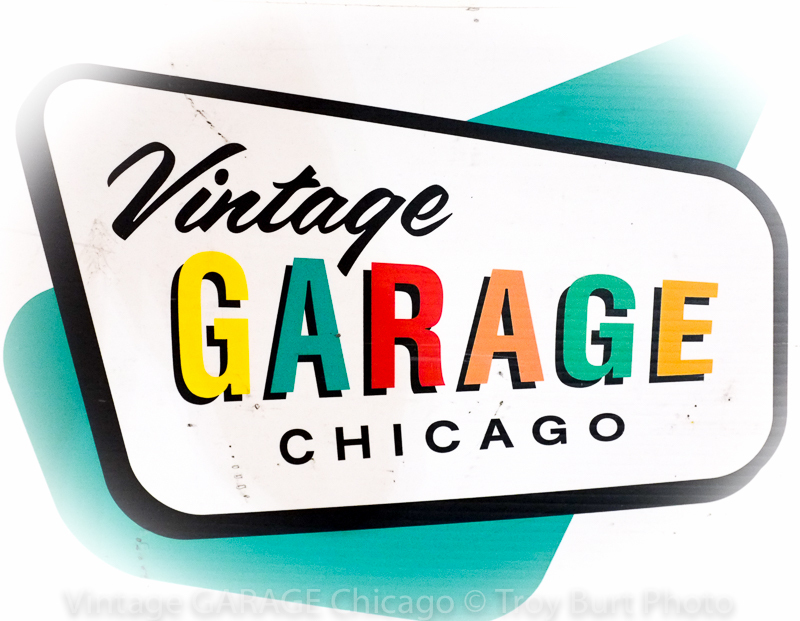 New venues, old favorites 2016 promise to deliver a summer of pure, cool, vintage, flavored awesomeness! We’ve got ‘Breaking Bad’ mad chemist hair from cooking up the best-show-schedule ever! Just returned from the desert with an 8 show summer lineup sure to—Blow! Your! Mind! 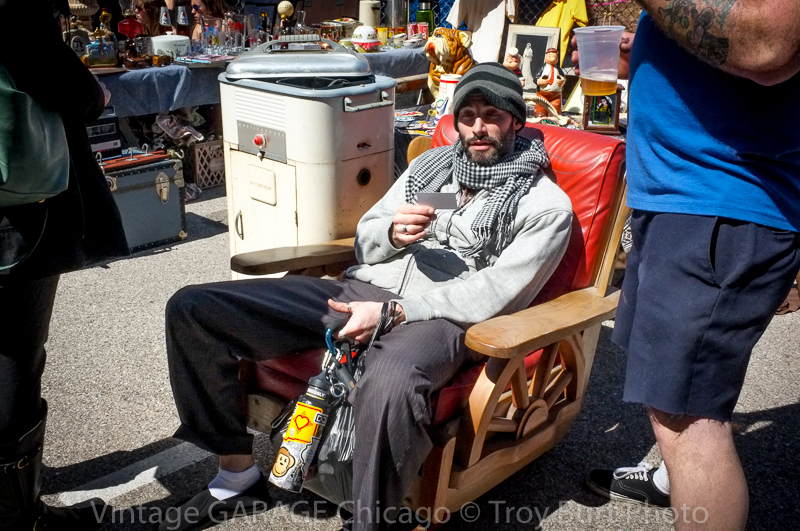 Not me if you’re wondering (that’s one of our cool summer vendors), but check it! The outdoor home for our summer shows will be Broad Ripple Park!! One of the city’s most iconic parks—in the world! Each of those dates is a Saturday and the show will run from 10 a.m. to 5 p.m.
We are also very excited to announce a new show location and format. 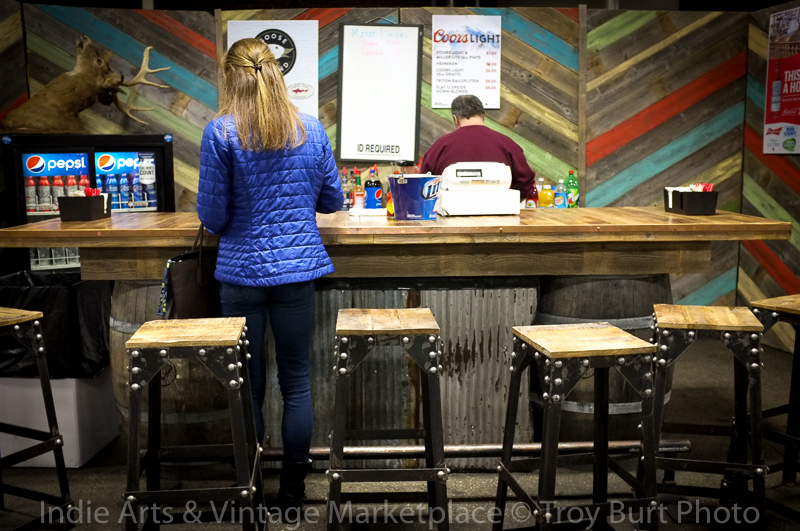 The Indie Arts & Vintage Marketplace is joining forces with the First Friday Food Truck Festival at Old National Center downtown for three shows, each will run from approx. 5-9 p.m. on Friday nights in the same parking lot as the Food Truck Festival. 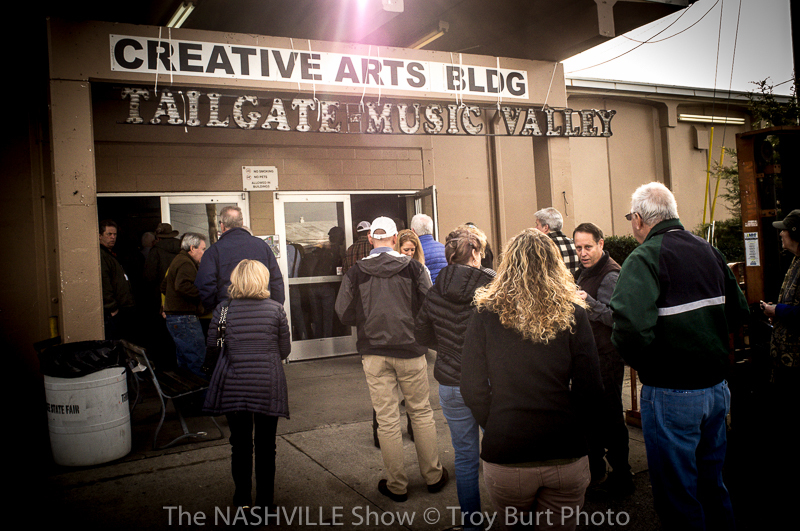 There is already a built in audience of several thousand attendees and we think the addition of the Indie Arts & Vintage Marketplace is a great fit for both events. 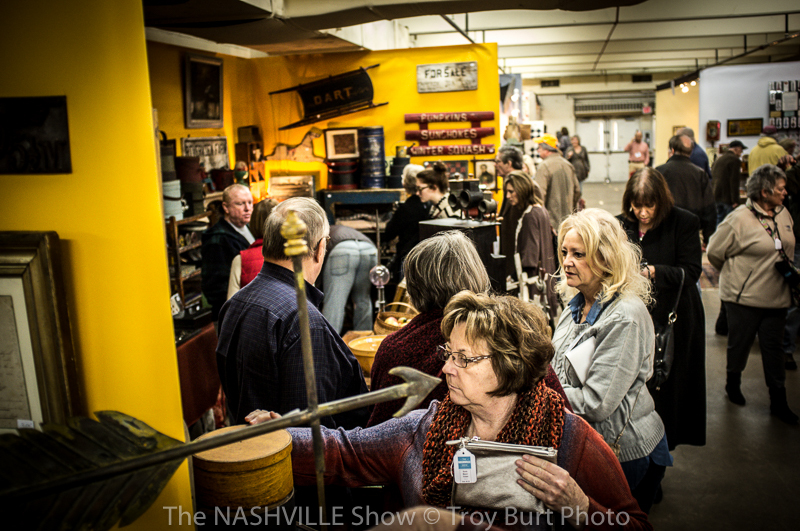 We also will have great intro pricing on the Indie Arts & Vintage Marketplace at the Old National Center Shows for 2016. Space is limited. 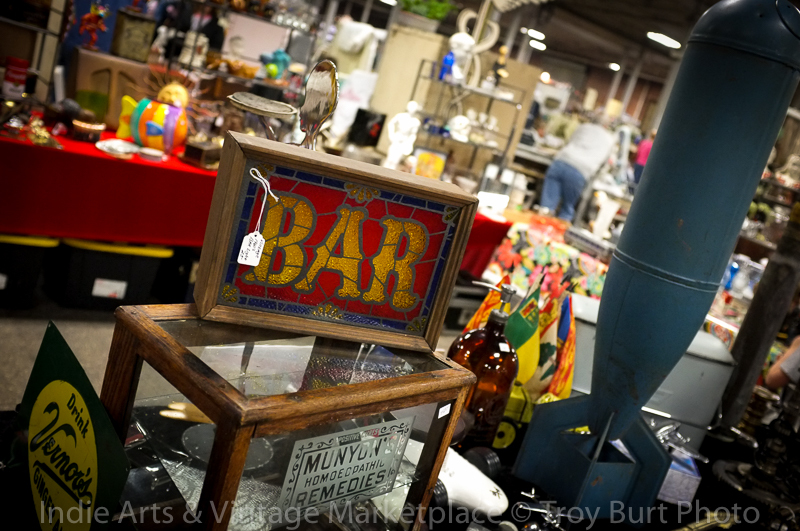 We are excited to announce the April 9th Indie Arts & Vintage Marketplace at the Indiana State Fairgrounds will honor the 100th running of the Indianapolis 500 by hosting vintage Indy 500 items and paraphernalia! 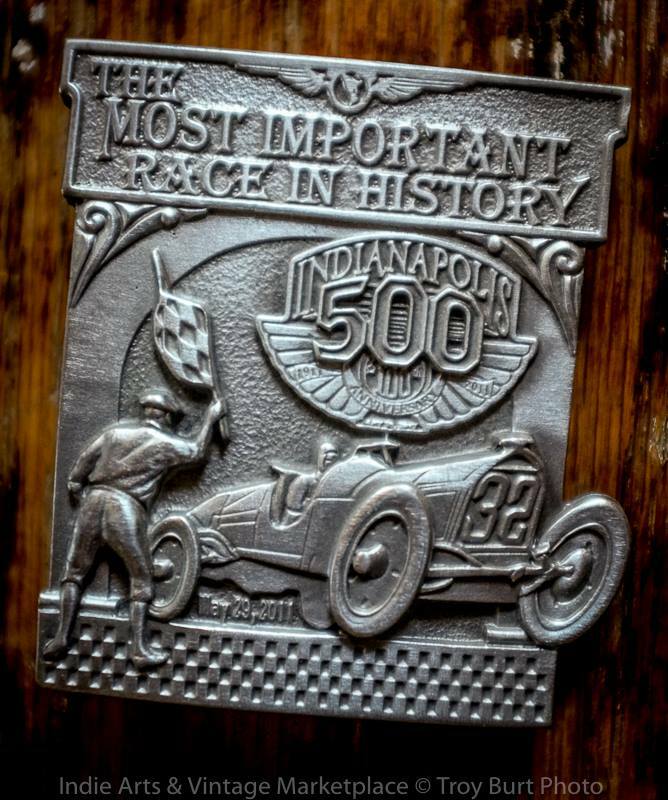 And, what’s more, in honor of them honoring the Indy 500 I have decided to write a special edition blog in honor of me honoring them, honoring the 100th running of the Indy 500! It’s called “Special Edition IAVM Blog: Me Honoring the IAVM for honoring the 100th running of the Indy 500! And, for some reason, “100th running of the Indy 500!” is very fun to both say and write! Anyway, you should feel honored! This month, instead of covering a particular décor or design trend, I decided to turn my sights on the impact the Indy 500 has had on the city and its people, including myself (not in vanity, but to make a point). This is a big move I know, I’m tapping into the realm of collectibles, but it’s okay, I’m wearing the sacred talisman of white chippy paint protection, I still sparkle. Seriously, though, the Indy 500 goes a long way towards making this city great. 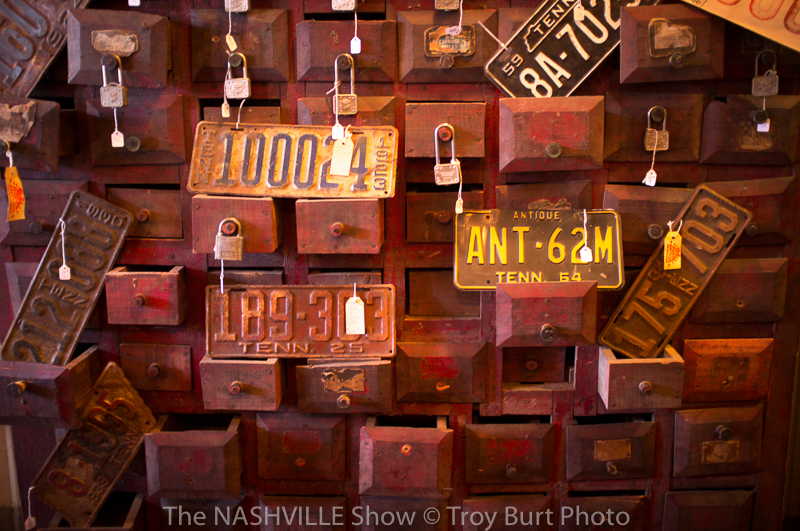 It defines us in the eyes of the nation and the world and the Indie Arts and Vintage Marketplace is a part of that, it’s appropriate to recognize it here and celebrate it at the show. It’s important too, to note, so please read this, when Troy told me management approved this move, well, let’s just say I gladly changed from the Swingline to the Boston stapler as part of the deal. And, as their champion pole sitting blogger, I thought it also appropriate to reflect as someone who is from Indianapolis and loves the race. I think I speak for all Indianapolis Hoosiers in this way. I grew up only miles from the track (explains a lot) and most of my childhood and early adulthood revolves in some way around the track. I have so many stories…but, if you’re from Indy you know. You understand and that’s why I’m covering it. There’s a deep and intense culture around the race in Indianapolis. I get teary eyed when I look at that photo. Dan was one of the best and his personality was genuine, he’d stop in a second to chat with you and take a pic. But, they were all like that, even Danica. Hoosier hospitality is infectious, and I think all of us think of the drivers, then and now, like family. Rick Mears could be my dad any day, just saying. Story after story example after example, you can identify. The Indy 500 was long in my blood since even the before time in the long ago. It was the true time of the Snake Pit. It was a family and neighborhood tradition/occasion/holiday passed on to my father and his father before him and so forth (think of “Stand By Me”, but in the context of the Indy 500). But, when I was a kid, it was a particularly magical time. 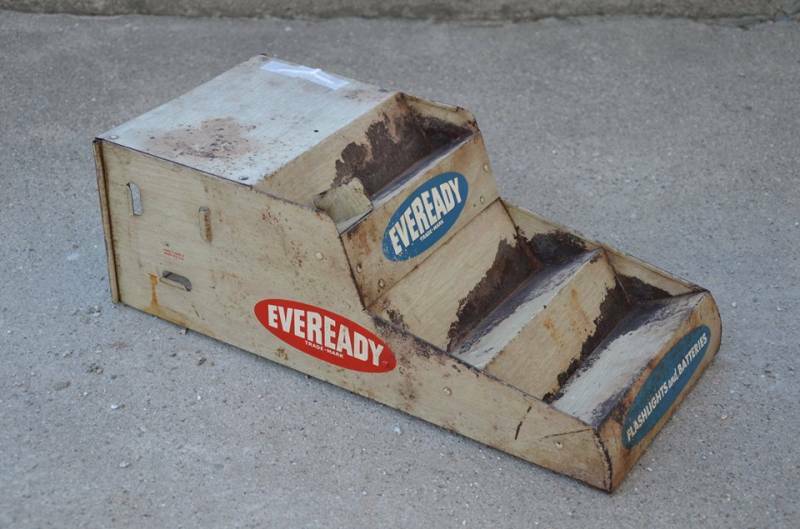 We had pool parties, betting circles, the neighborhood kids and me boxed off a half block or so and held our own mock Indy 500 on our big wheels and bicycles. We wore those red and yellow plastic race helmets with the flimsy, hard to see through black visors. My first real job was selling programs at the Indy 500. I was 14, I always note this first, I saw an unclothed female for the first time at the old Snake Pit (3:11 AM Sunday, May 31, 1989, just before setting up my stand), and just for the record, she was fully naked, Troy. I sold enough programs at that first race to buy my first car, a 1968 Ford Fairlane Fastback 500 with a 302, all white with original black interior. AM and FM radio! I saw celebrities, met race car drivers, hung out in the garages, pits, watched the race from a high dollar penthouse, I had a pass to everywhere. The above photo is the ever eventful after race clean up. Where everyone who works there gets to clean up the mess, but also finds all the valuable stuff you crazy drunk people leave behind. Three years later I was working time trials, four weekends in a row and race day, I was a veteran program slinger. Eventually, I was a face people knew. I had one guy tip me a 50 for being the guy who sold him his program three years in a row. I liked to hustle, “Programs—Programs”. I knew exactly where to find the best customers. A year later I graduated high school and moved away. I never had the chance to sell programs again, think of newsies, it was a kid thing. I always came back, carb day, concerts, time trials, race day, some people (not me) also liked to partake in a rather primitive, yet intriguing pastime, partying? I heard it took place at 16th and Georgetown (friend told me). Years later I moved back and volunteered at the parade. I eventually moved away again, but me and the guys still go every year, and I can tell you, I am looking forward to the 100th running! As I’m sure all us Indy folk are! We all have our stories and memories and I think the IAVM honoring the race next month is a great idea. Fundamentally, as a Hoosier and lifelong fan I would also like to thank them, and Jon specifically for making this happen. Many of us like the race and I think our customers will love the stuff the vendors are bringing—they will truly appreciate it as well! I can’t speak for all the vendors, but I know several of us are bringing amazing stuff! Autographed pictures, action photos, programs, pins, and hold onto your socks—are you ready for this? 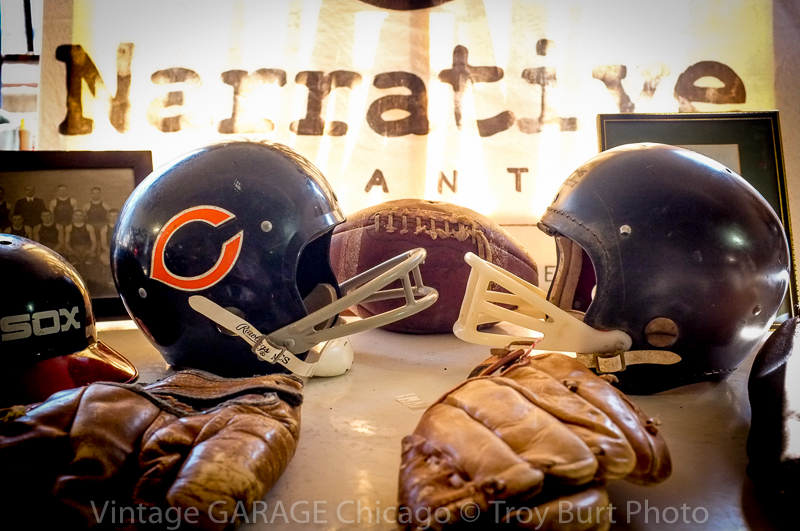 One vendor is bringing an intimate collection from a guy who was a long-standing mechanic on AJ Foyt’s pit crew. This collection is fantastic and includes stuff from rare product placement ads to actual vintage signed Indy car, car parts and pieces. 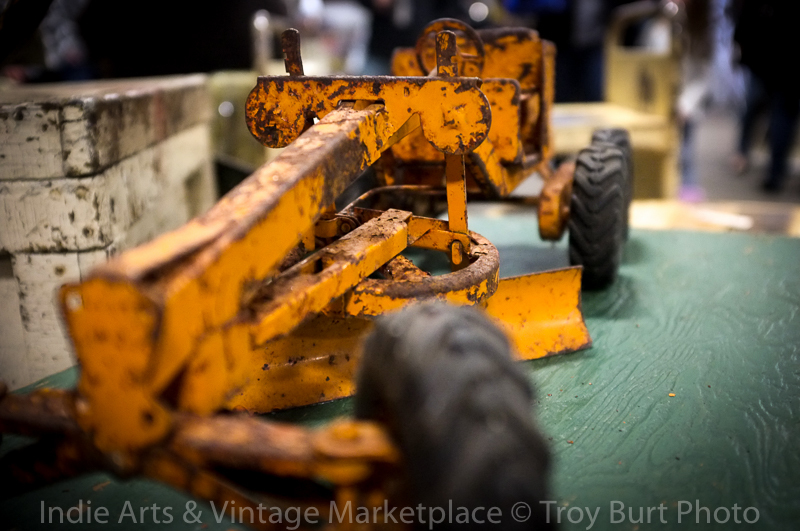 Quite simply, the overall collection the Indie Arts & Vintage Marketplace promoters and vendors have thrown together is specular! And, with a few weeks still to go, more will come to the table. Most of this stuff will be for sale, I can’t say for sure if any of it will not, but the point of it is to showcase and honor that which makes us great. This month, grab that one friend who might not want to come, but would because they like the race. I think they will be surprised. And, even if you aren’t a race fan, you can enjoy the vintage aspect and the rich history the race represents. It’s something new, and I must say, I’m glad the IAVM decided to do this. This April, the Indy 500 will be featured! I can’t wait. So, be there! Tell your friends, share this blog, come to the show, and go to the race! If you’re an Indy 500 fan or just your average awesome Hoosier, it’s something I think everyone will truly enjoy! Her booth is one of those that makes me put my hands in my pockets. 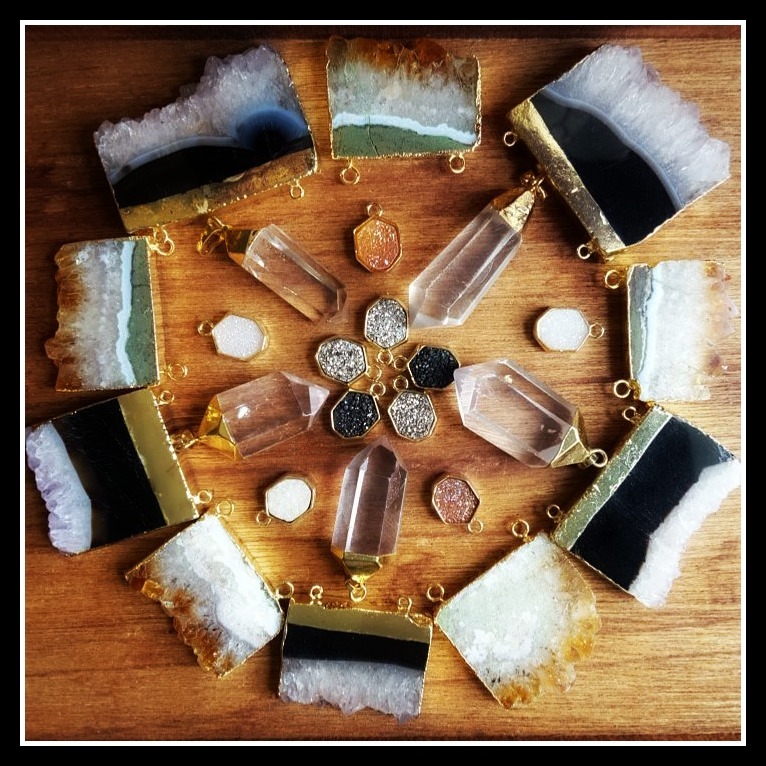 This month’s featured vendor, Katie Fox of the Fox Woman from Urbana, Ohio, as you could imagine, hails to us (each month) from the strange and faraway, “Urbana, Ohio”, the reputed land of good taste and fine things (probably)! 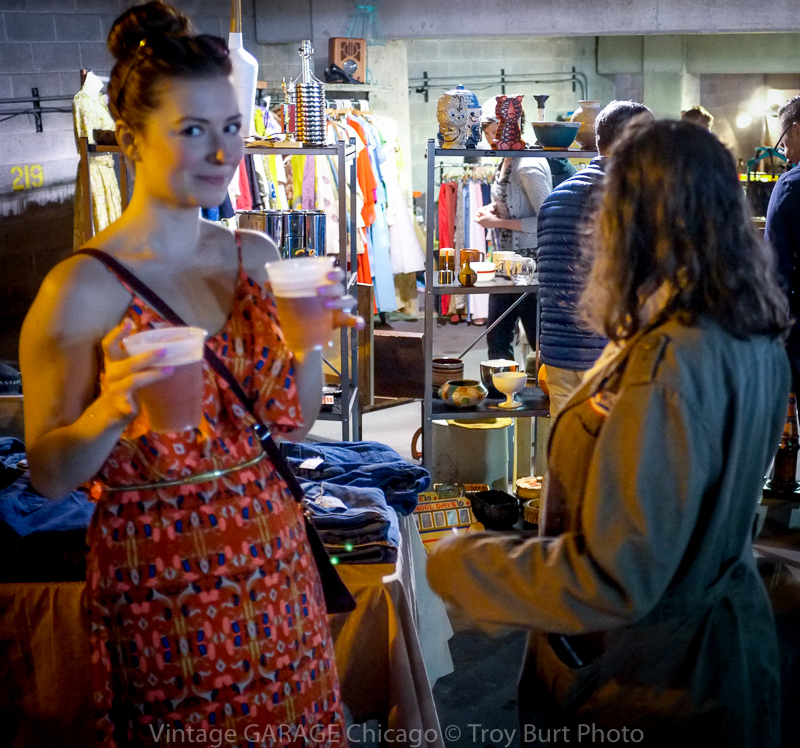 Katie is a long time veteran (means same thing) of the show, the Indie Arts & Vintage Marketplace is so completely awesome because of her and her artisanal & vintage wares, her space has become a defining feature of the event. I am constantly amazed by her talent and eye for design. Her attention to detail and placement when it comes to her display and presentation is what sells her stuff. Her booth looks like living art. I always feel like if I even pick something up I will screw up the mojo of the whole thing! Seriously though, Katie is a real nice lady and would never throw wine in your face. I don’t think. So, thinking about Katie’s business name and her ties to her home, I wanted to do a little research on her hometown and try to tie, maybe, her background to her awesome stuff! Upon opening my Internet search engine and typing the words, “Urbana, Ohio” into the text box (filter out the scourge “Indiana and Illinois”), I was greeted with the phrase, “Seated in Champaign County”! Ha! I knew it! La Urbanites! Champions de Urbana! She’s French! That explains everything, I think! 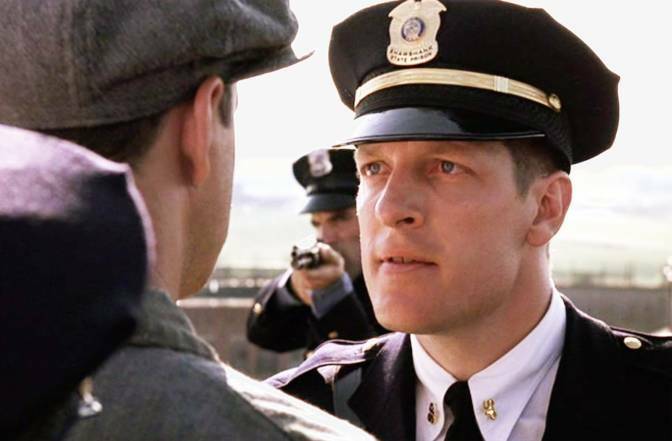 Clancy Brown was born there too so that helps, but Viva Las Vegas! That was all I needed. Plus, I never try to do actual research for these things. I’d rather let the vendors and photos speak for themselves. But, rest assured she’s from good people and French or not, Katie Fox of the Fox Woman from Urbana has uber-cool, awesome stuff! I will admit this too; I always admire Katie’s always changing inventory. She never compromises quality and I always look over her booth carefully to see what’s new. I think lots of us strive to have the kind of wares she carries. She’s on the cutting edge of what’s cool. Katie Fox of the Fox Woman from Urbana, what’s special or unique about the items you bring to the Indie Arts and Vintage Marketplace? 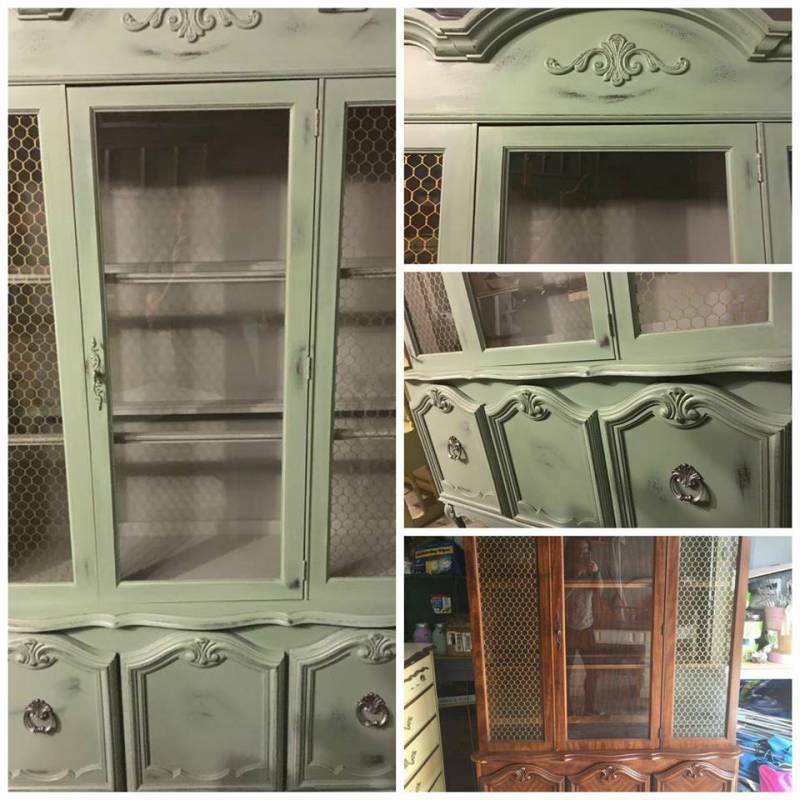 I sell an eclectic mix of furniture and unique pieces that I think will differentiate my customer’s homes from those of their peers. Anyone can go to a popular home store and buy the same types of things that have been mass-produced, but when you surround yourself with things you truly love that are one of a kind, you take so much pride in that. When I’m buying, I’m always thinking, “Would this be a good conversation piece?” I want the items I sell to represent something very special. My end goal is for those who buy from me to feel joy when they look at that item, and for friends and family to ask, “Where did you find that great piece?”. For this reason, I normally only have one item of most everything I sell, and it has been specially handpicked and prepared for your home! And, how do you decide what to bring? Hmm, this is a hard one. I always want to change up my inventory between shows, but this can be hard sometimes due to financial limitations or time constraints. Those who have bought from me know that my booth next month can look very different from the month before (and so can my apartment, lol!). I try to be pretty strategic about mixing things up and if something isn’t working, I might even change my entire look for a while. The important thing is to keep the creativity flowing, so reworking a piece that hasn’t sold, figuring out new displays, adding new or necessary elements, those are all important! I can honestly say I really do handpick each item that will come with me to the next show. Sometimes I obsess over it, ha-ha! I have been doing IAVM since it started, and that has really helped. 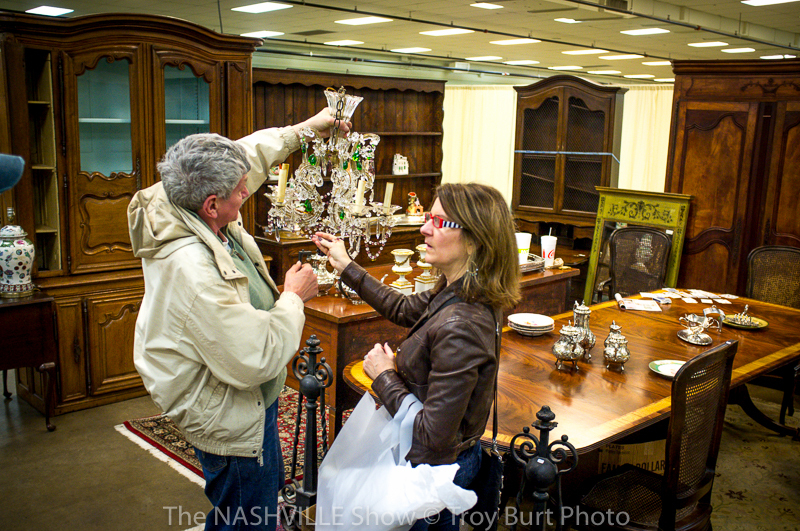 Consistently having a presence at the show allows people to connect with you and your items, and gives you a chance to observe what is selling and gaining interest. I would say my price range is anywhere from $5-$500. I try to keep things affordable because I know there are a lot of young families who shop this show, and as a mom of two I know what it’s like to decorate on a budget! If there is one item your customers must have, it would be ___________, because__________? Ooh this is tough! I’m going to go with the handmade Guatemalan pillows I’ll be bringing to the next show because they remind me of my love for travel and adventure! What do you like most about your customers? I love how my customers are so encouraging and supportive! This is a tough business to be in because it’s so easy to compare yourself to everyone around you and feel inadequate or that you are falling behind. It makes my day when a shopper introduces themselves or when a repeat customer tells me what they did with a piece they bought from me! Aside from the photos and my praising, you can tell by her words Katie is passionate about the Indie Arts & Vintage Marketplace! Thanks again, Katie Fox of the Fox Woman from Urbana! And, thanks for reading! Hope to see you at the next show!